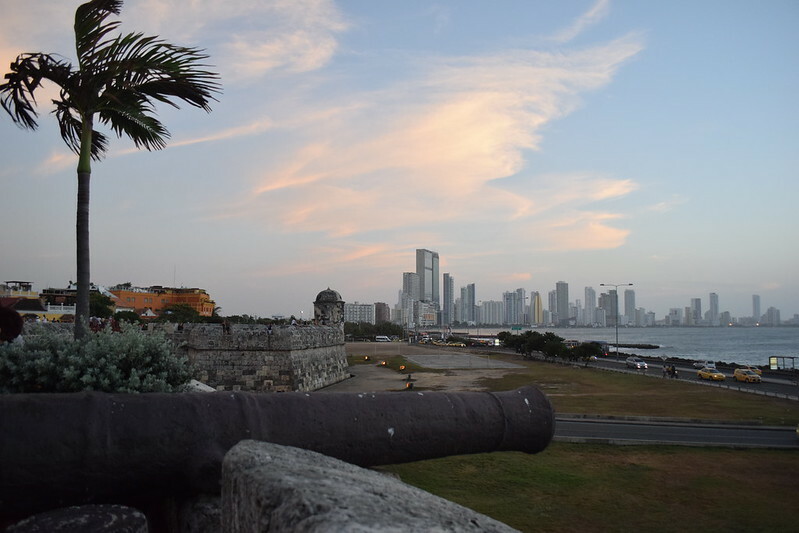 Anyway, this flight hiccup meant that I also only had 24 hours in Cartagena before my flight to Medellin. 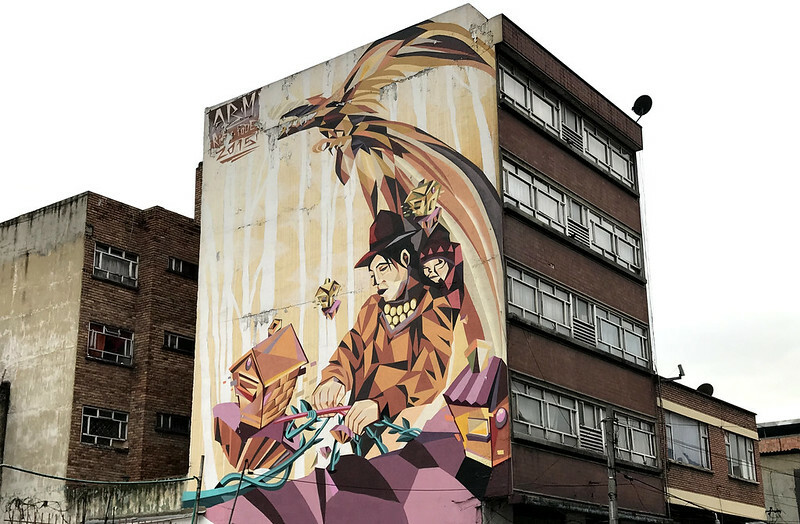 I tried to see as much as possible in the time, but it definitely made me realize that I’ll have to return to that region again someday. 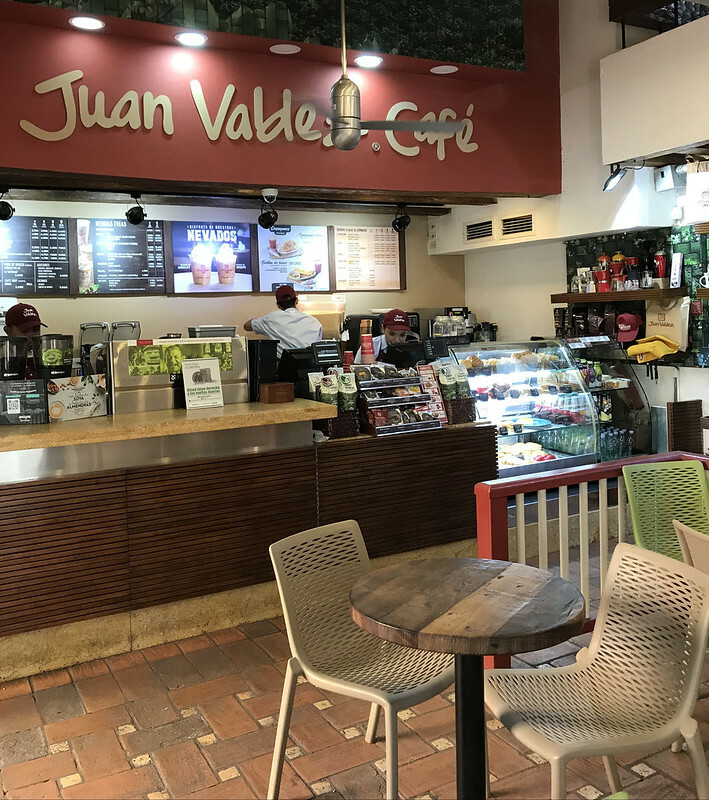 On a more positive note, as fate would have it, because of the delay, I ended up bumping into an old friend at the airport in Ft. Lauderdale. 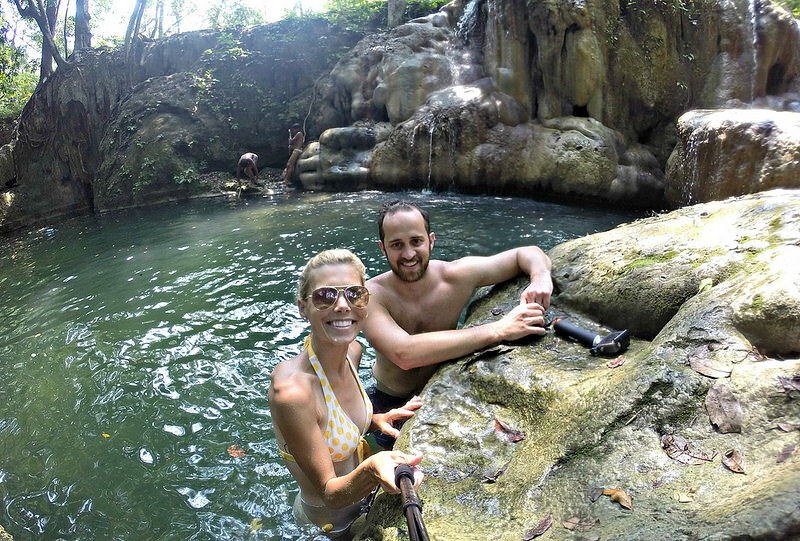 We met two years ago while traveling through Belize. 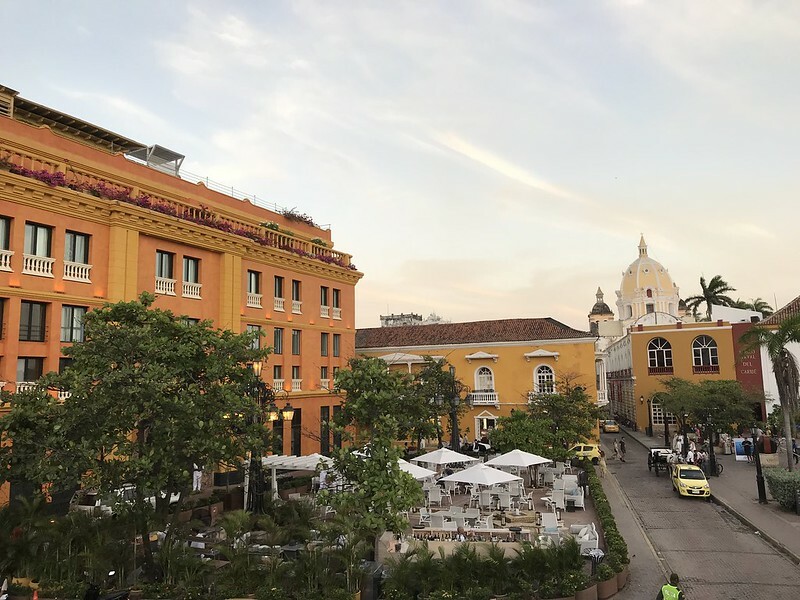 I was able to share a taxi with him from the airport to the city center and do a bit of exploring together that night as well. 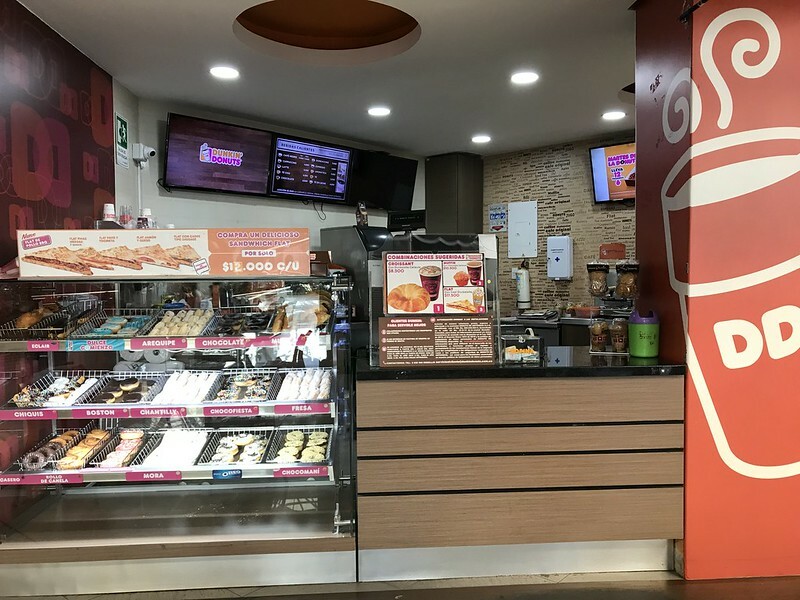 Side note: It’s easy to exchange USD for Colombian Pesos at the airport. 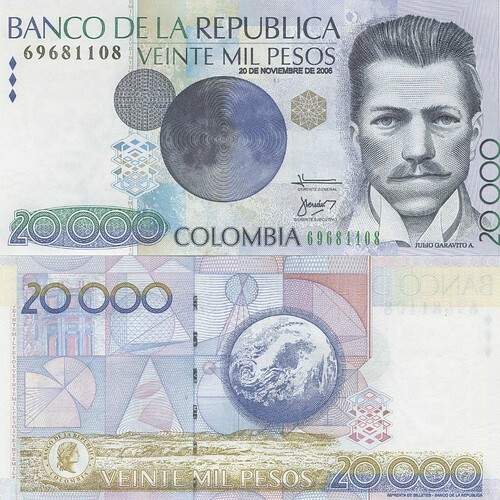 Do know that the money is a mix of old and new bills, so the same value of currency might be a multitude of colors. 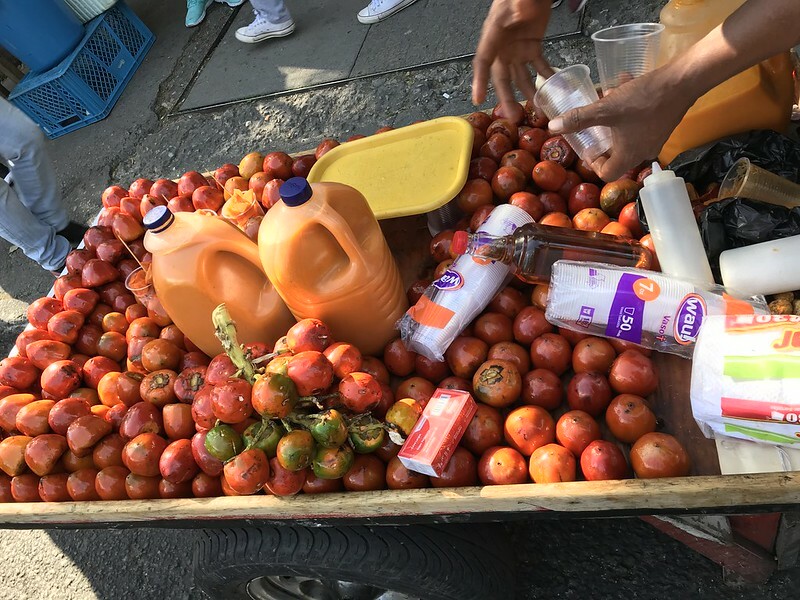 Just double check the amount you are giving before you pay for anything. 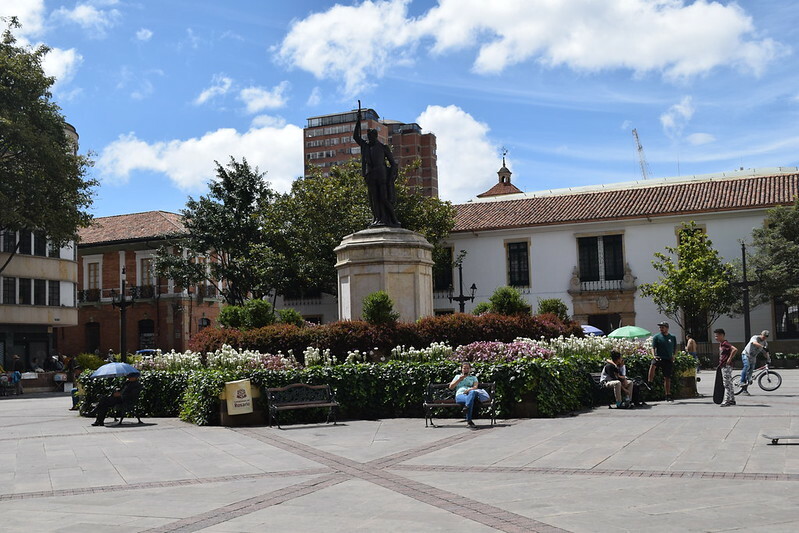 The current exchange rate was around 1 USD for 3,100 Colombian Pesos. 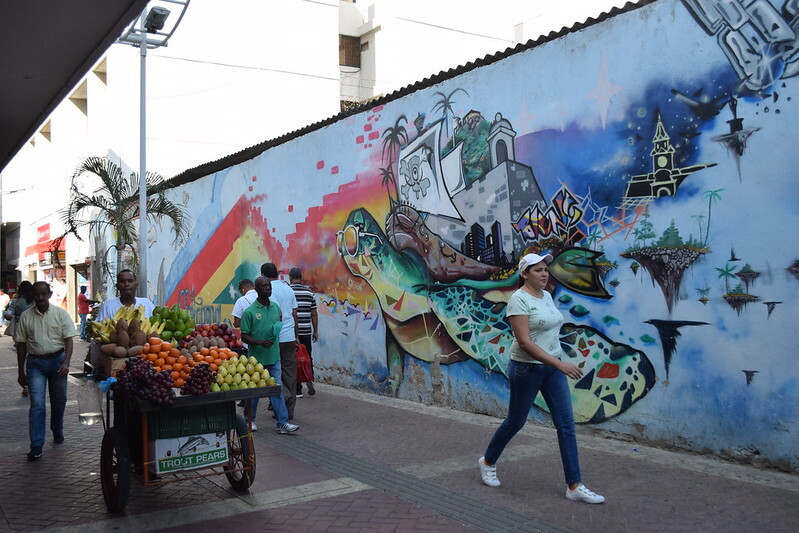 Because of the historic slave trade, Cartagena is an area with a high population of Afro-Colombians. 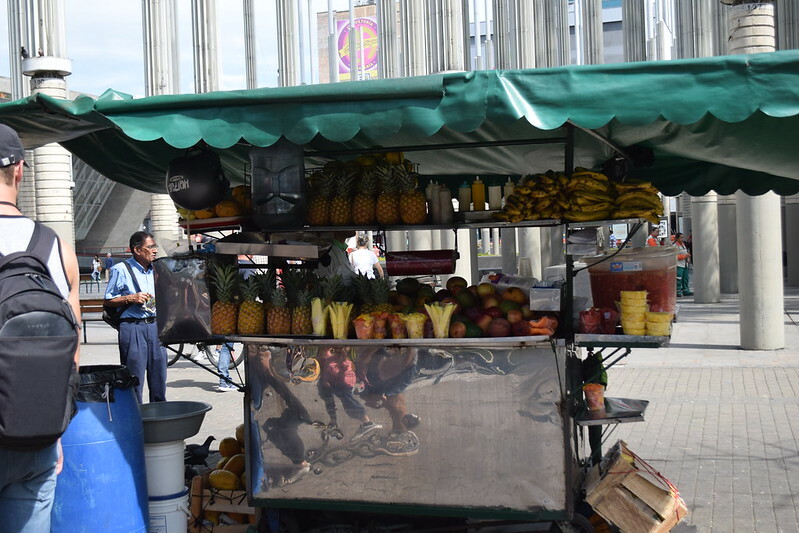 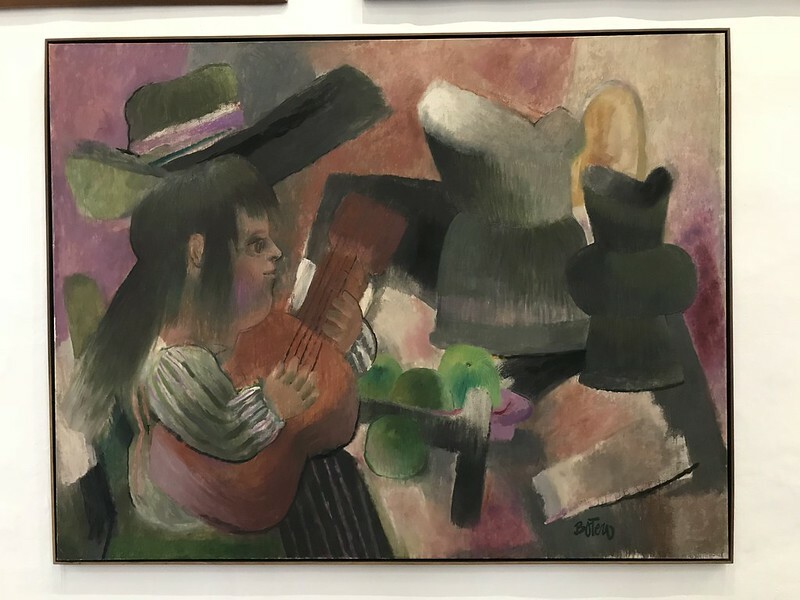 Notable women in the region are Las Palenqueras, or fruit sellers that wear colorful dresses, gracefully balance their goods on their head, and sell their tropical bounty in the streets. 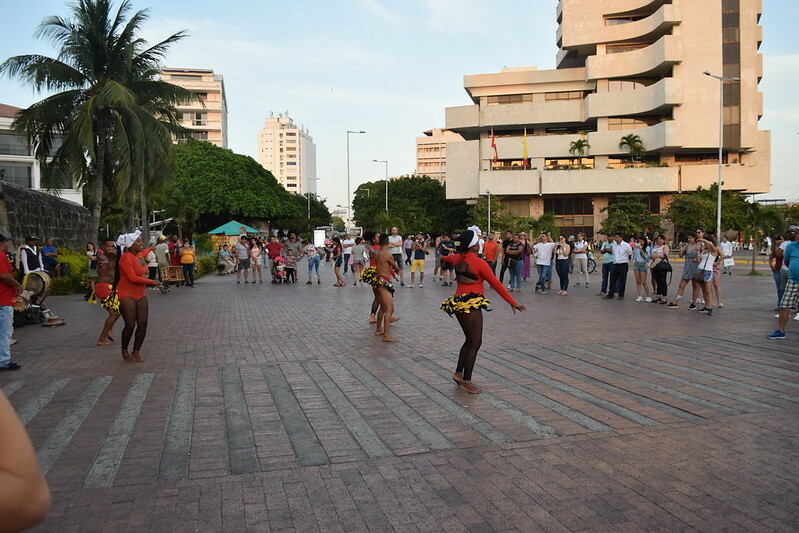 They also connect with their heritage through regular cultural performances. 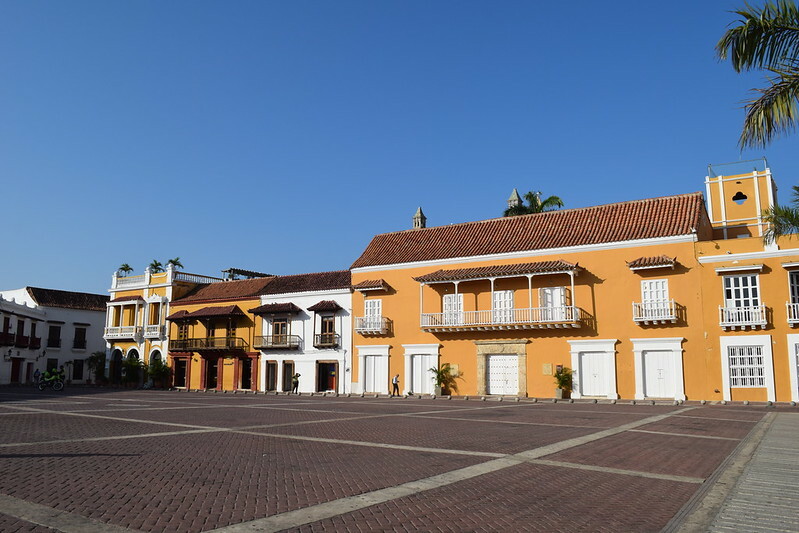 Because it was such an important trading port, Cartagena was also under attack quite often by pirates and the like. 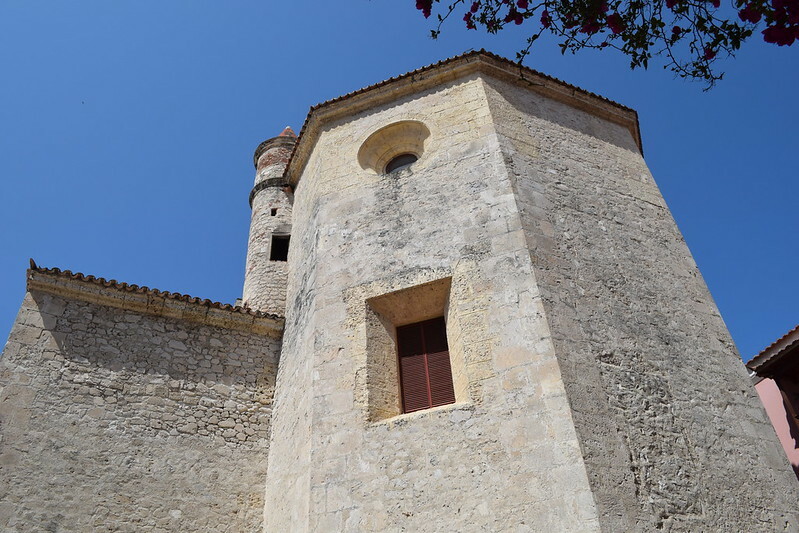 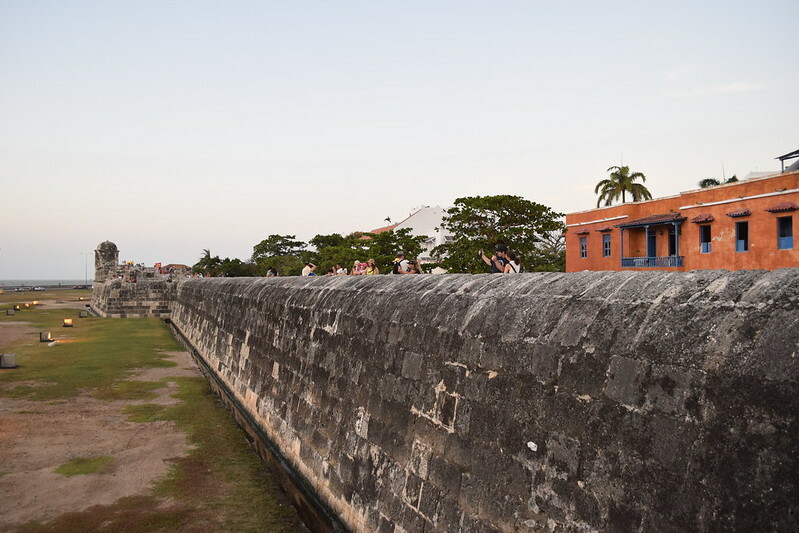 As such, the city has a large fortification wall around its center, and even the church had an opening for a cannon to shoot out EXPLOSIVES at intruders! 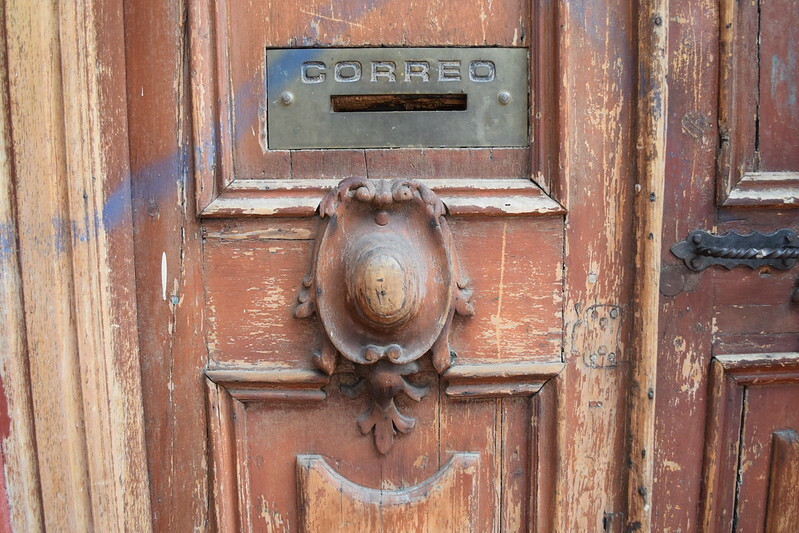 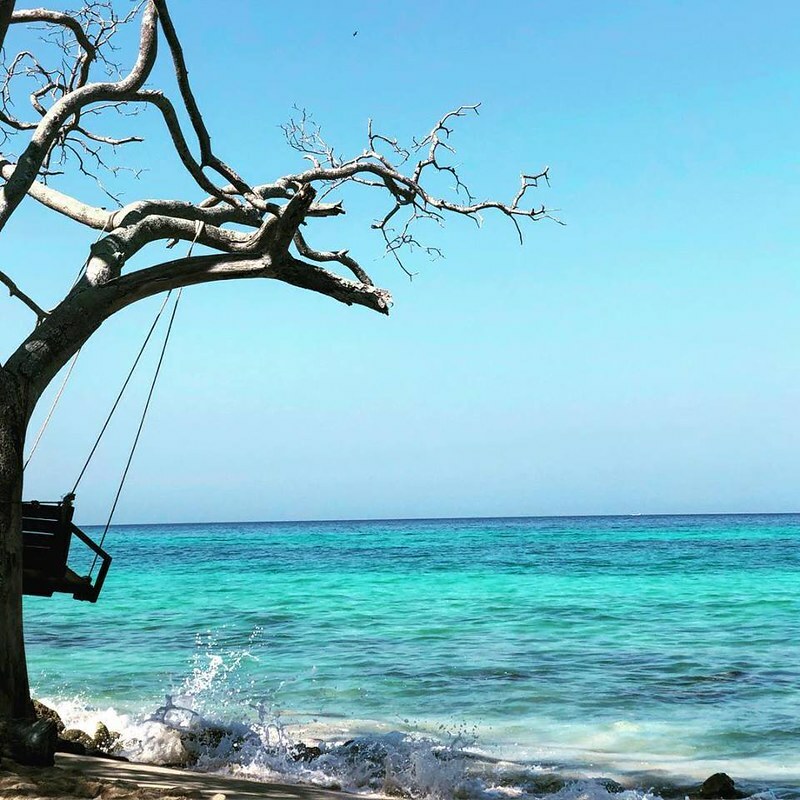 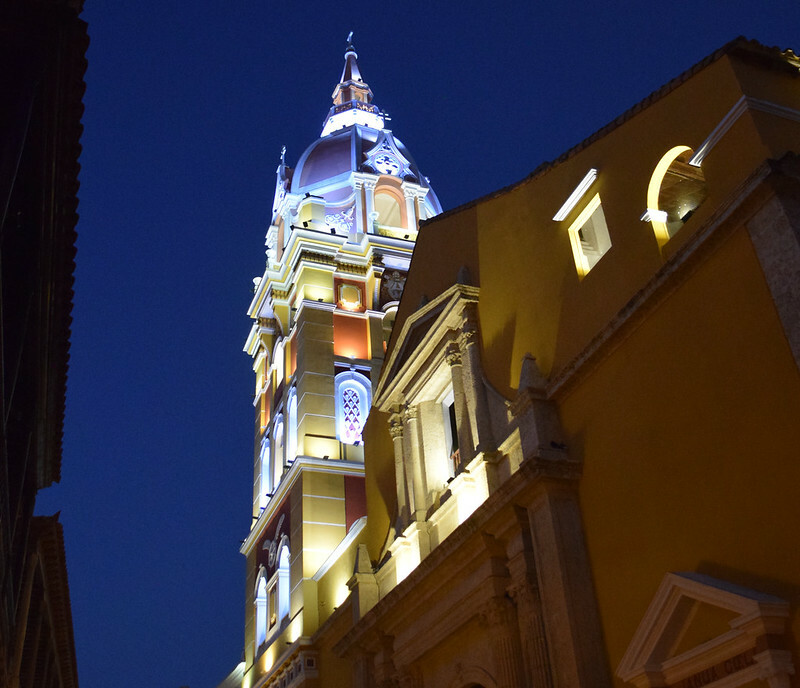 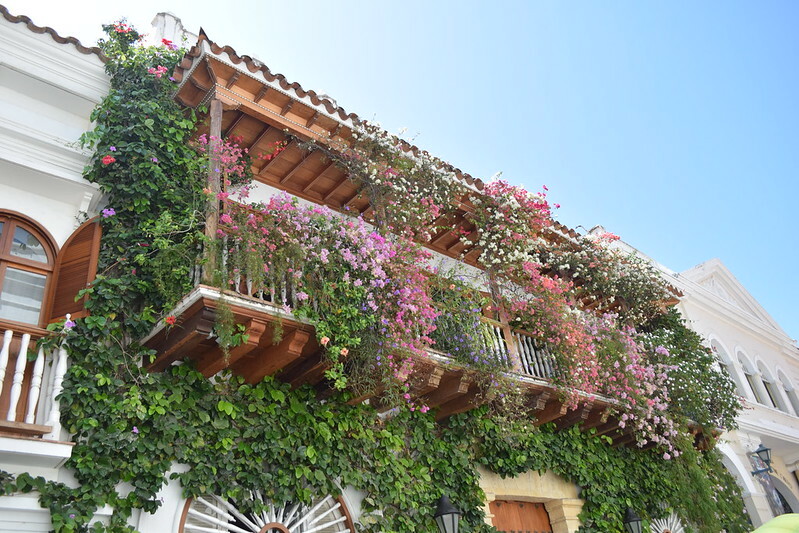 Cartagena is not only focused on historic architecture though. 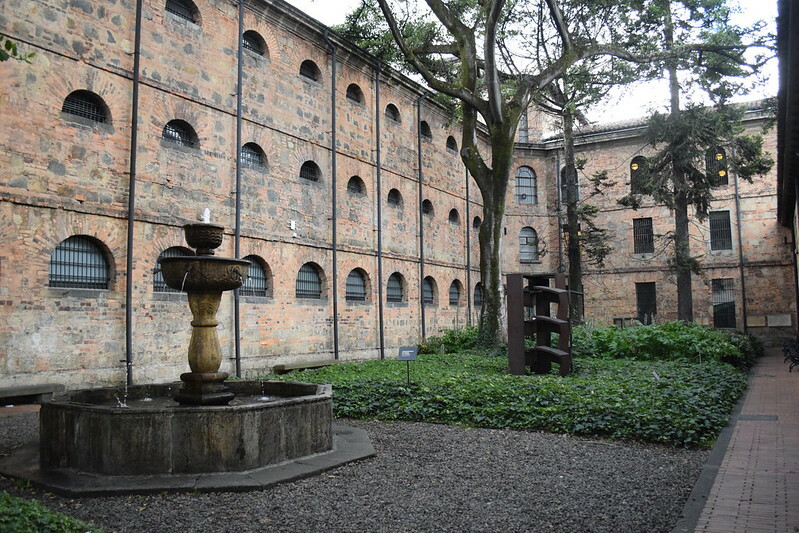 It is also a place of creativity and innovation. 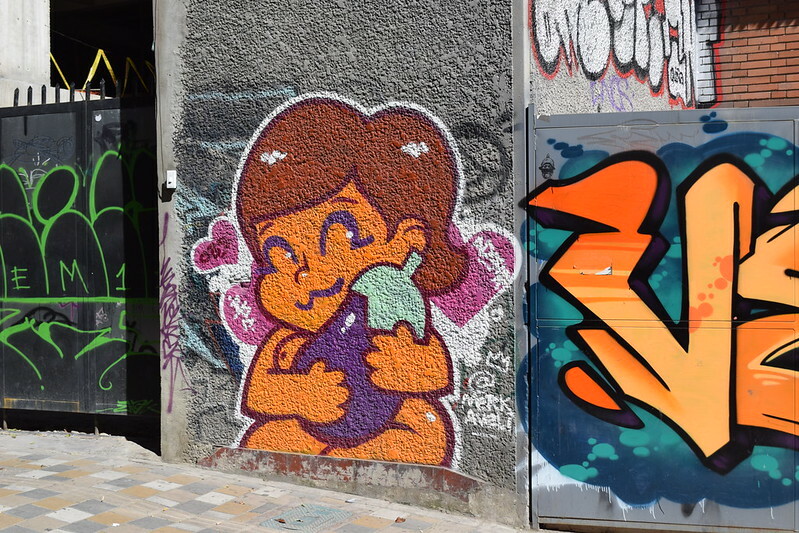 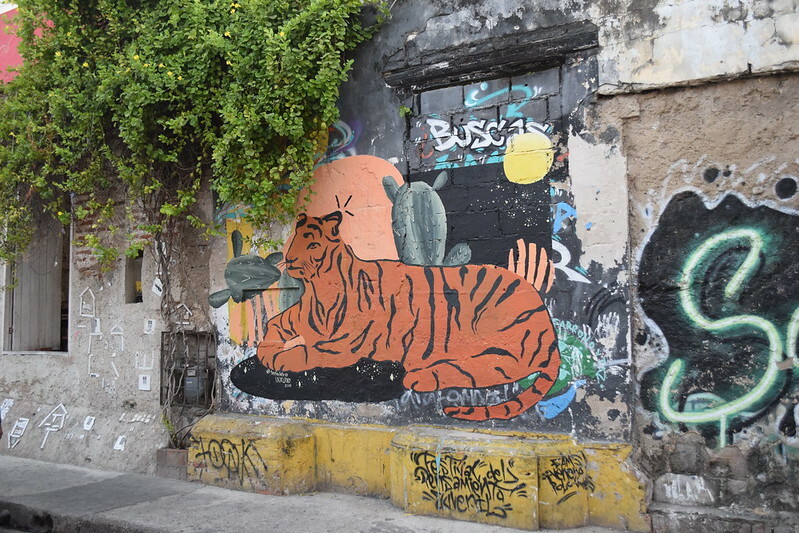 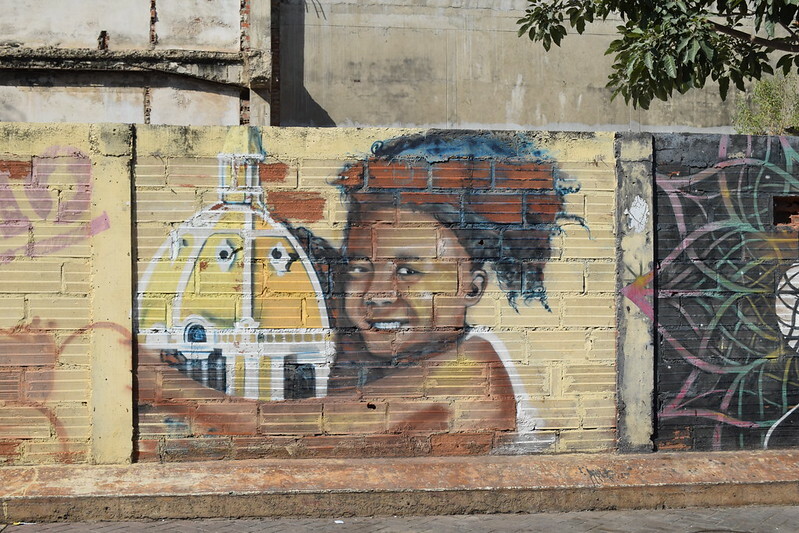 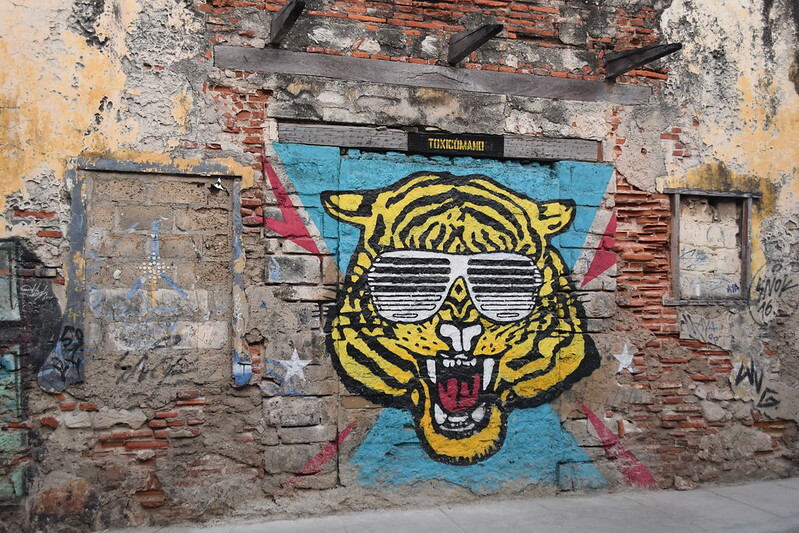 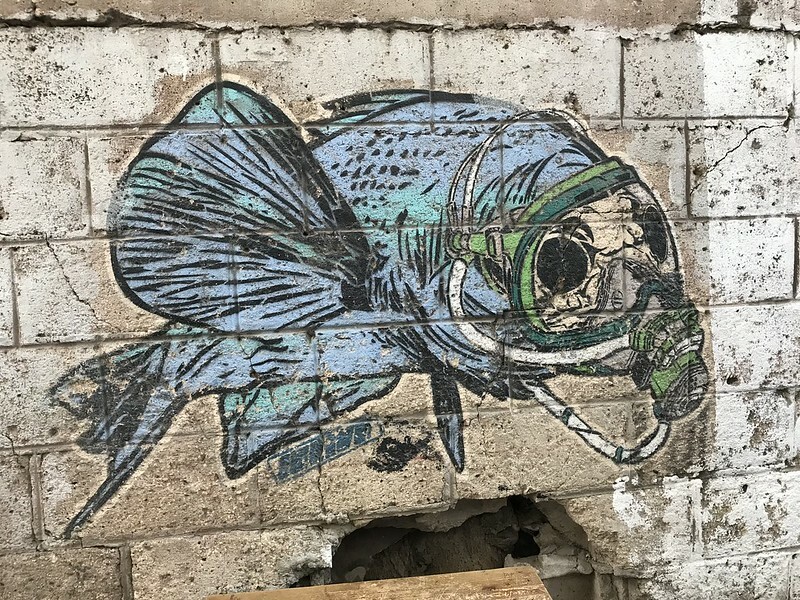 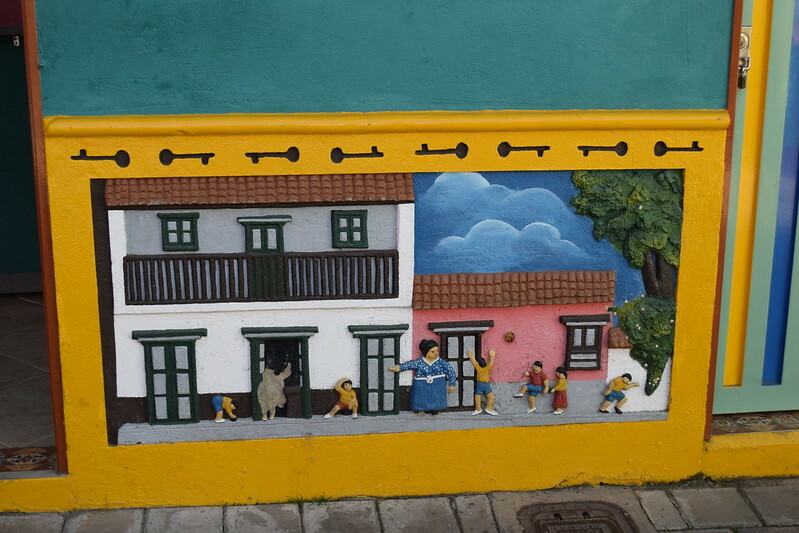 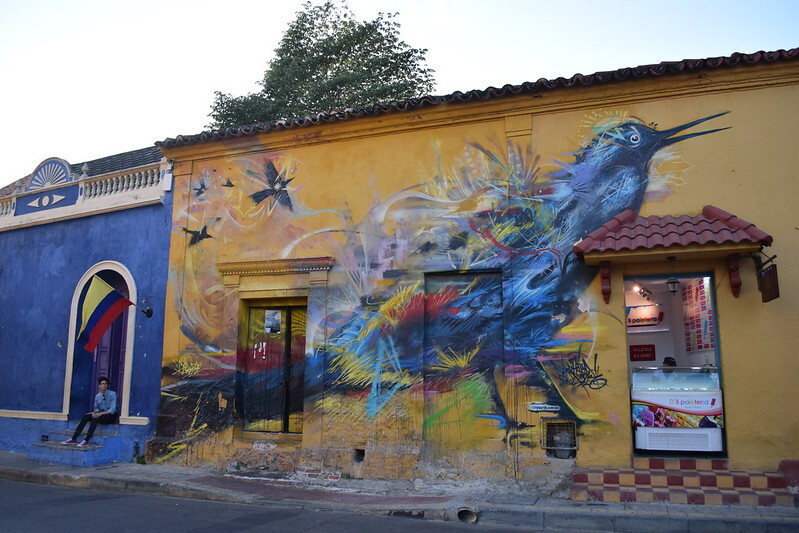 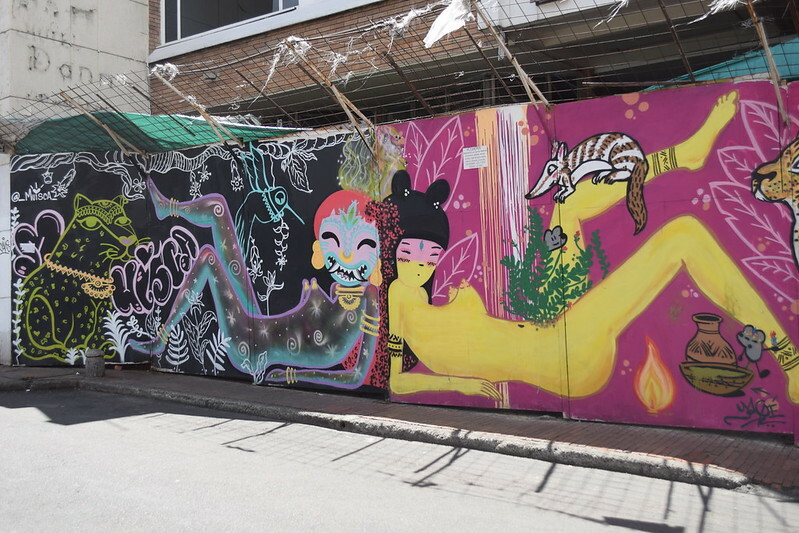 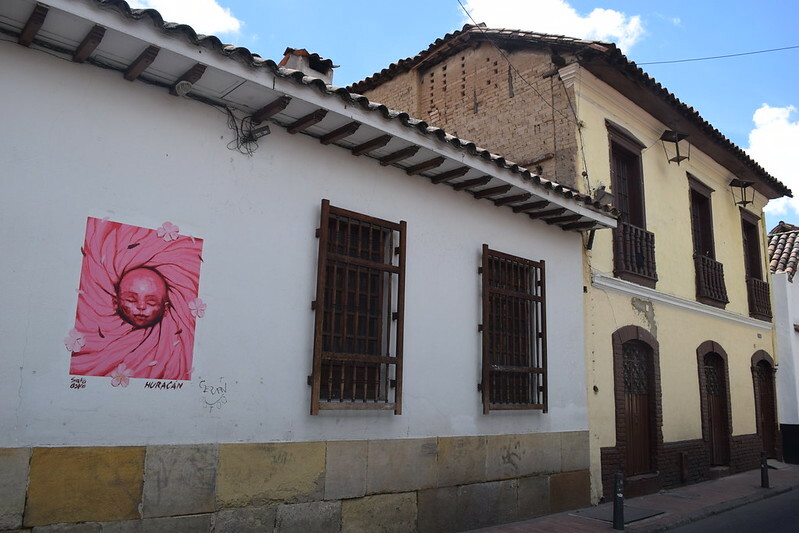 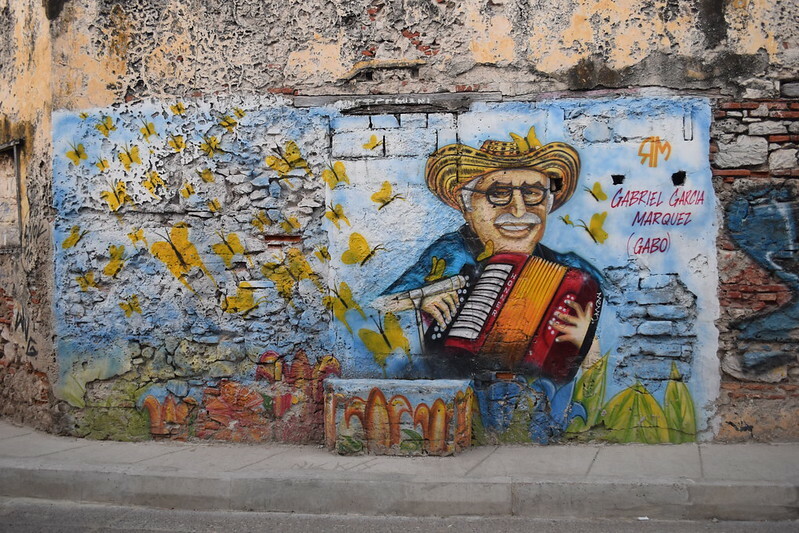 Like the two other cities of Medellin and Bogota, Cartagena also has an area full of quirky street art. 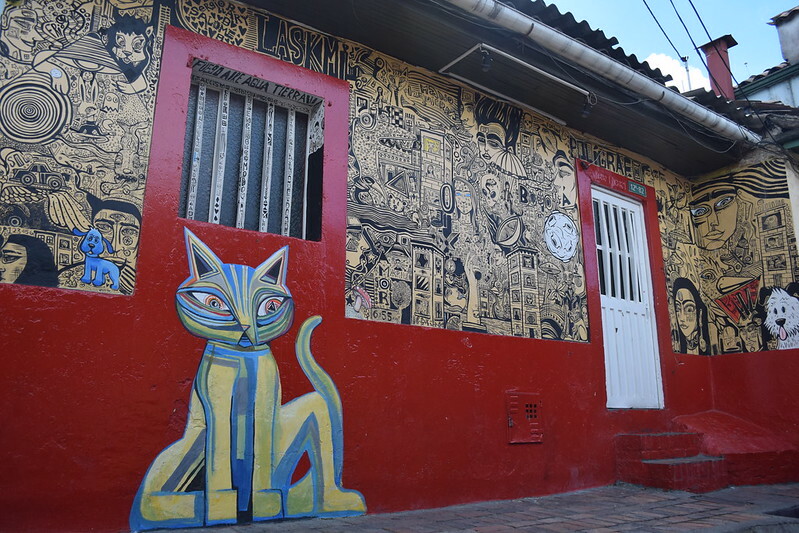 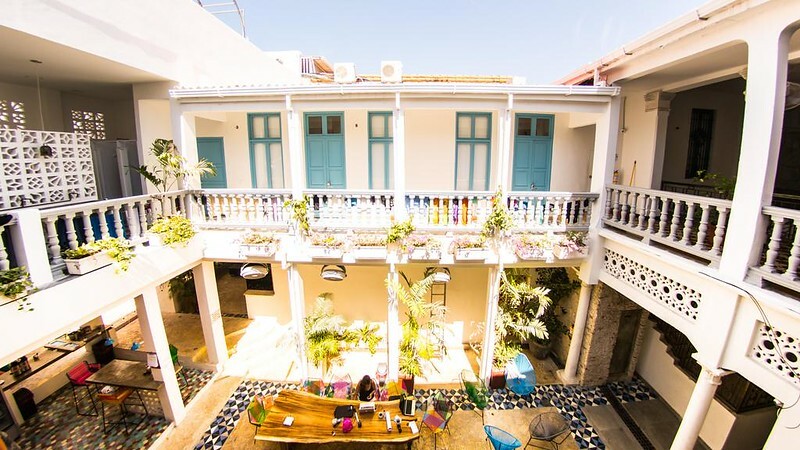 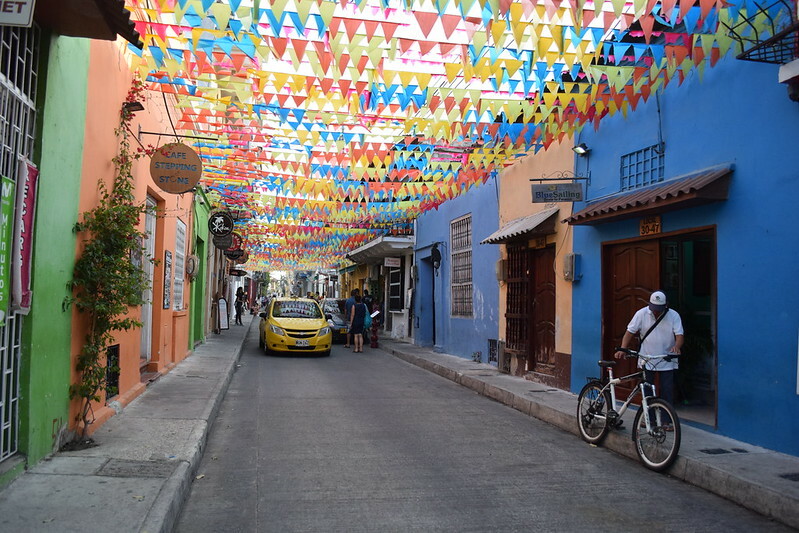 This vibrant bohemian neighborhood, where tourists and locals come together, is known as Getsemani. 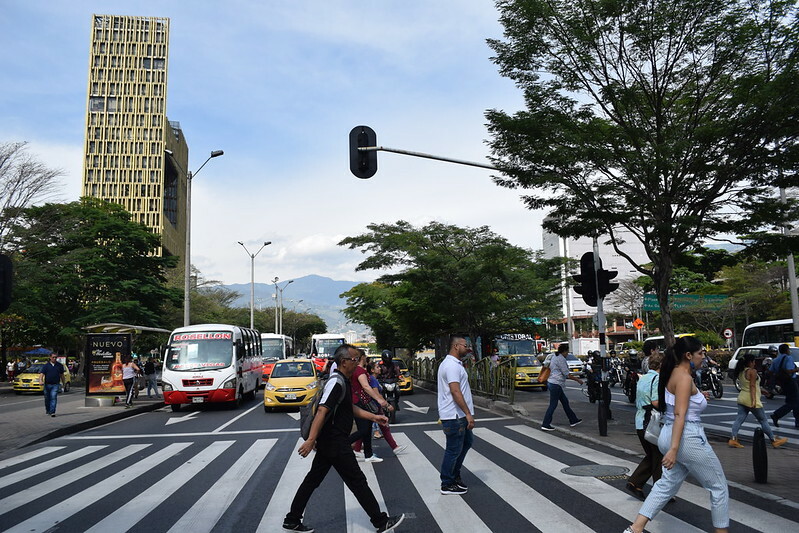 Fun fact: the Colombian flag shares the same colors as Ecuador and Venezuela, because they used to be a part of the same territory during the 19th century called Gran Colombia. 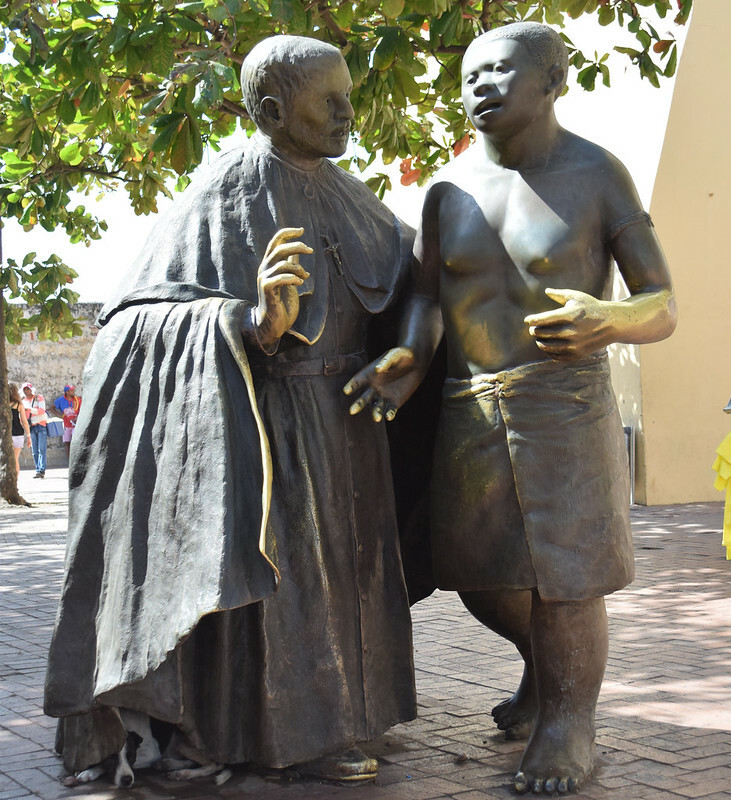 This union helped them achieve independence and overthrow the colonial rulers. 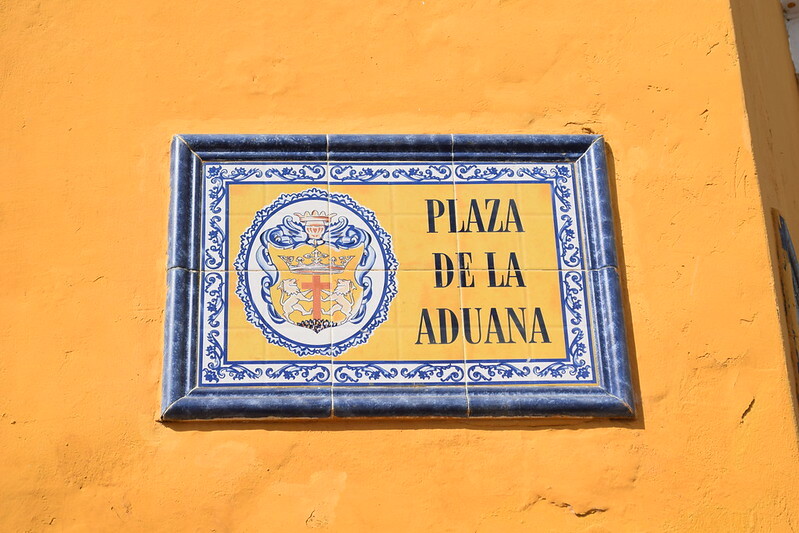 The yellow represents land, the blue represents sea, and the red represents the bloodshed that helped them gain freedom. 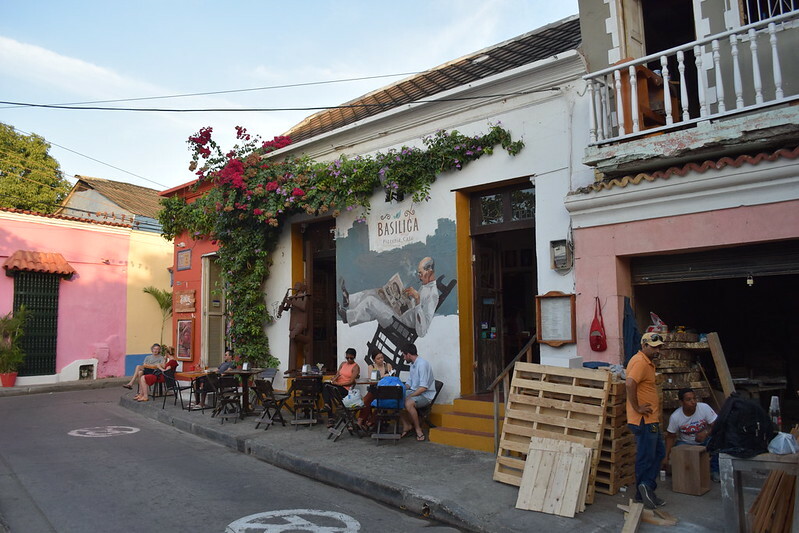 In this area, I found cafes spilling out onto the sidewalks and musicians performing in the streets. 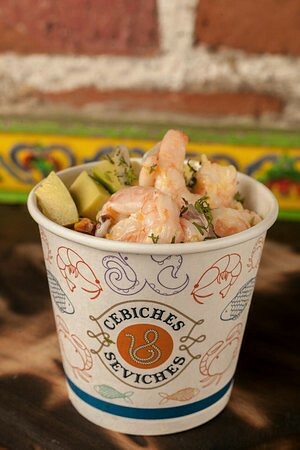 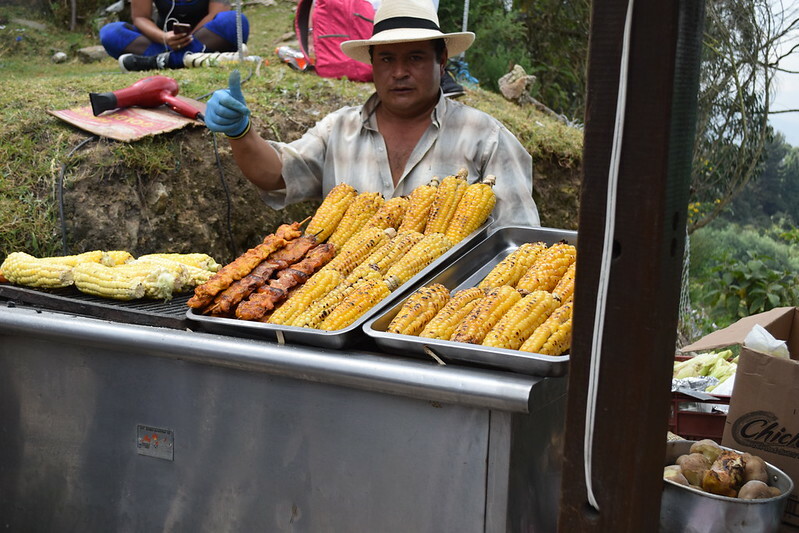 My favorite part was the charming food vendors with their personalized food carts and charisma to boot. 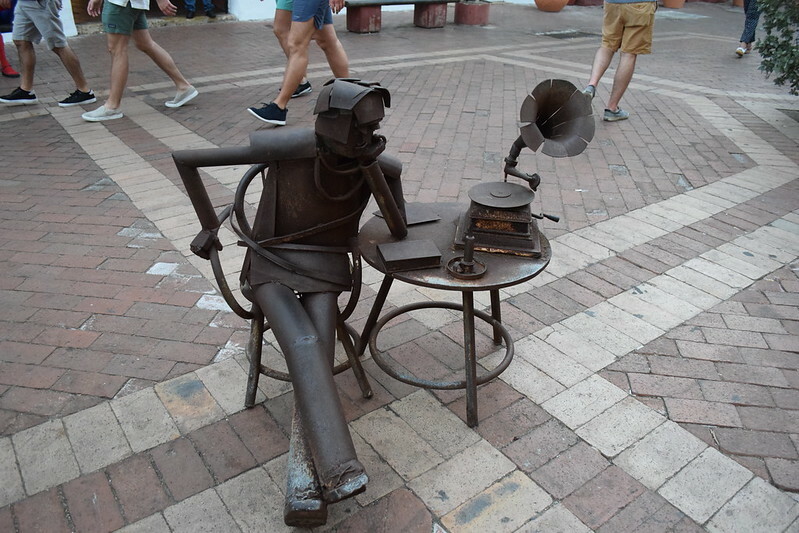 I think these metal sculptures sum up the laid-back mentality in Cartagena very well. 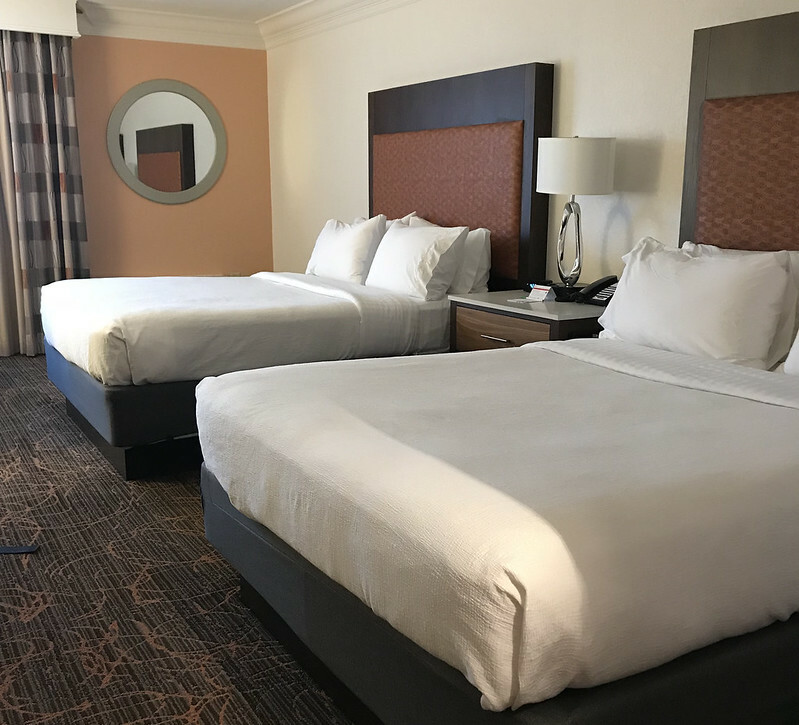 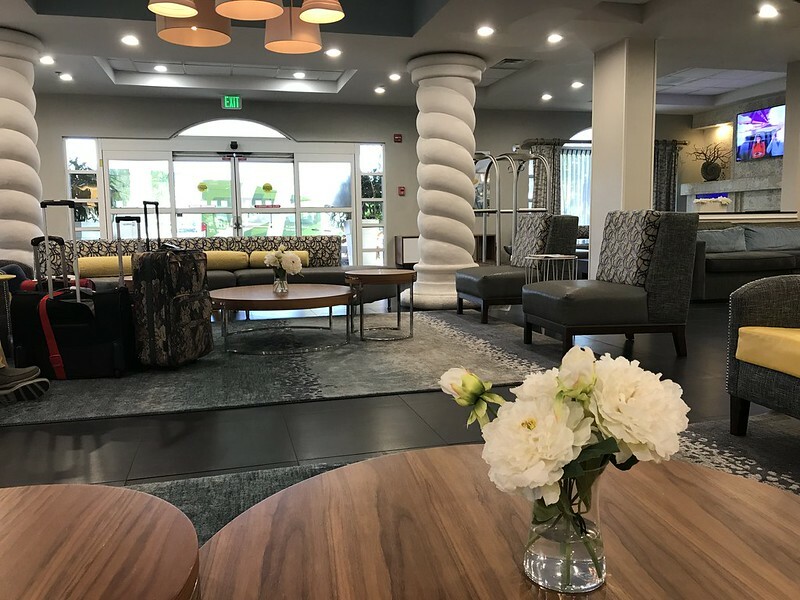 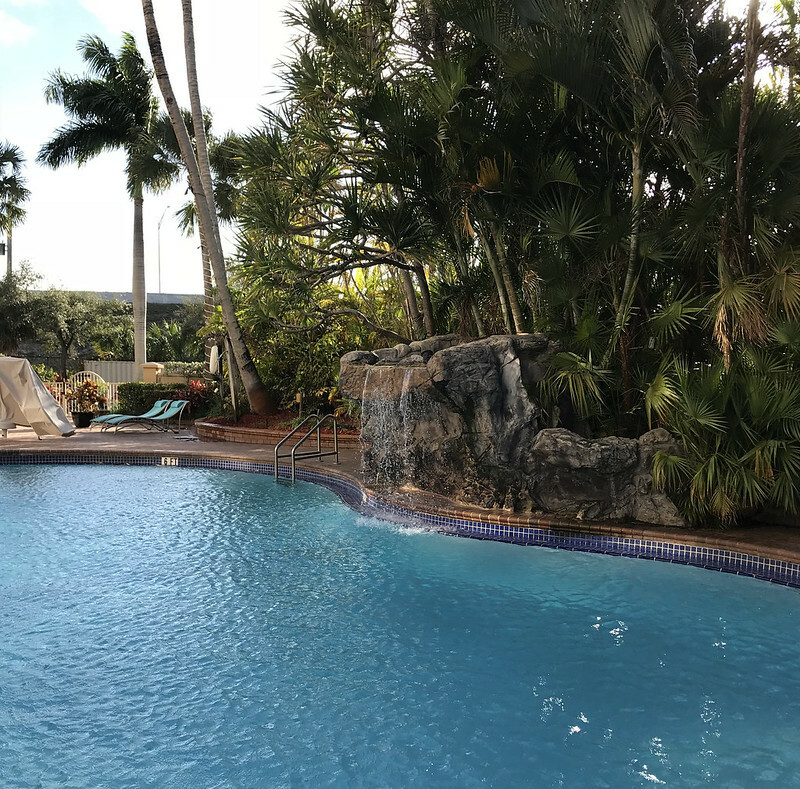 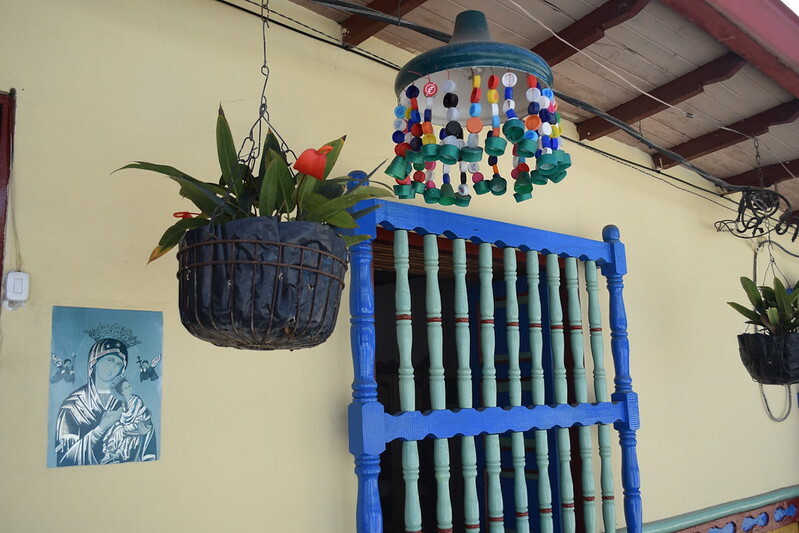 It is a place that values both relaxation and socialization. 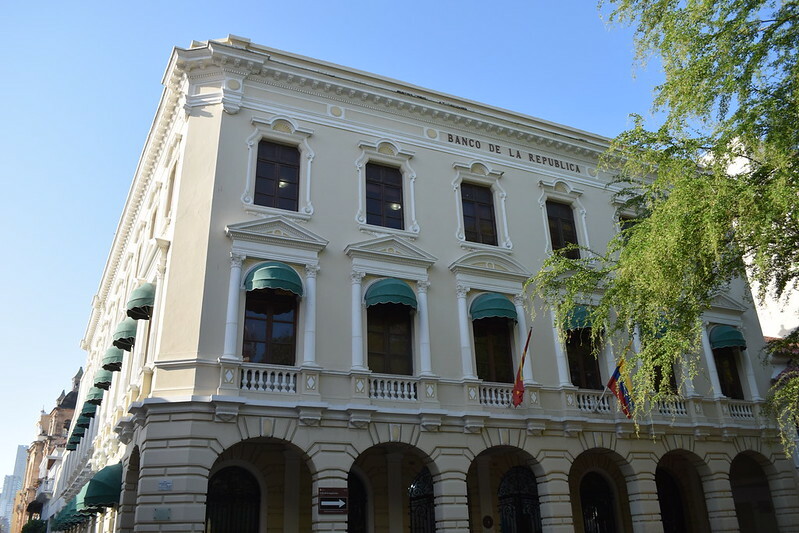 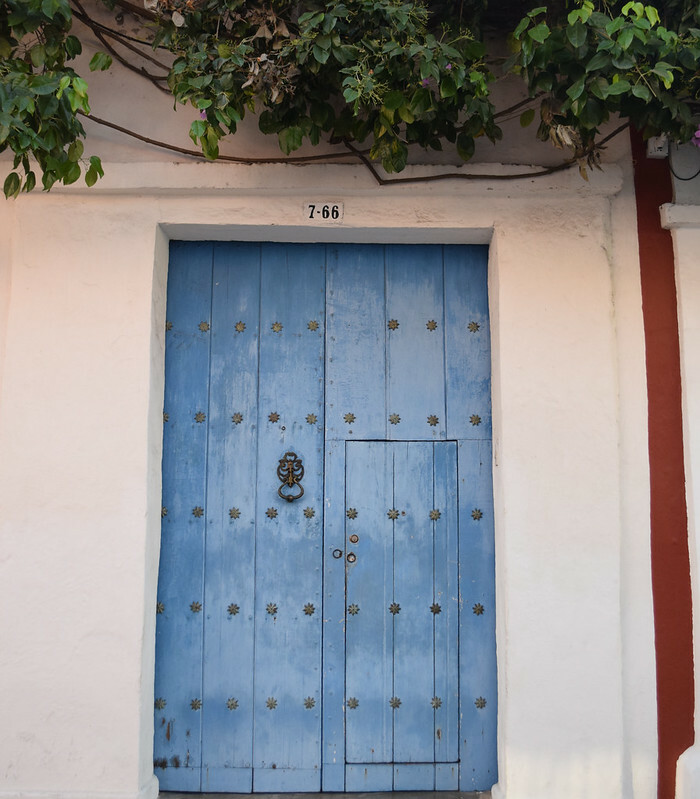 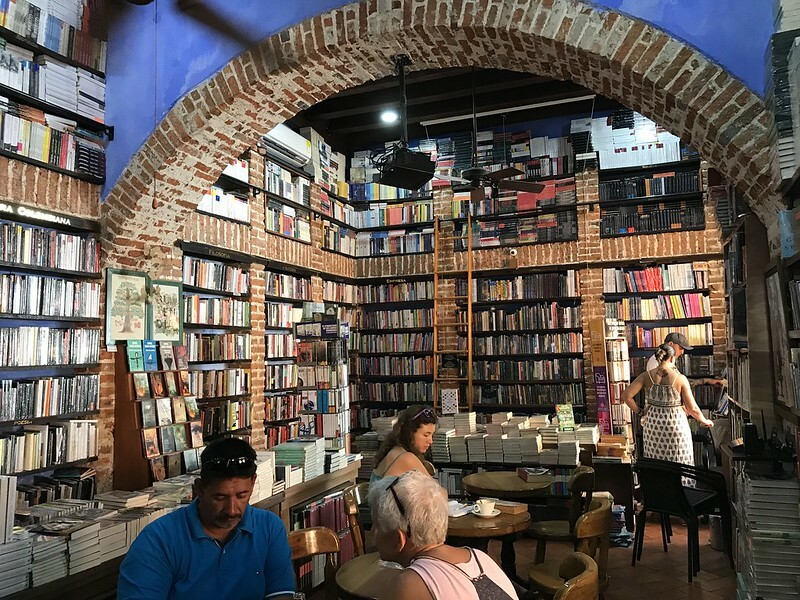 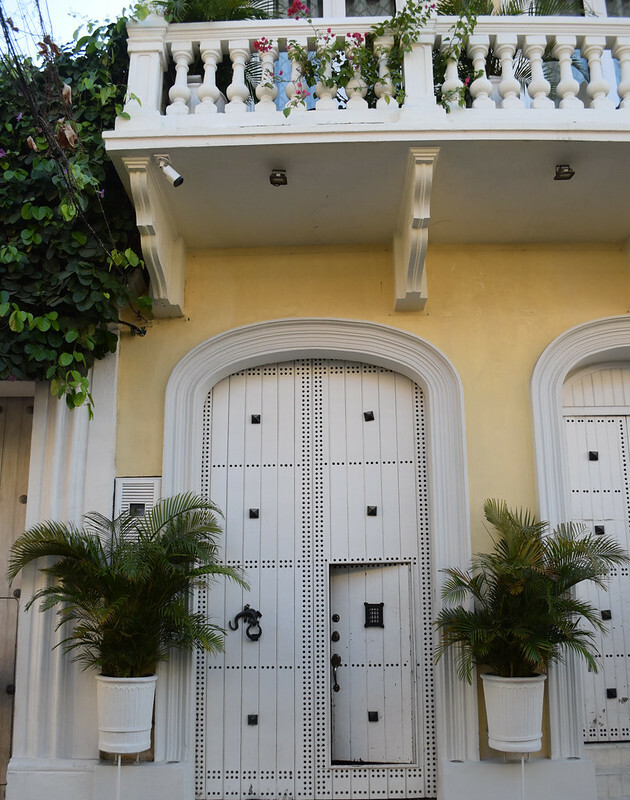 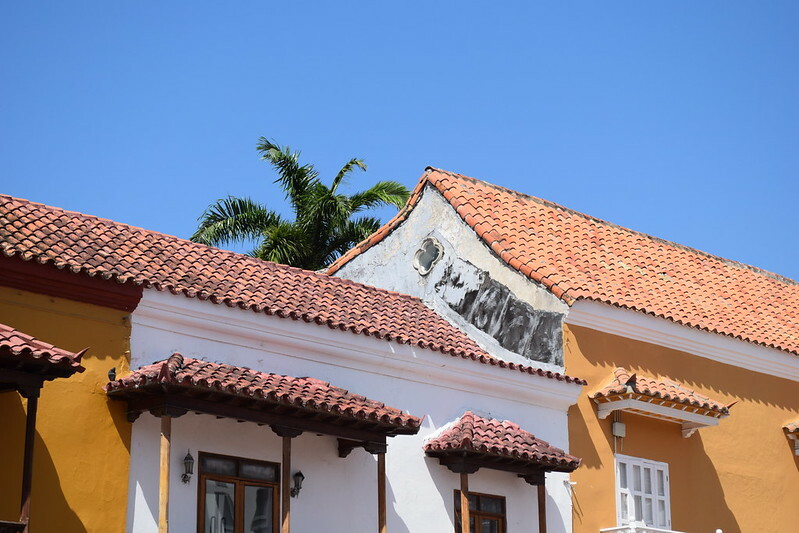 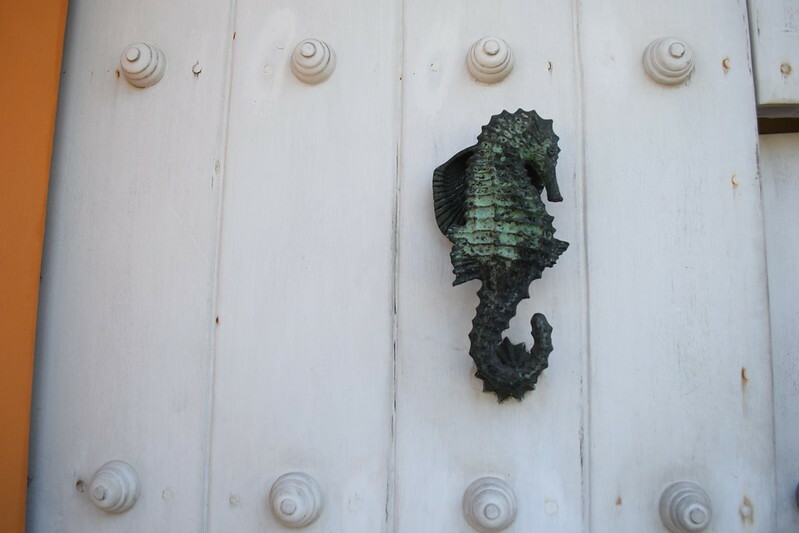 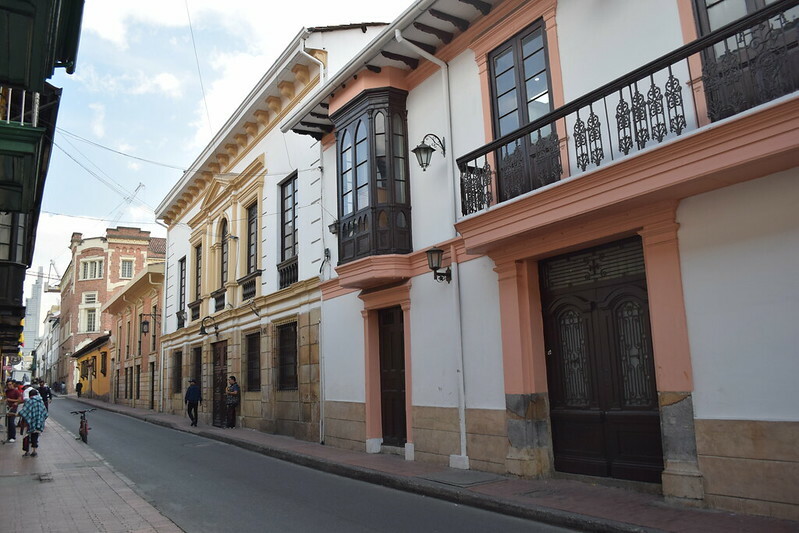 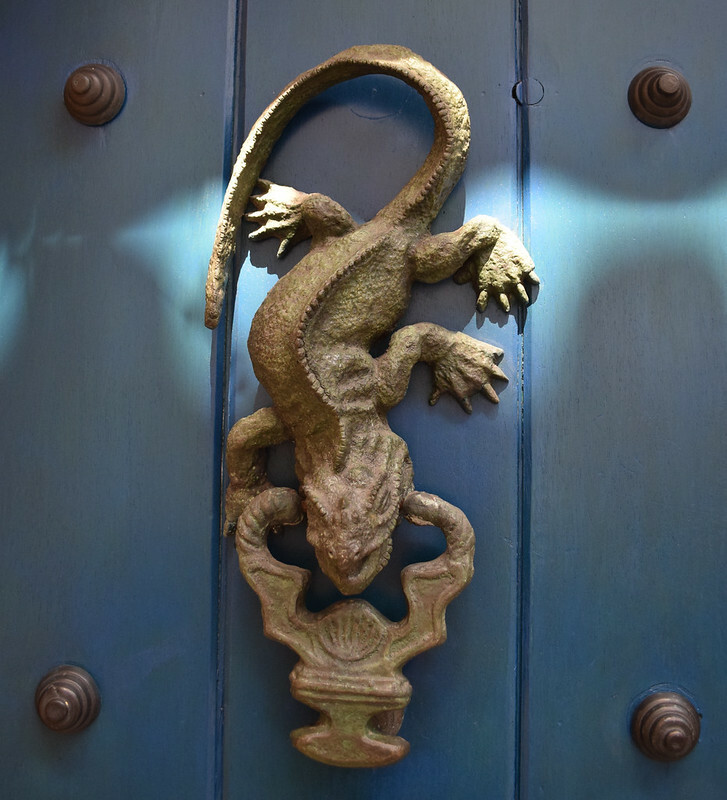 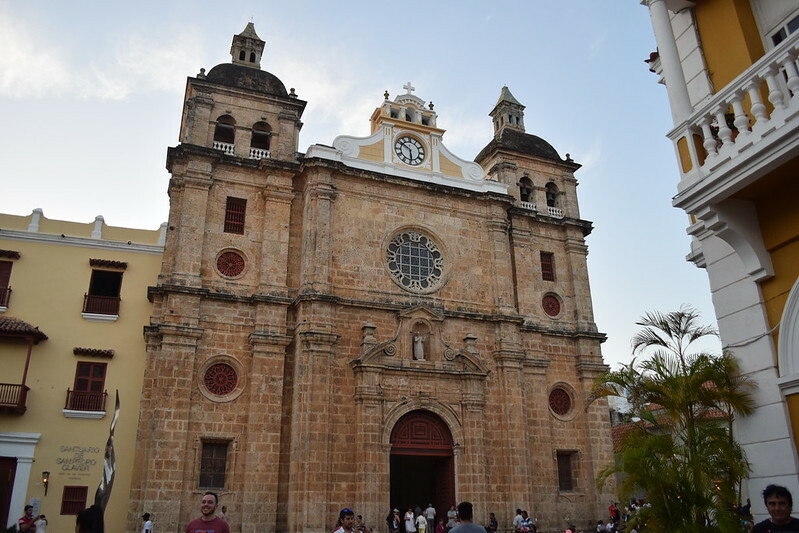 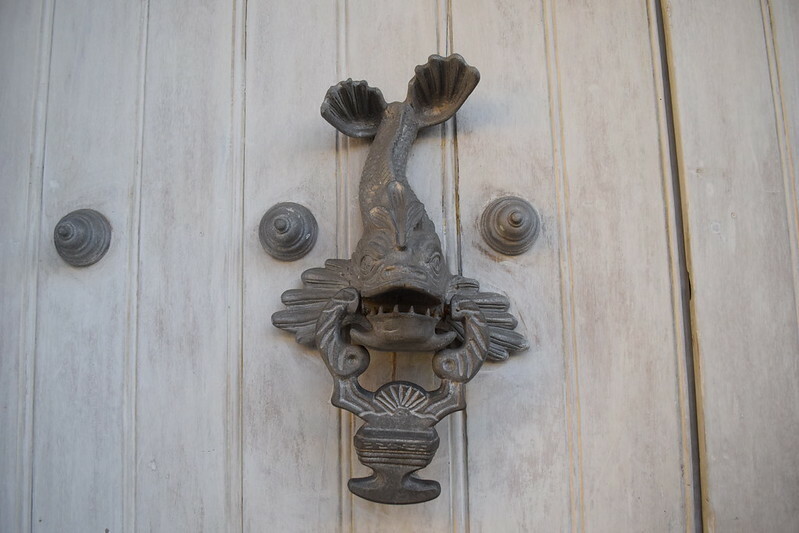 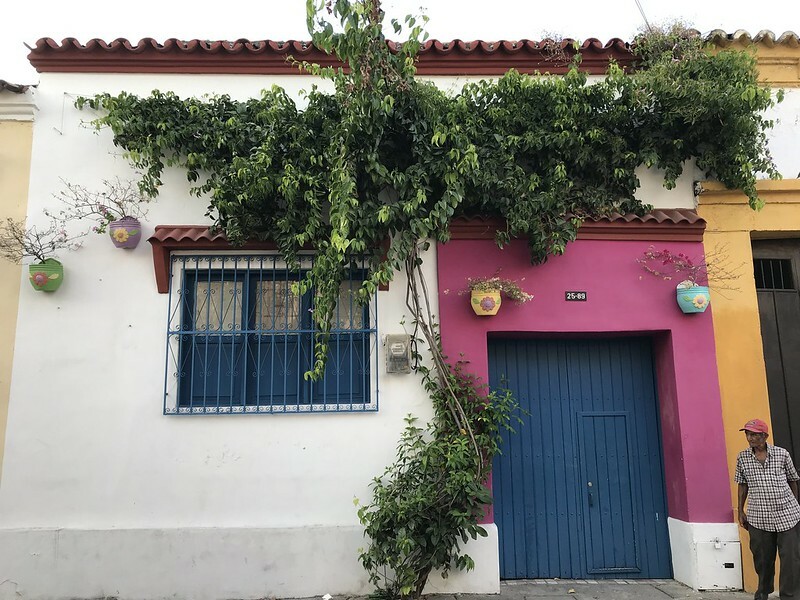 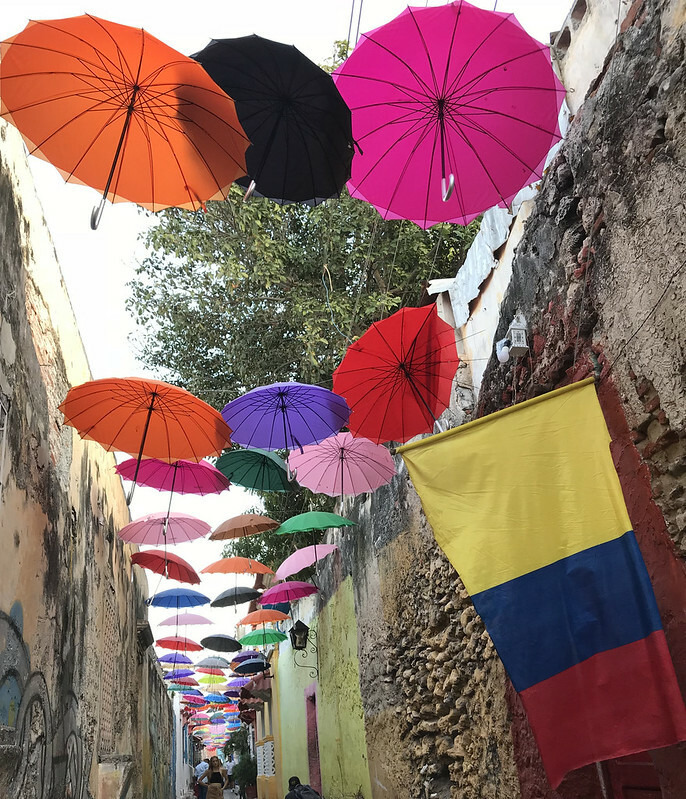 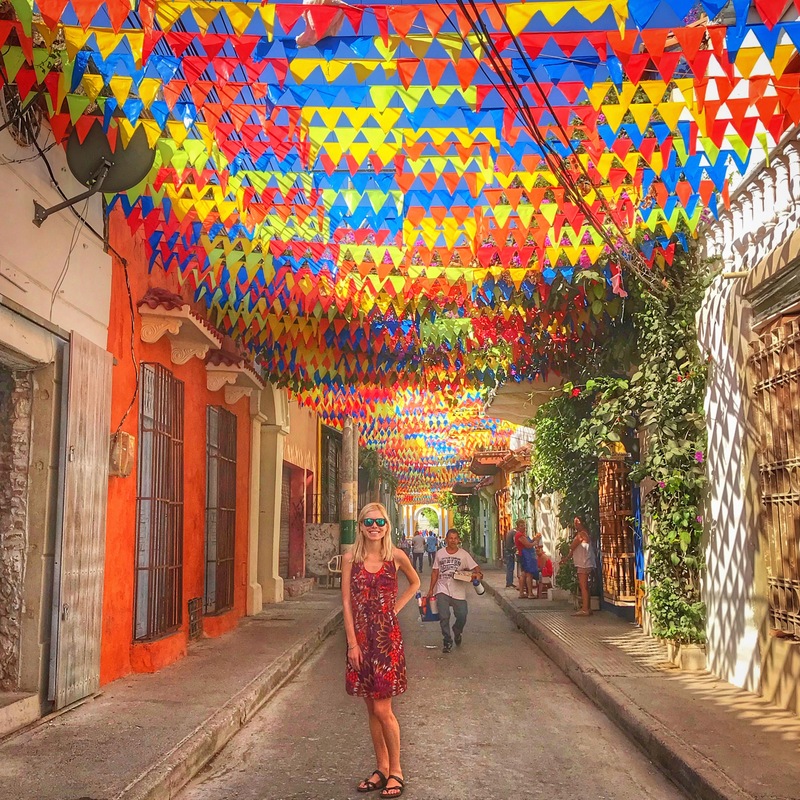 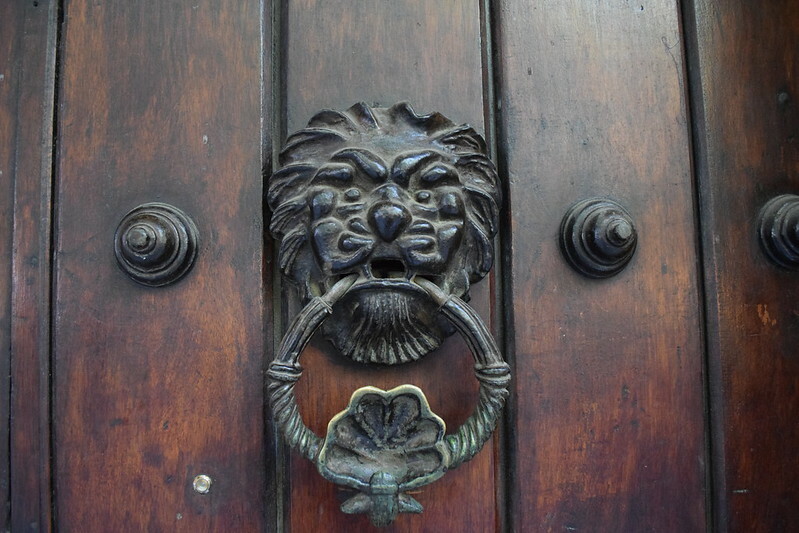 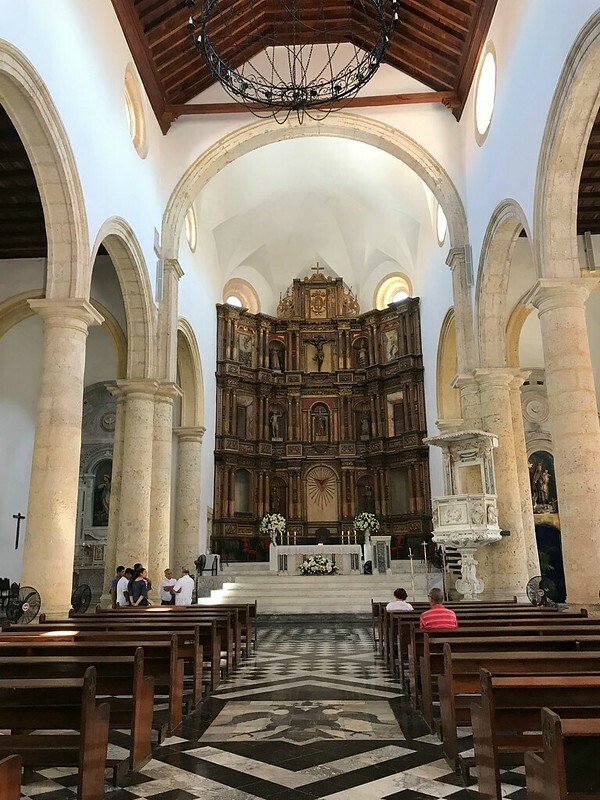 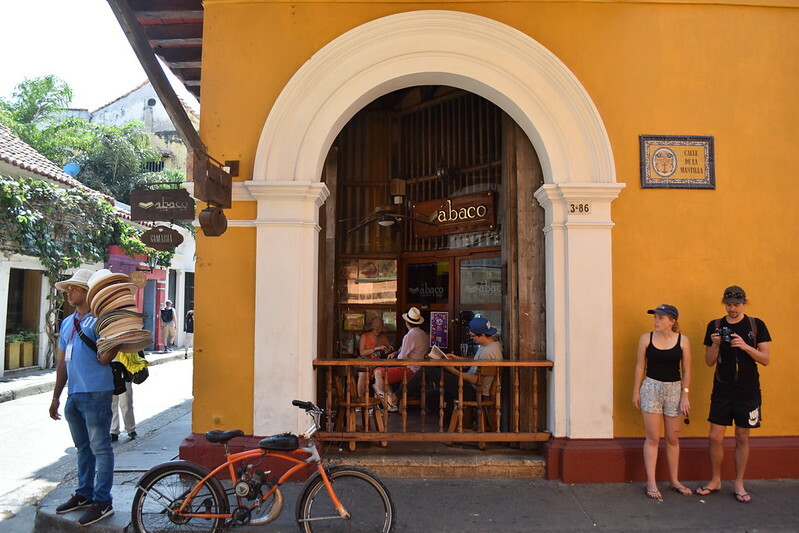 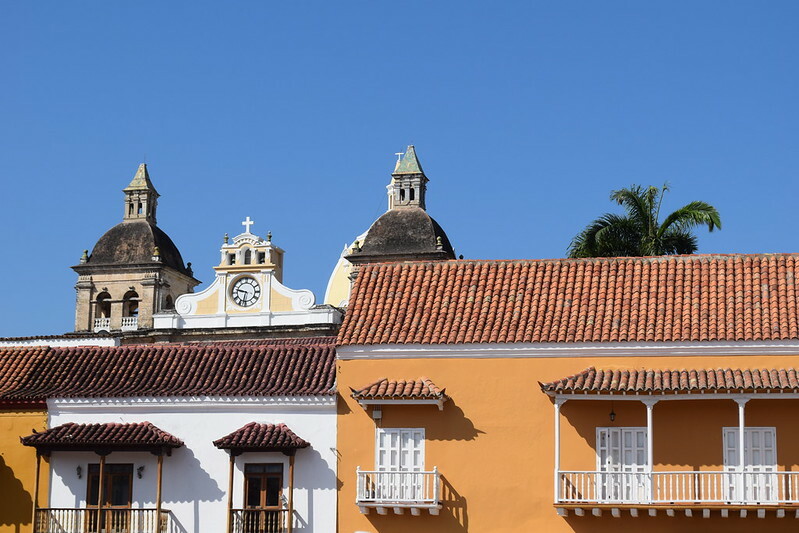 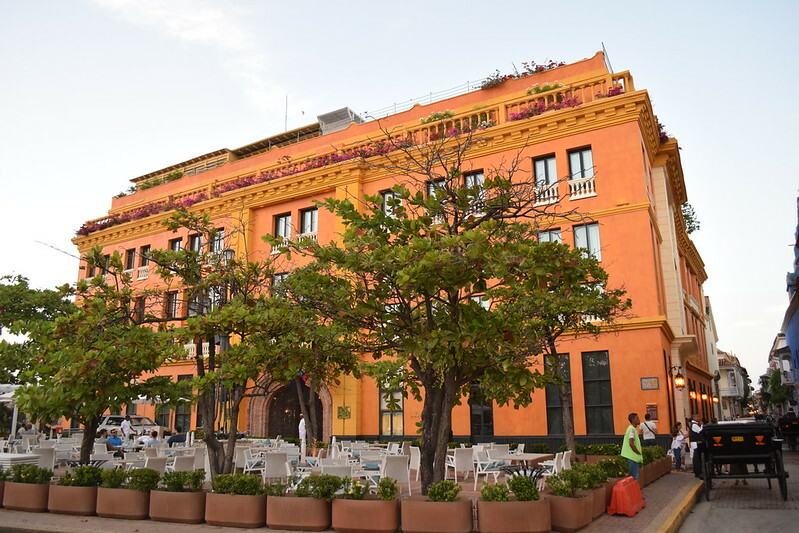 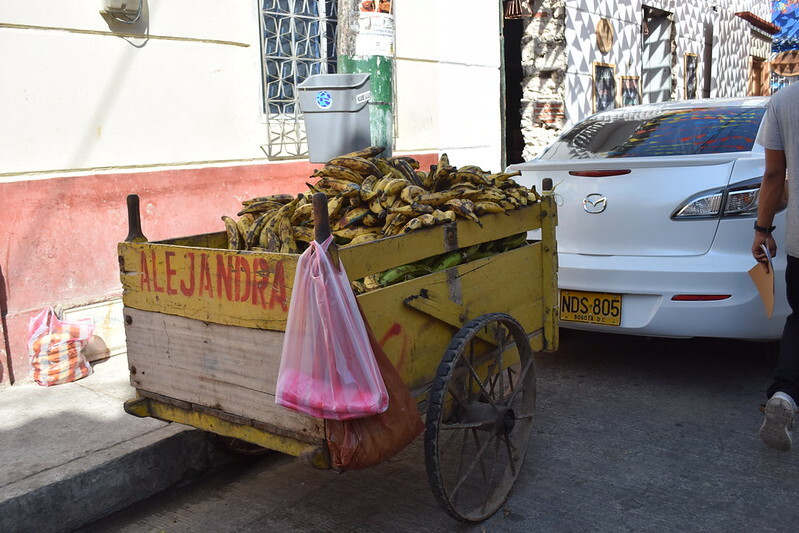 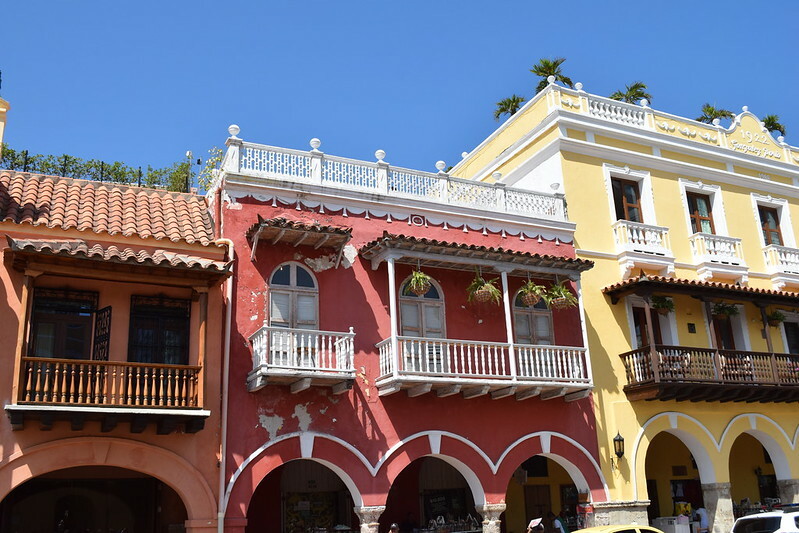 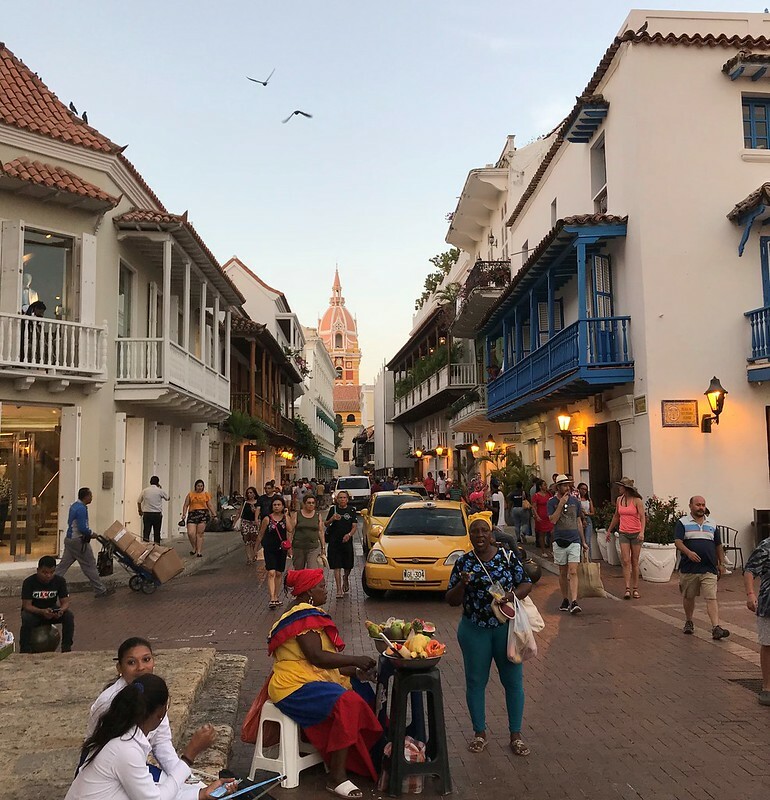 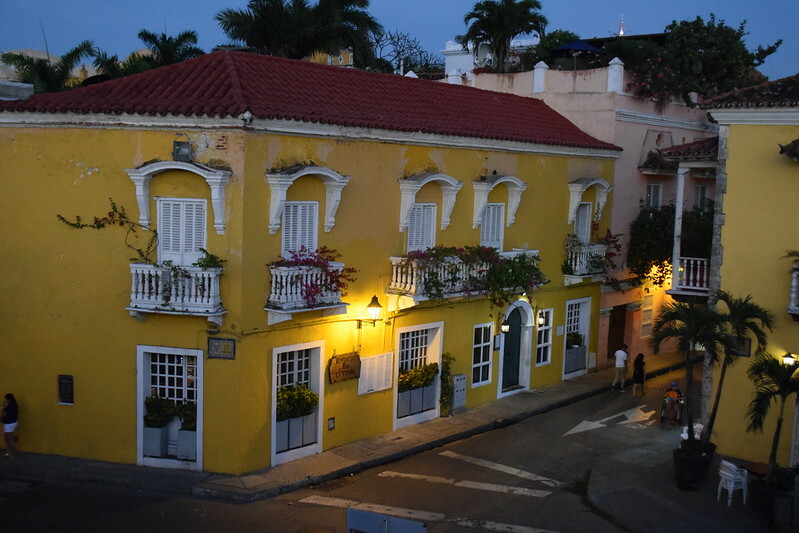 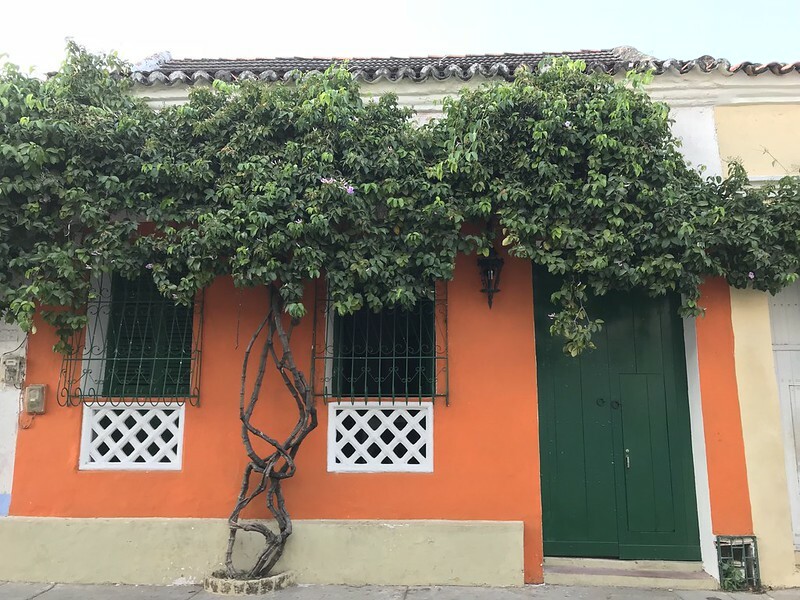 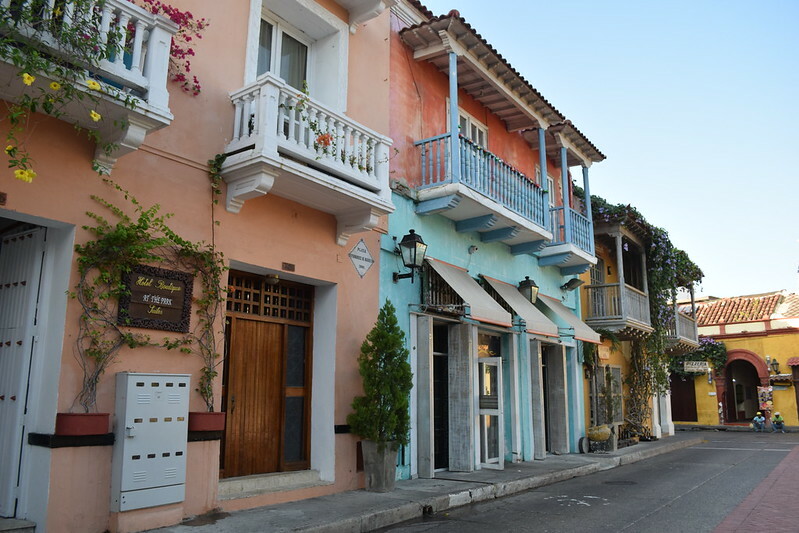 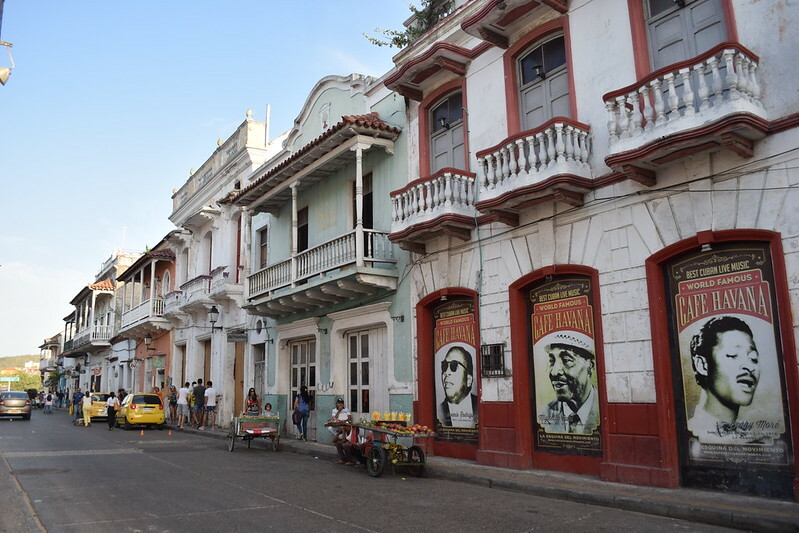 If you’d like to learn more about the history of Cartagena, including the period of Spanish colonial rule, I’d suggest taking a free walking tour. 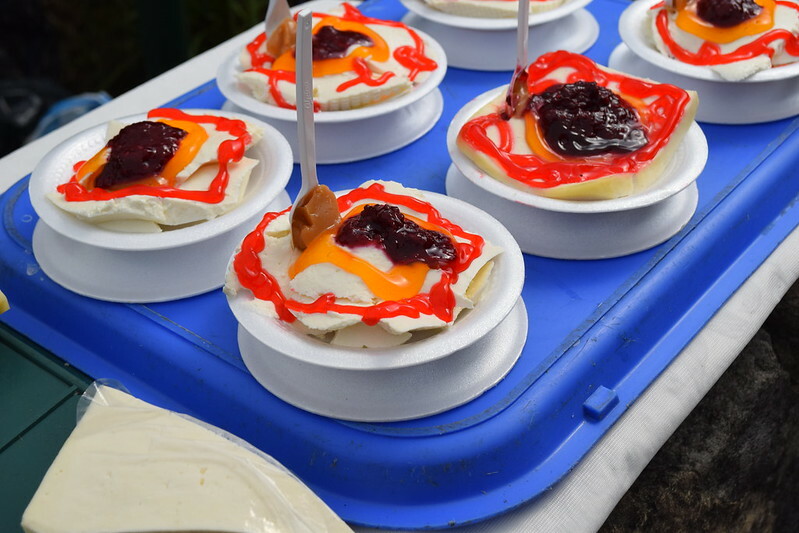 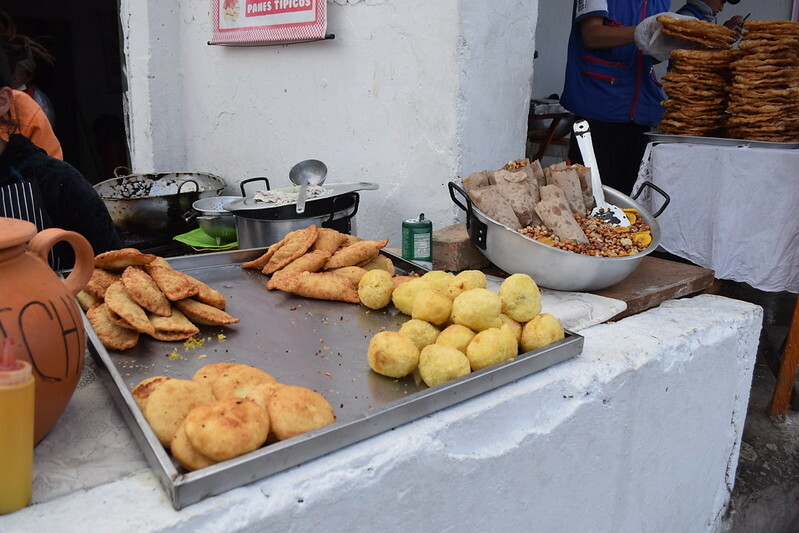 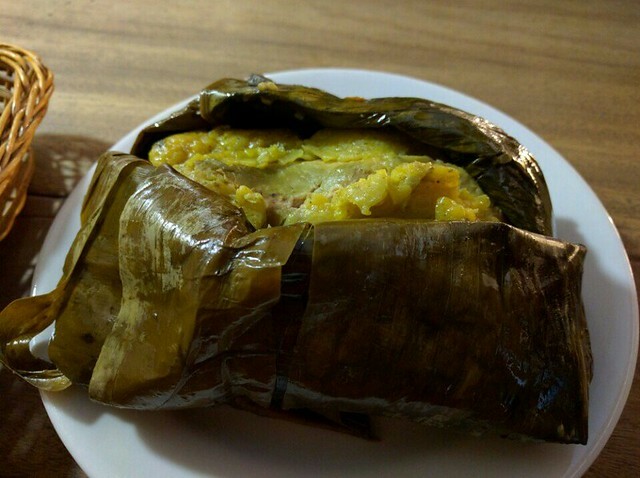 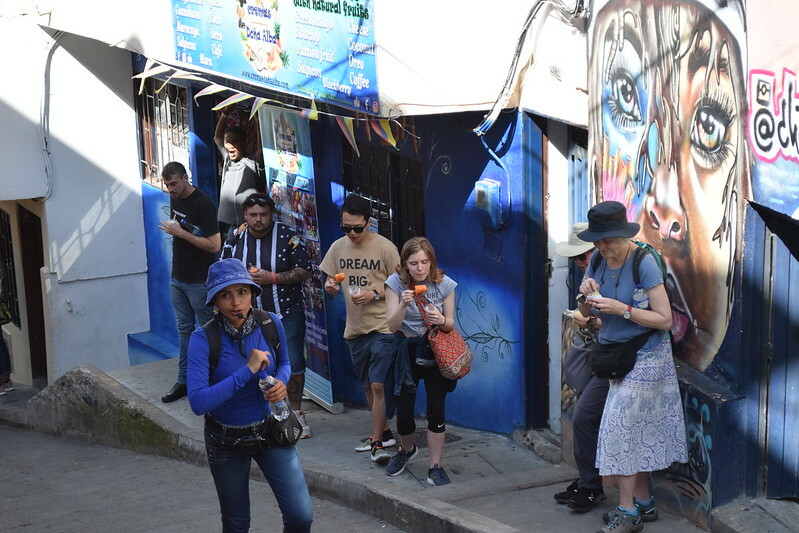 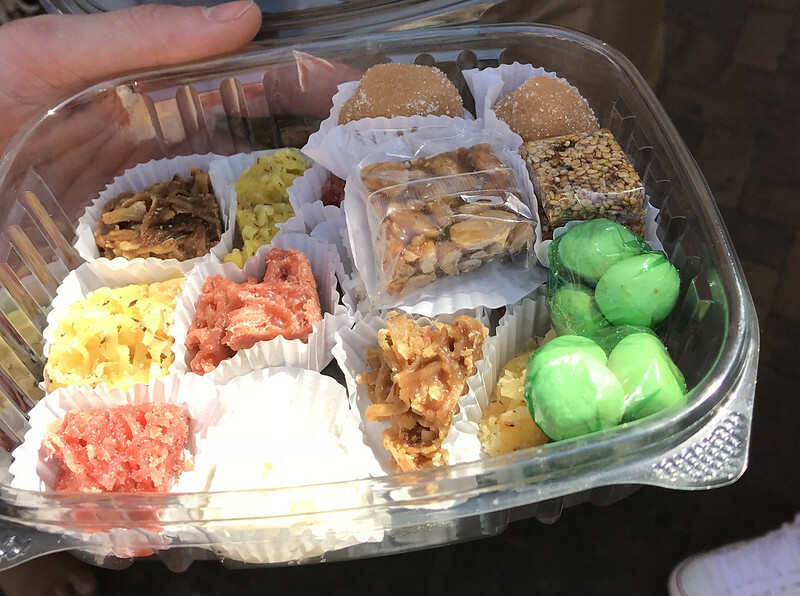 Even if you don’t like tours, the guide gives you Colombian treats along the way! 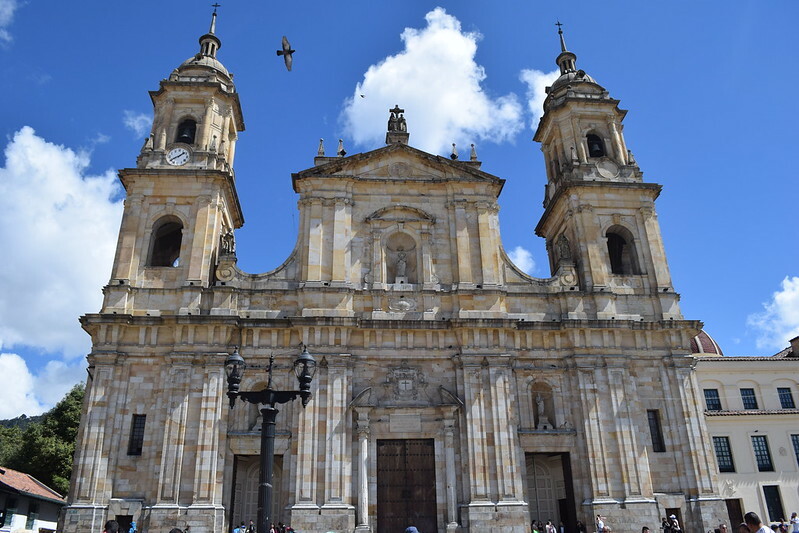 After only 24 hours in Cartagena, I took a one-hour flight to Medellin. 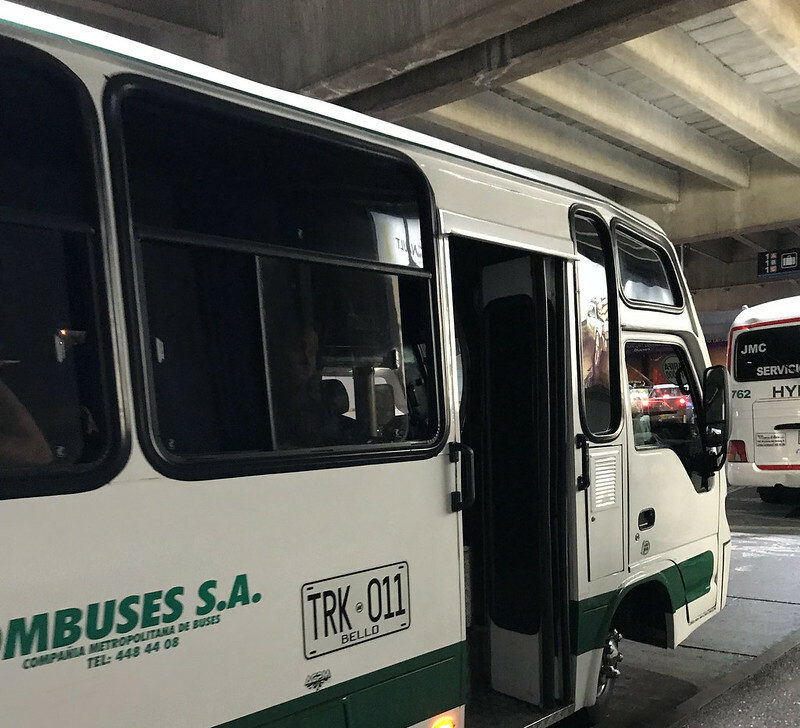 The bus and plane were around the same price (about 40 USD), and the bus journey would be 12-15 hours, making the plane an easy decision. 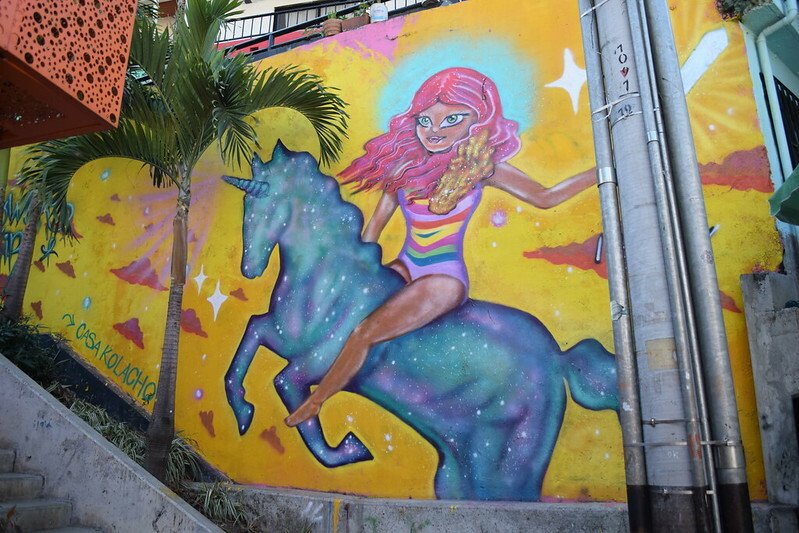 I found the flight using Skyscanner and compared it to the bus price using Rome2Rio. 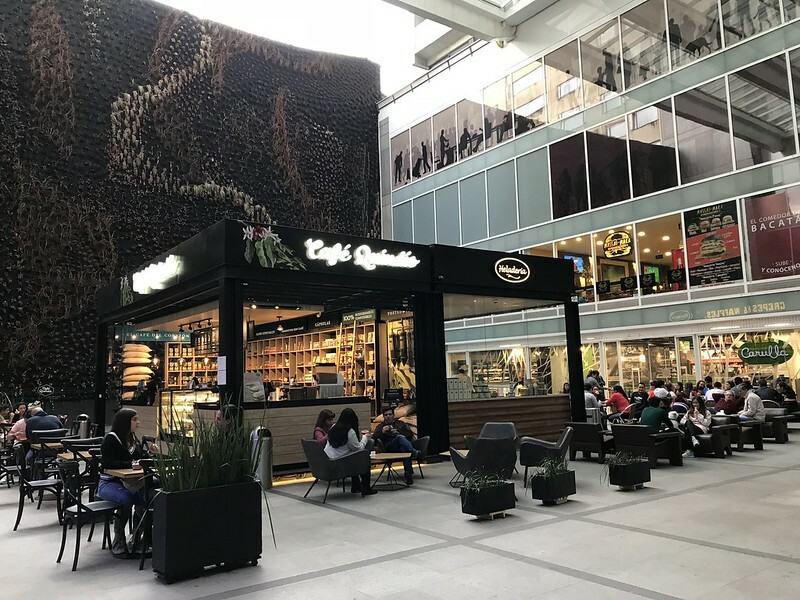 Because the airport is about an hour from the city center, I also had to take a bus for around 4 USD, which picked up in front of baggage claim and dropped off in front of the San Diego Mall. 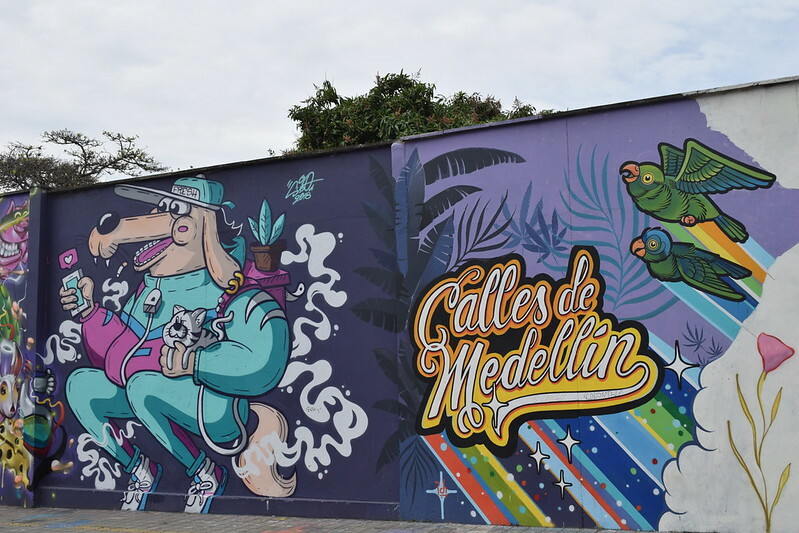 Only twenty years ago, thanks to the Medellin Cartel and Pablo Escobar, Medellin was known as one of the most dangerous cities in the world. 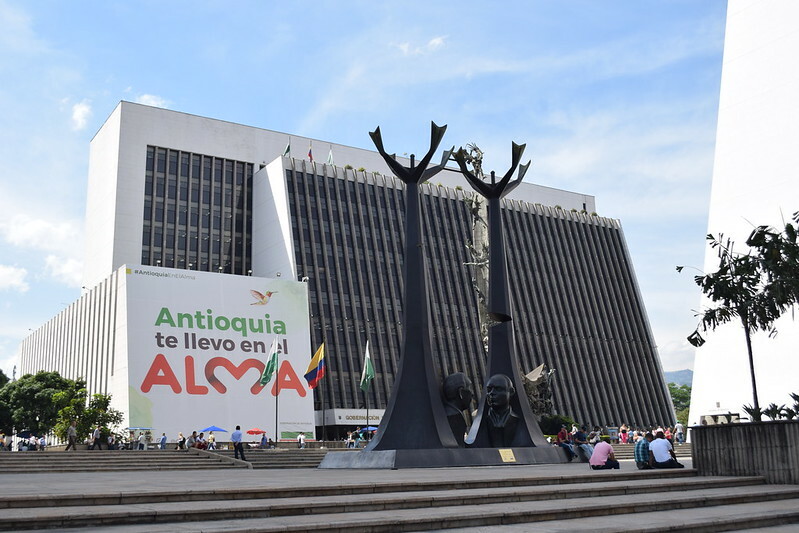 Now it is seen as an up-and-coming city of progress, innovation and change. 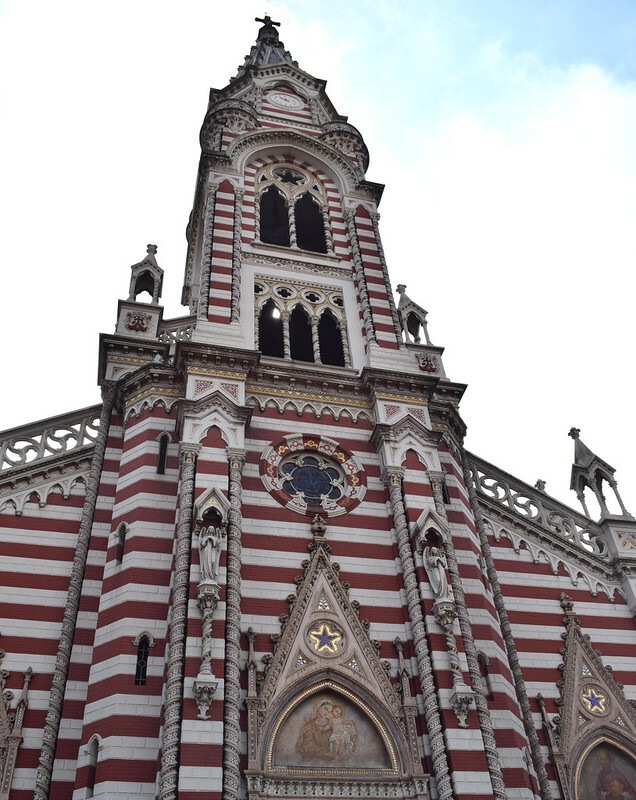 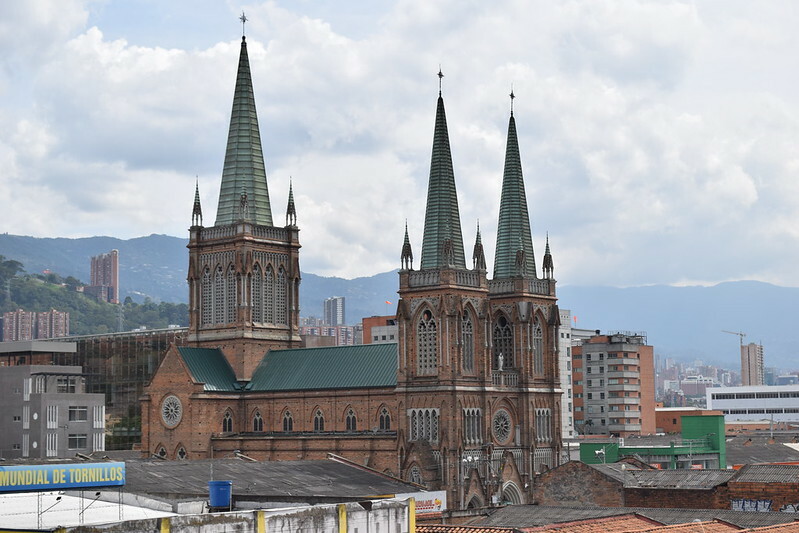 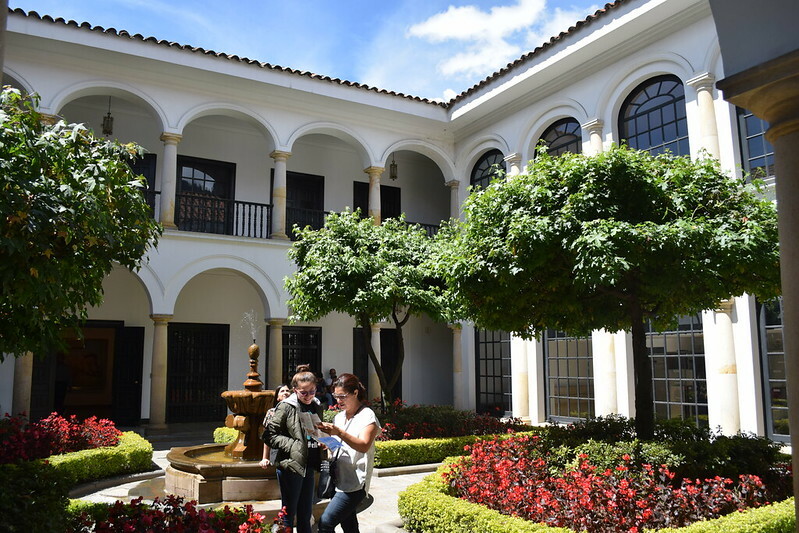 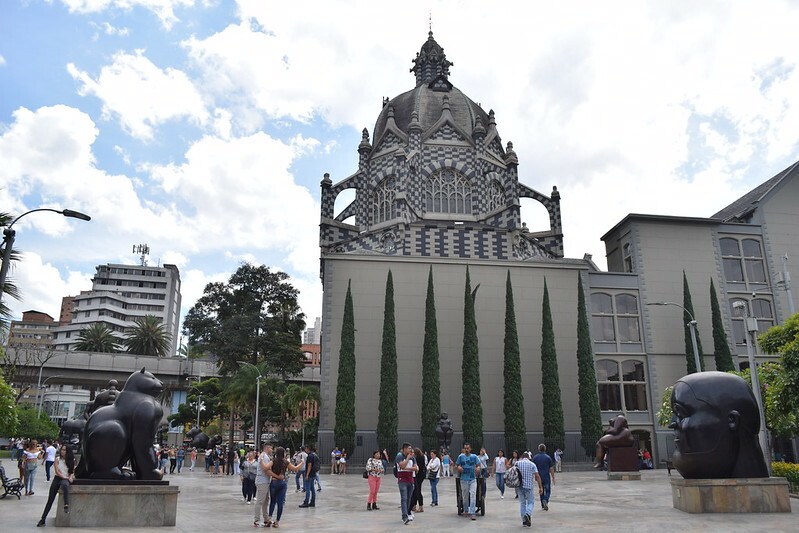 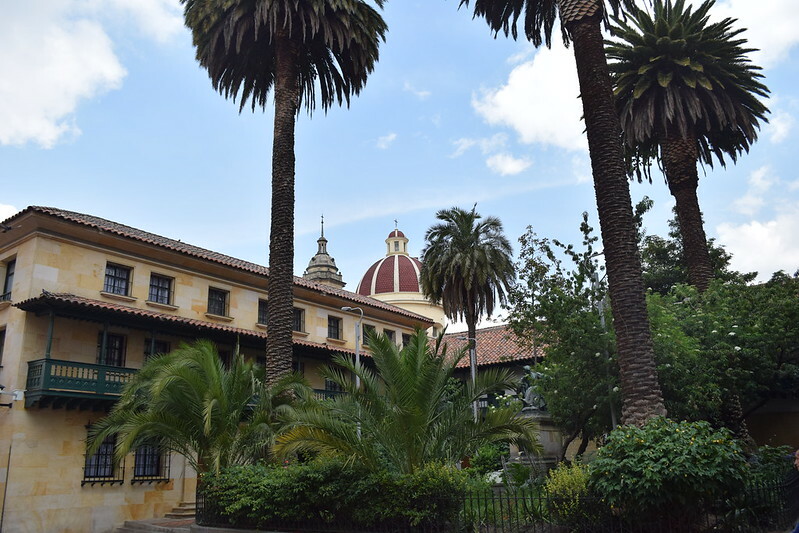 To learn about Medellin’s complex history, I’d recommend taking a free walking tour. 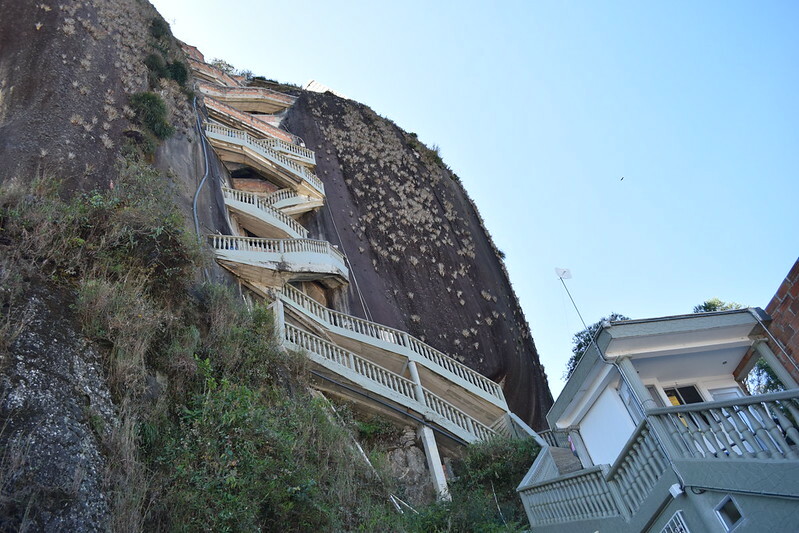 Our local guide, Juan, has really been through the ringer. 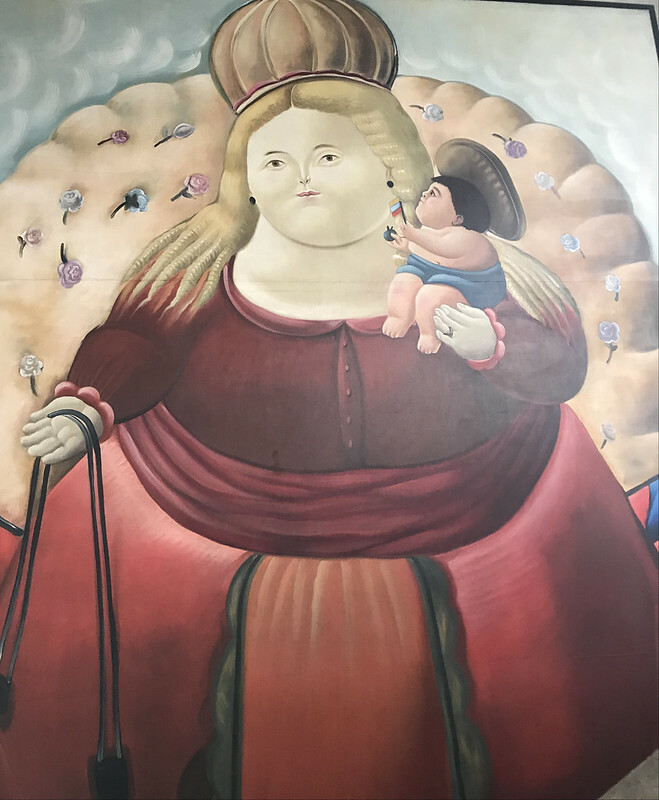 He grew up during the 70s and 80s, when the demand for cocaine really took off. 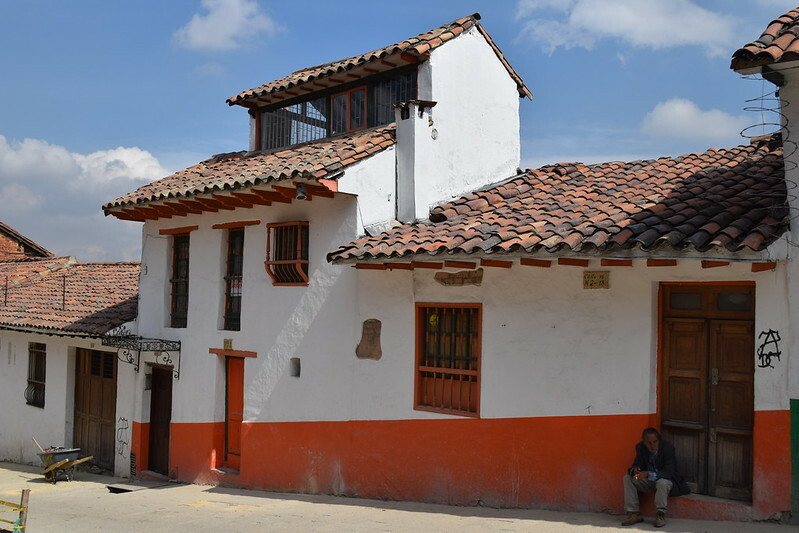 Because of simple economics, when the demand for the drug increased, Colombia realized it was able to provide the supply. 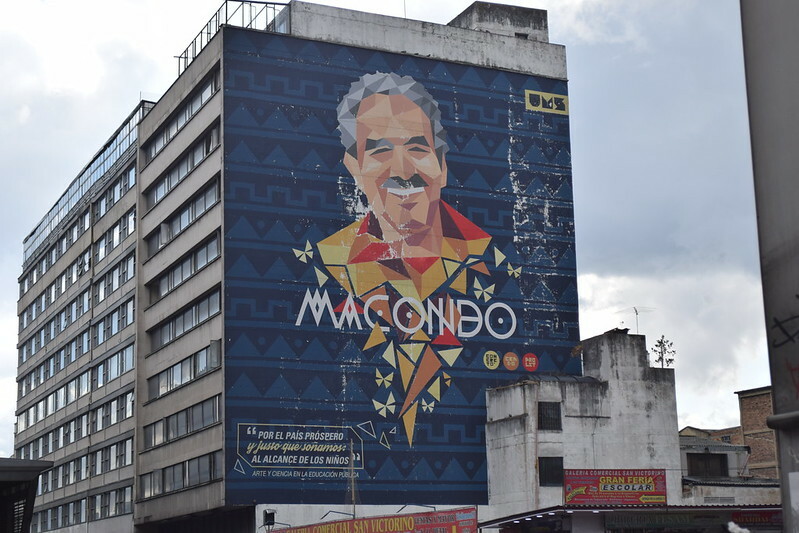 One of the most notable men involved in the trafficking of cocaine to the United States and around the world was Pablo Escobar. 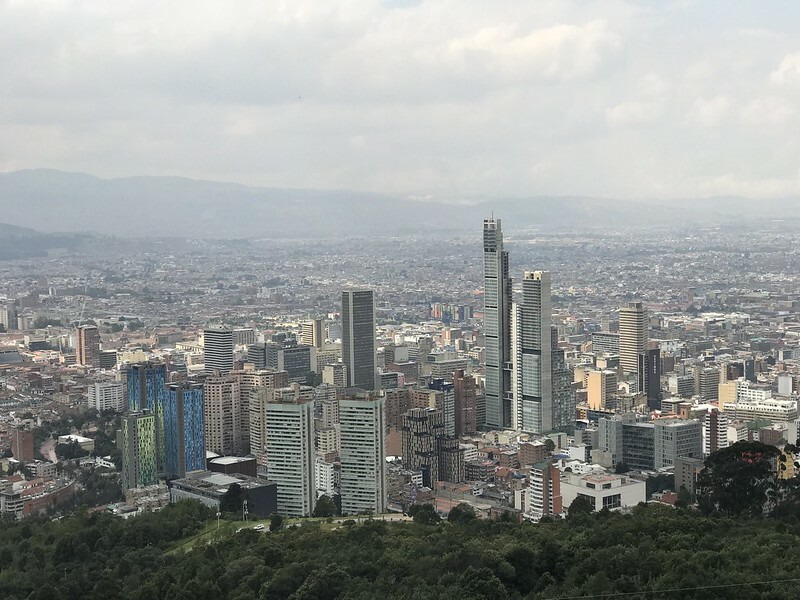 He grew up near Medellin, and due to his stealthy tactics, was able to form the Medellin Cartel, a highly organized Colombian drug coalition, which at its peak, brought in an estimated 100 million USD per day! 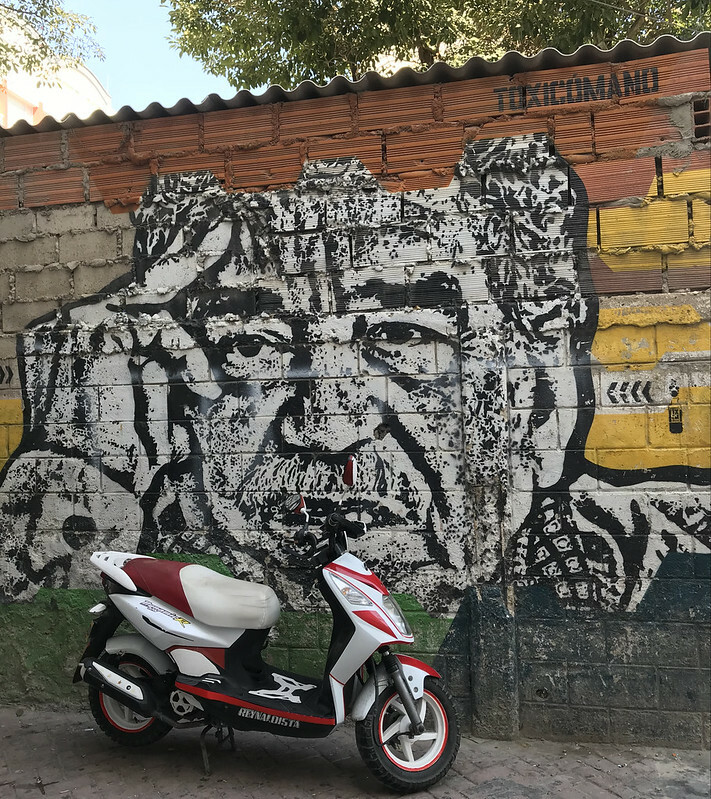 Known as the “King of Cocaine”, Escobar was able to pay off government officials and always seemed one step ahead of the law in regards to smuggling. 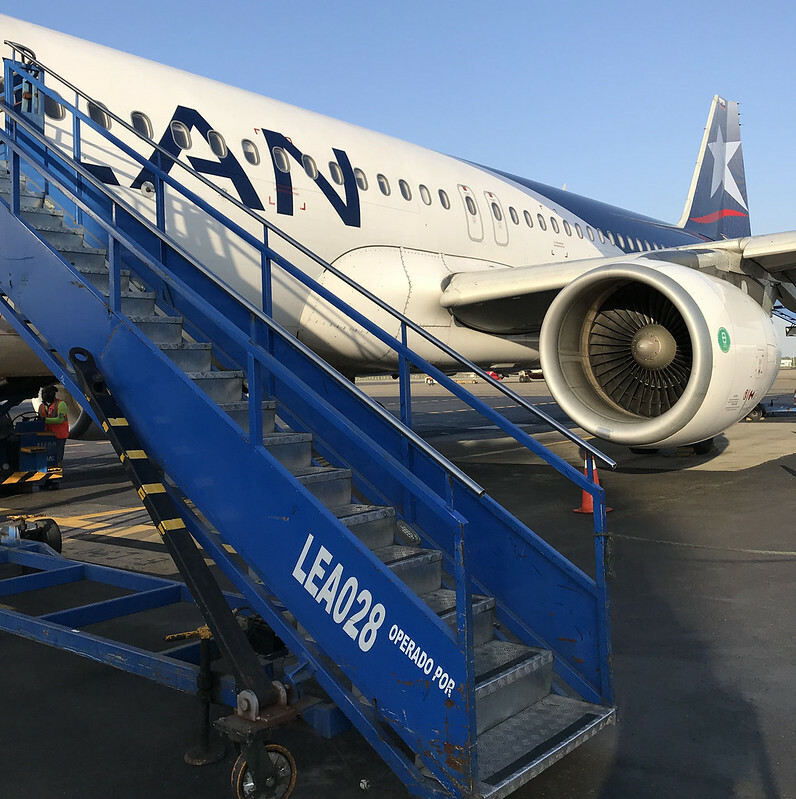 His tactics included hiding the drug in airplane tires and flying planes below radar into the Bahamas. 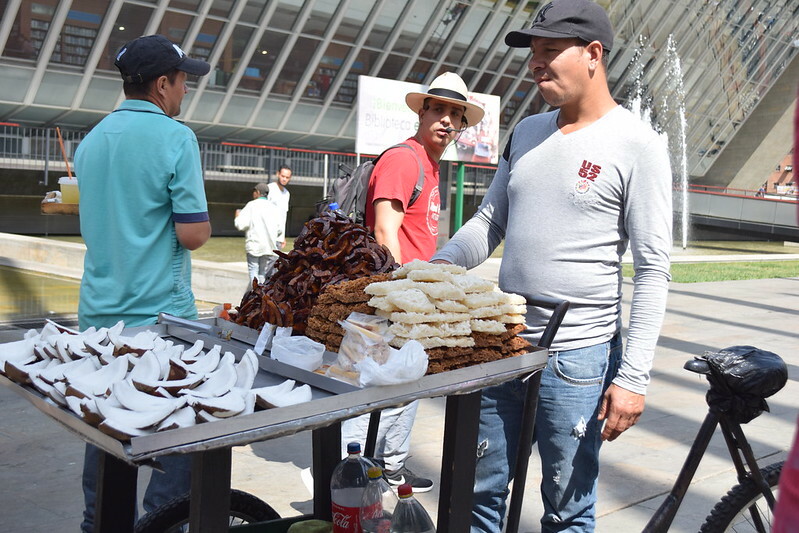 Now with such a risky and profitable operation, Escobar was unrelenting at stopping anyone in his path. 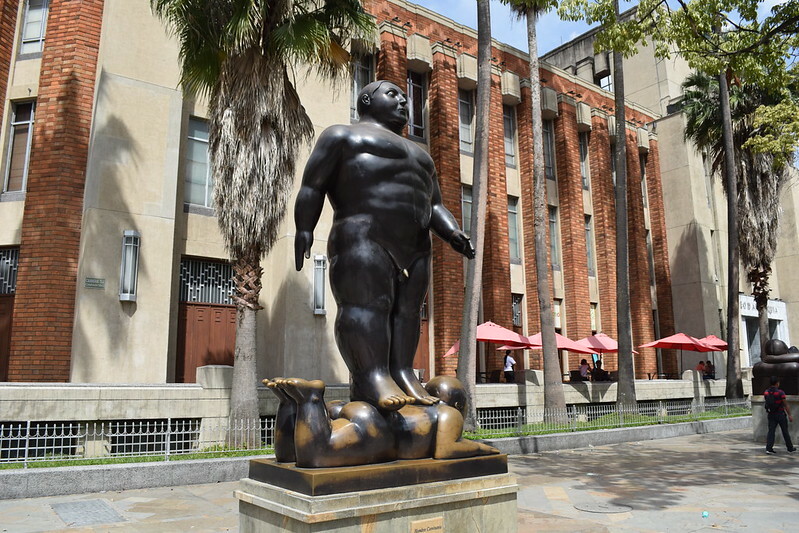 He was responsible for the death of an estimated 4,000 people, including civilians, journalists, and police officers. 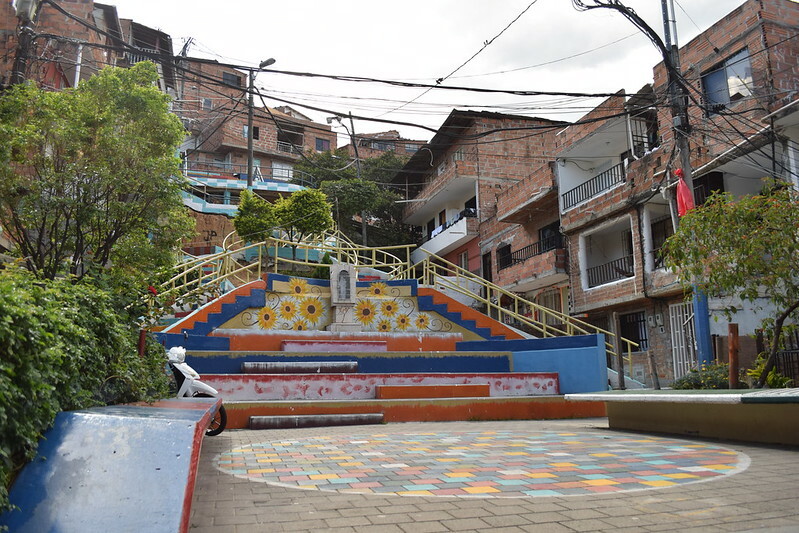 On the contrary, Escobar also used his wealth to give back to the poor by improving the country’s infrastructure. 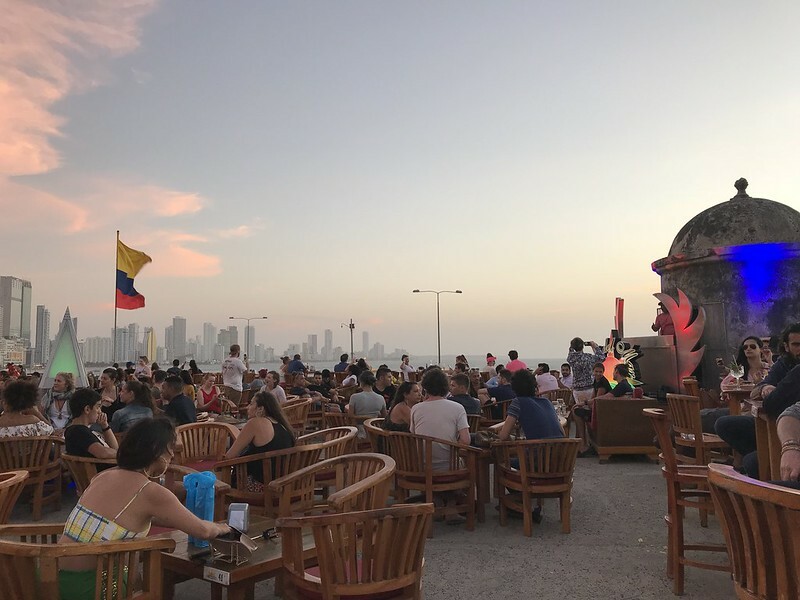 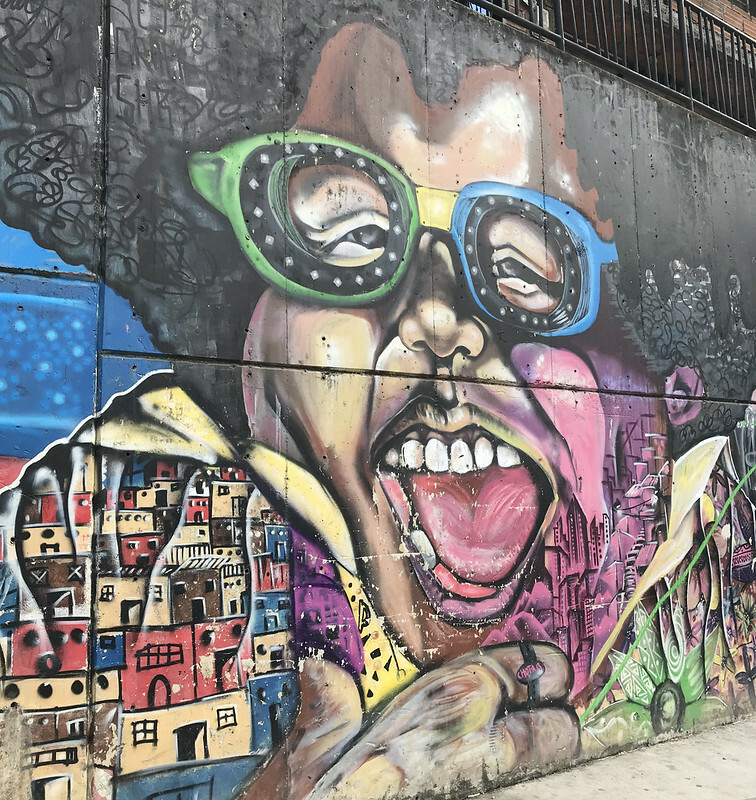 After decades of violence, he was finally shot and killed in 1993, yet the locals are still passionately opinionated about the legacy of Escobar. 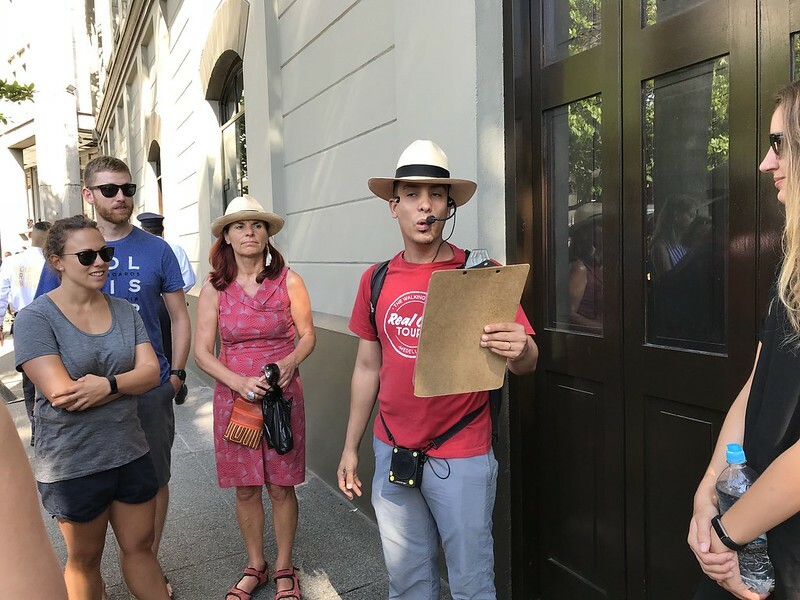 As such, during our walking tour, as to avoid attracting local opinion, our guide chose to use code words for cocaine like, “the white stuff” or “SNOW.” He also referred to Escobar as, “he who must not be named”, a Harry Potter reference to Voldemort. 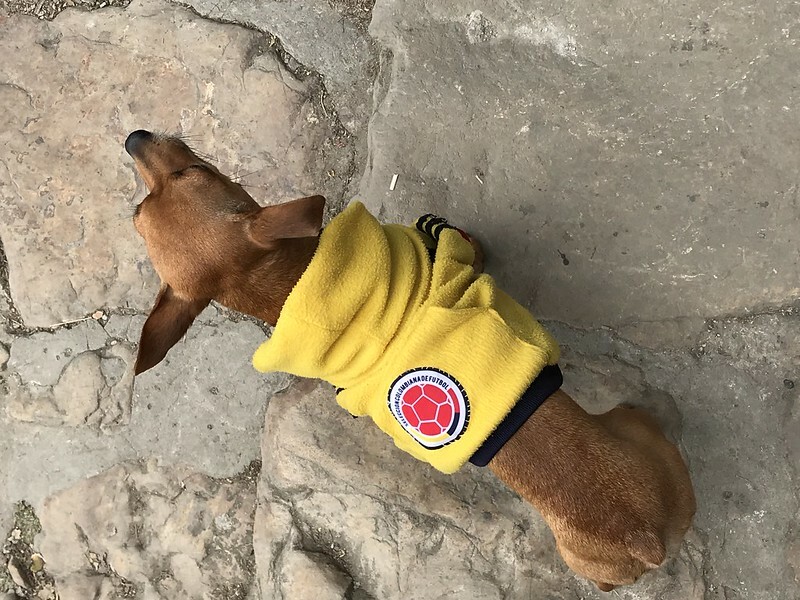 Anyway, Juan was personally very opposed to Escobar and the Medellin Cartel. 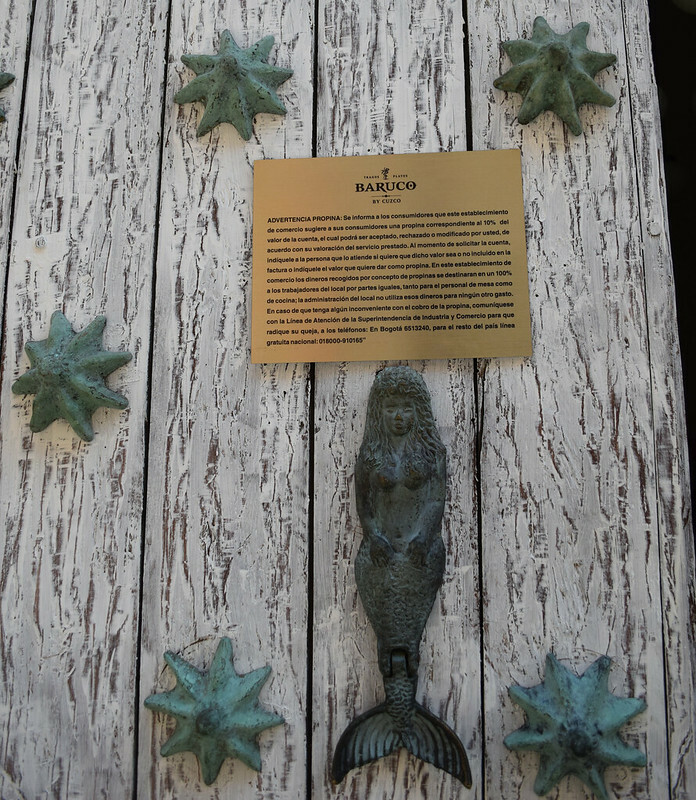 During their reign, both he and his brother were shot as innocent bystanders. 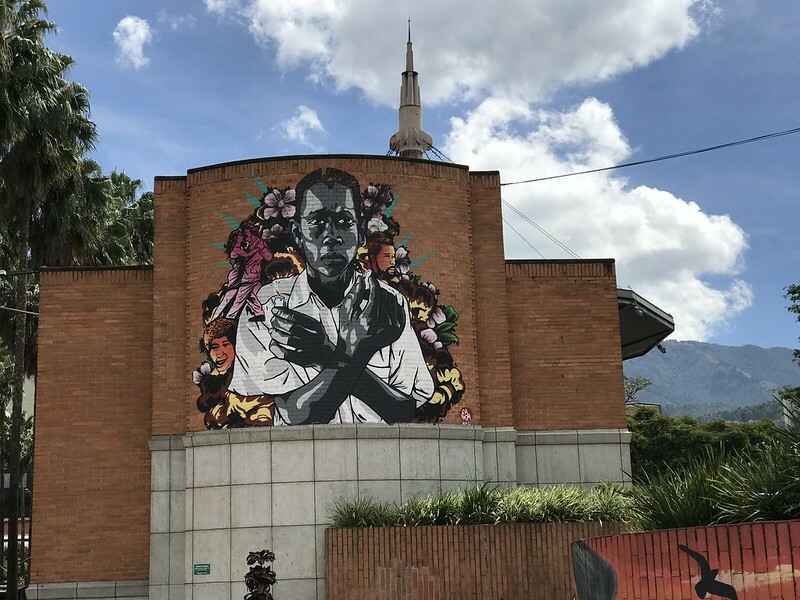 His two prosperous uncles were also kidnapped and held for ransom in jungle for a year before his family paid 400,000 USD to get them back. 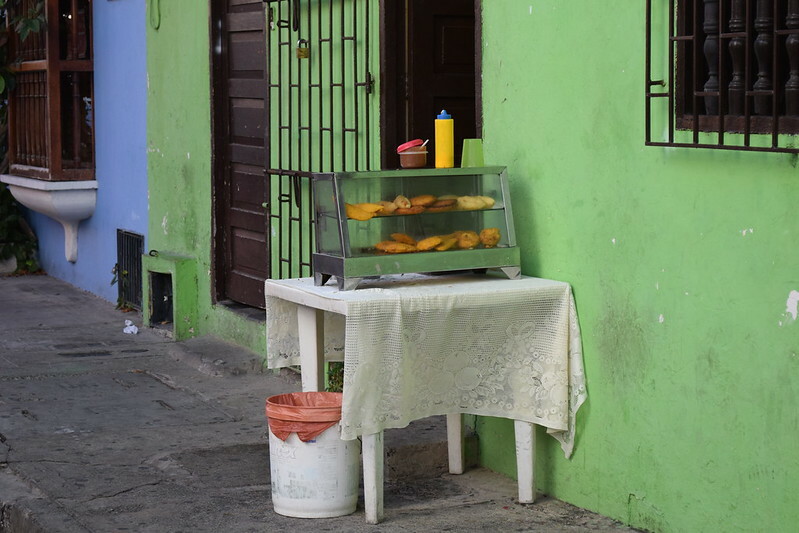 To escape, Juan and his brother went to the United States and applied for asylum. 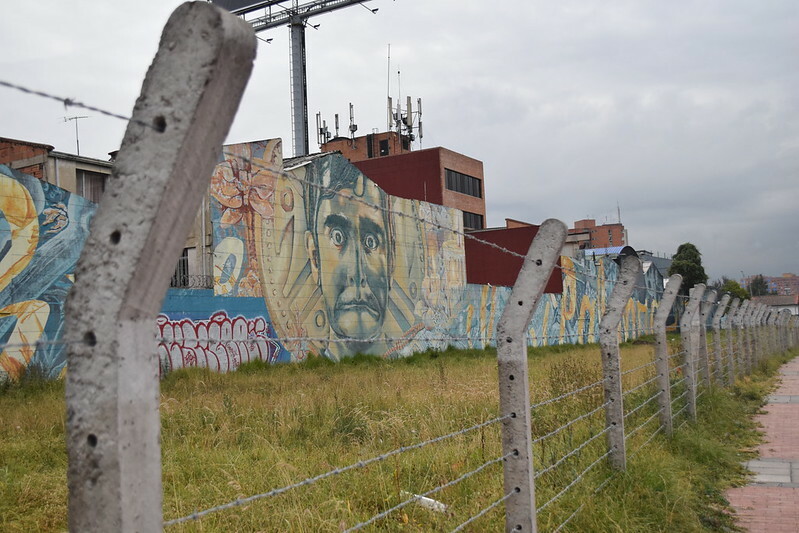 They overstayed their visa, and when their applications were denied, Juan was arrested and sent to jail for 6 months. 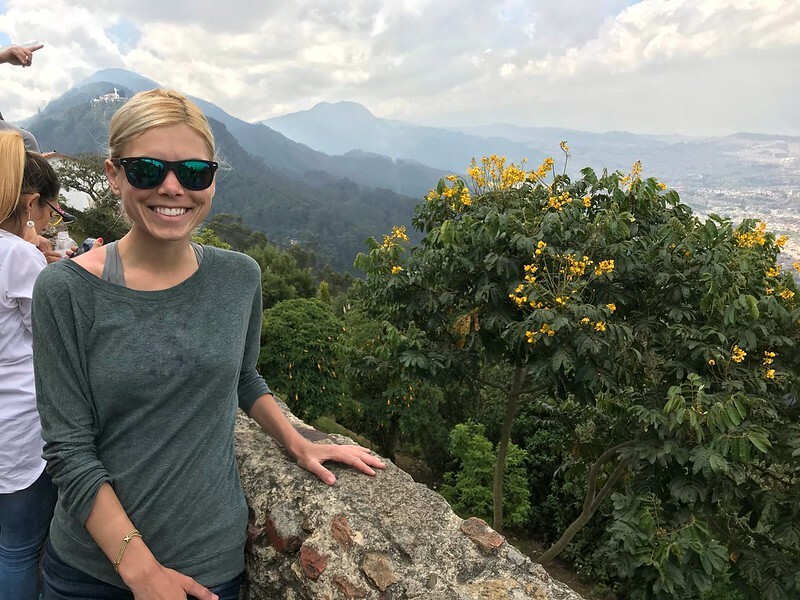 After his release, he married his American girlfriend in order to gain citizenship, but that was also denied, and he was told to leave the country. 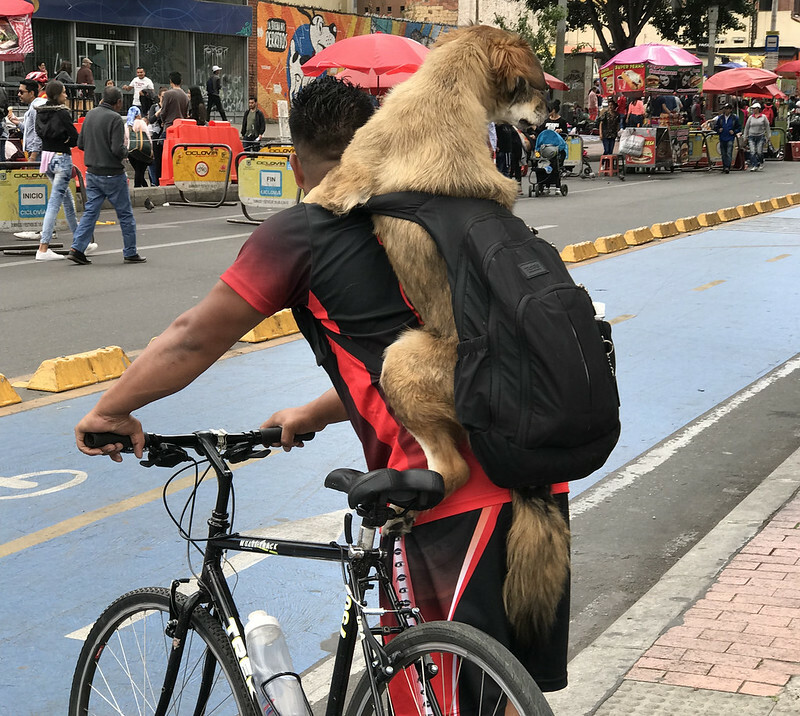 His new American wife also told him she wouldn’t go with him to Colombia, so he returned back to his homeland alone feeling very depressed and hopeless. 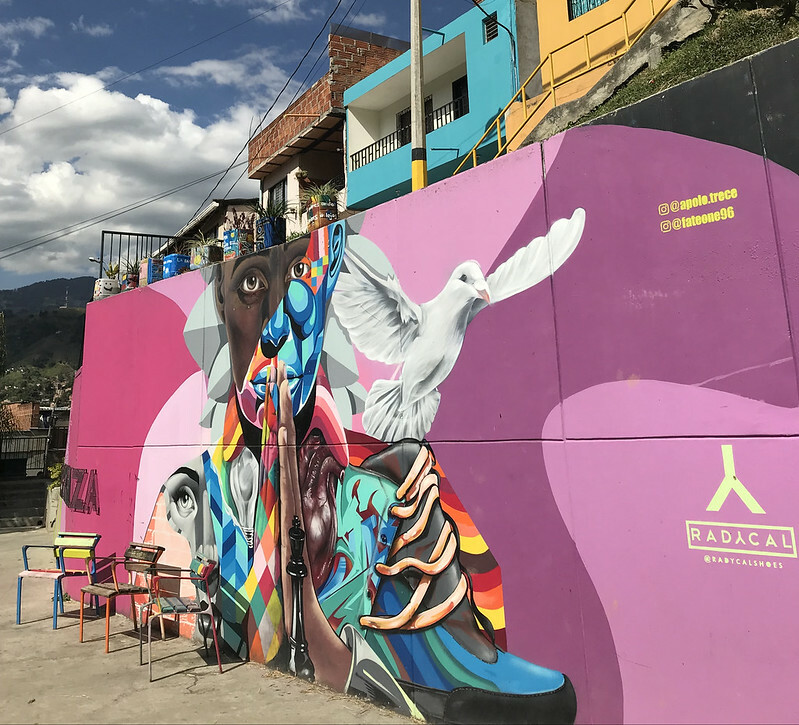 Now you may wonder, after such a tumultuous history, how the city of Medellin was able to pull itself together. 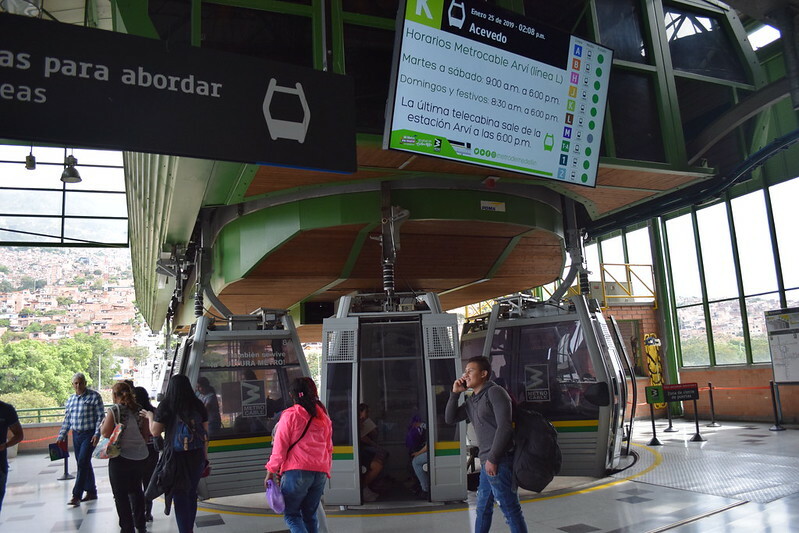 Well, oddly enough, the answer is: the Medellin Metro. 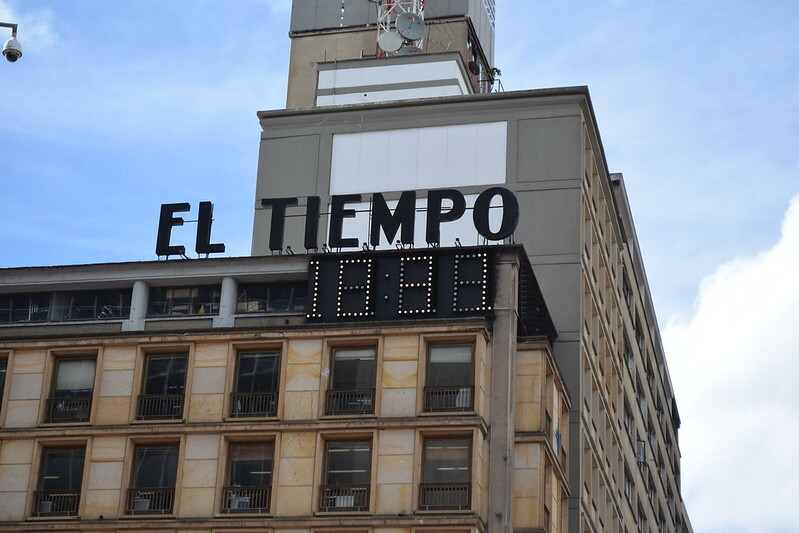 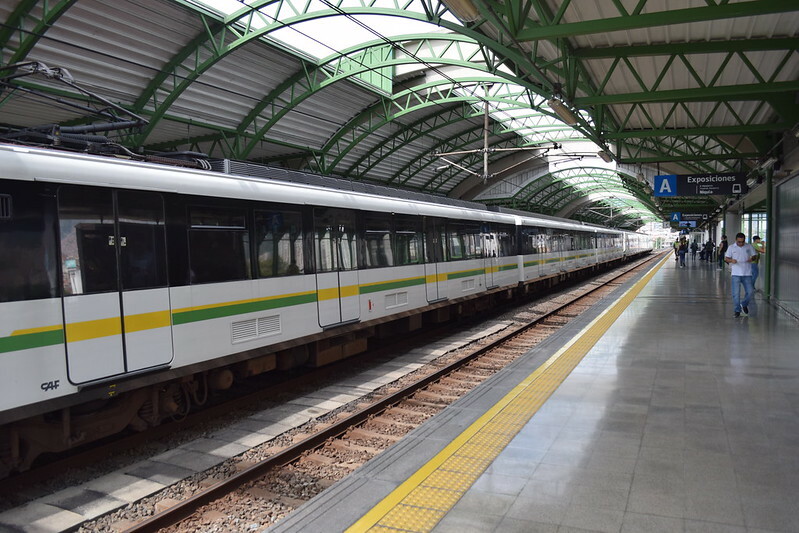 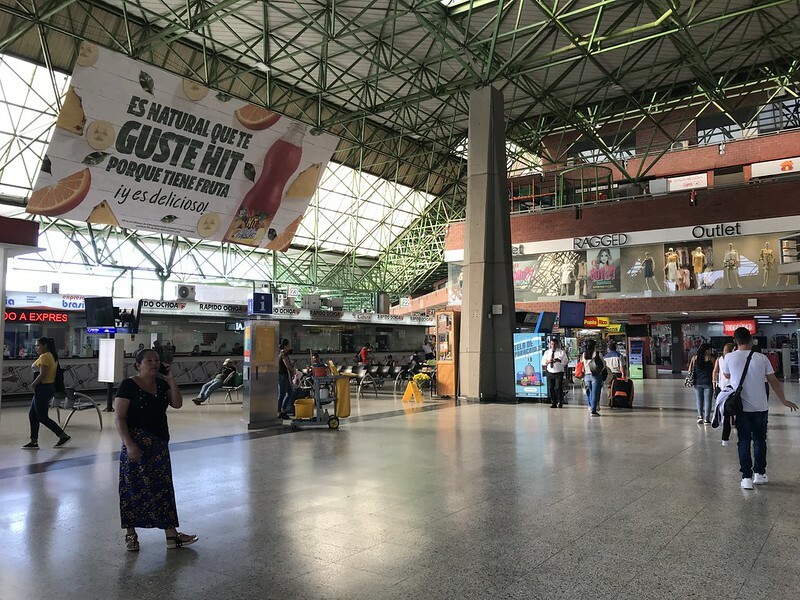 It was the first and still is the only public metro in Colombia. 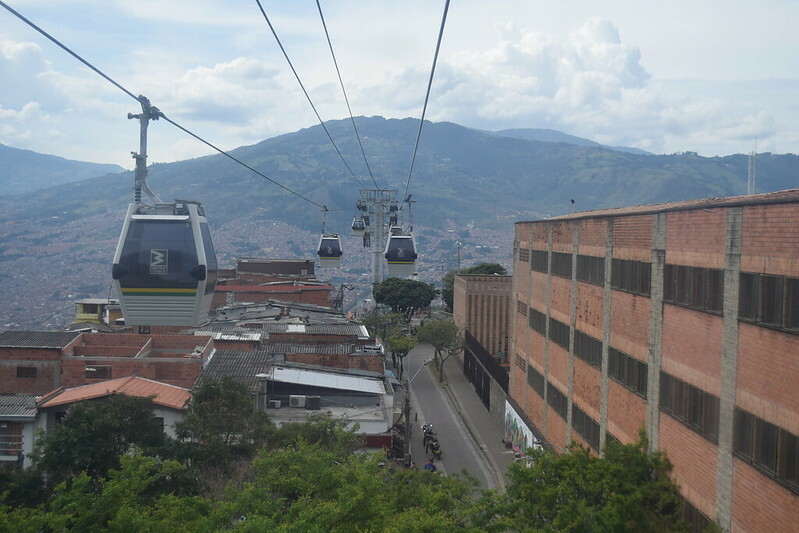 It is a series of above-ground trains and cable cars, and its construction was really seen as a sign of progress, and a beacon of hope in the lives of Colombians. 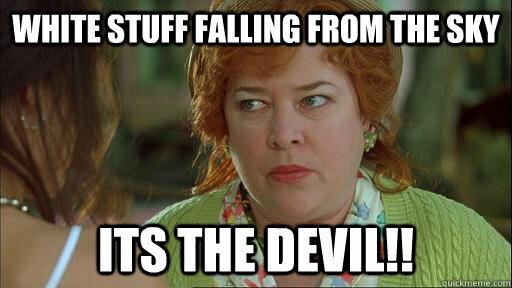 🙏 Juan used this metaphor to describe the metro. 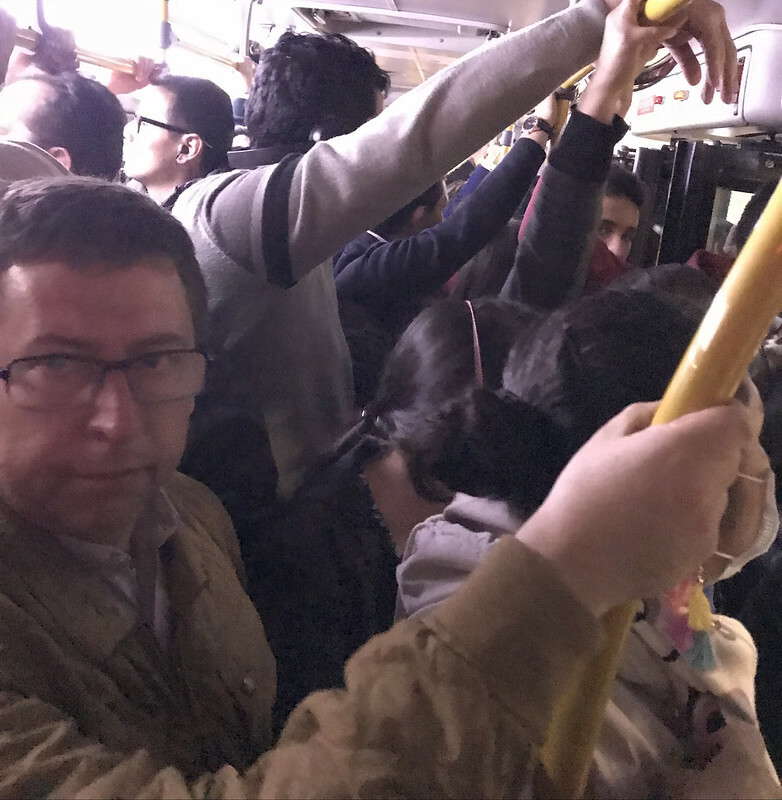 Basically, as Colombians felt like they were drowning, with all the violence and inequality, the metro was seen as a tree branch for them to grab onto. 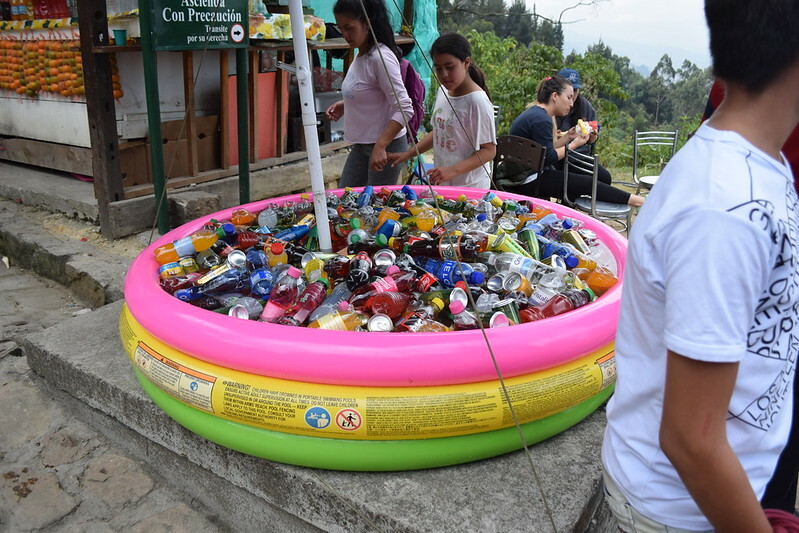 It was something to help lift them out of the water and keep them from drowning or giving up hope. 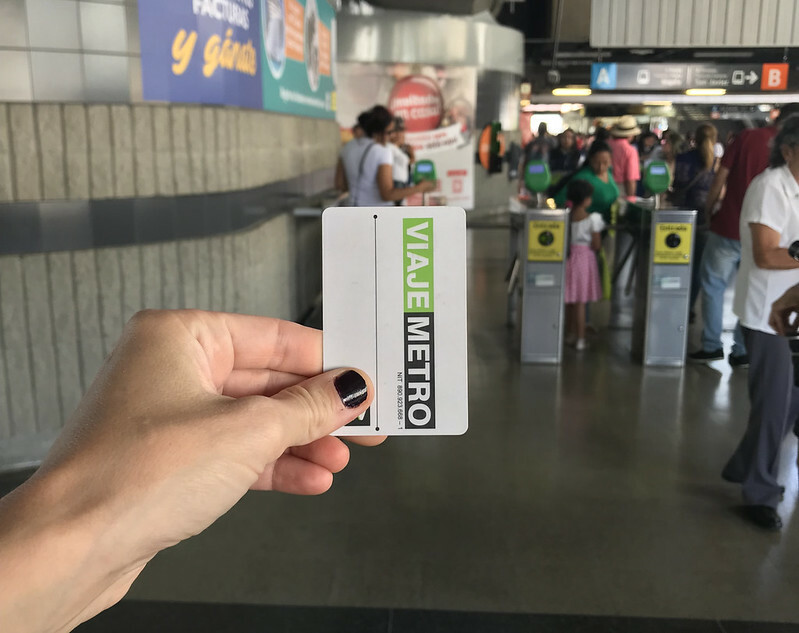 The metro represented progress and the possibility of change. 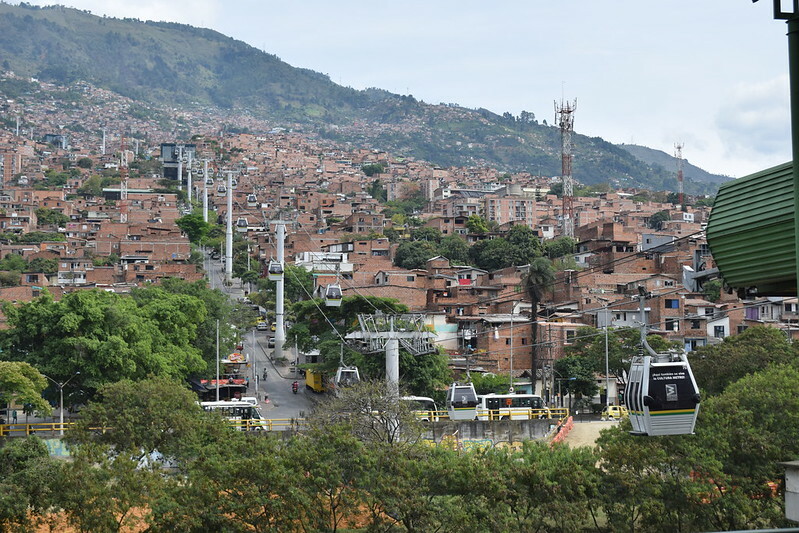 Essentially, because the city was so spread out into the countryside, the metro made it possible for people to easily travel across town to find new jobs. 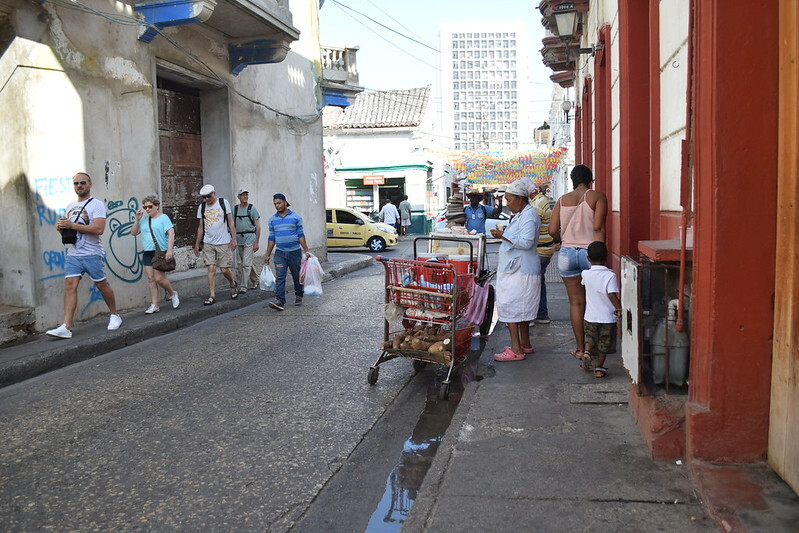 This exponentially increased economic development for the city and also increased communication between the different neighborhoods. 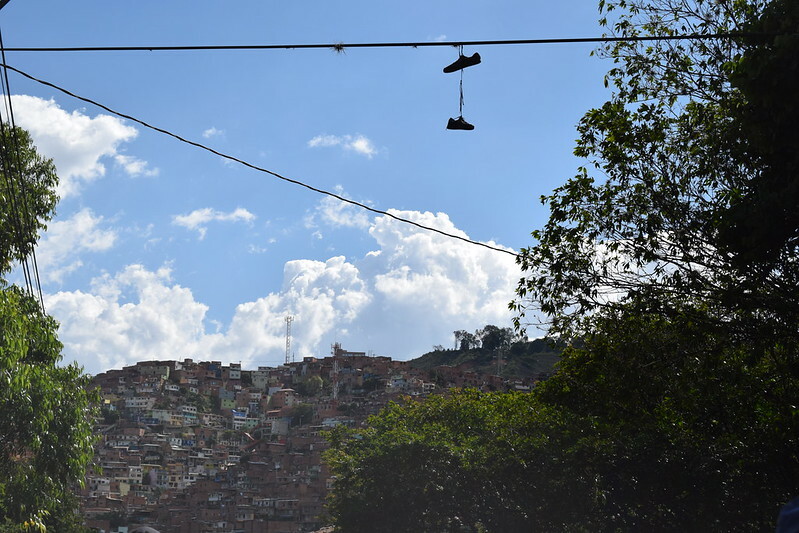 Everyone was more connected and social, which helped deter further violence. 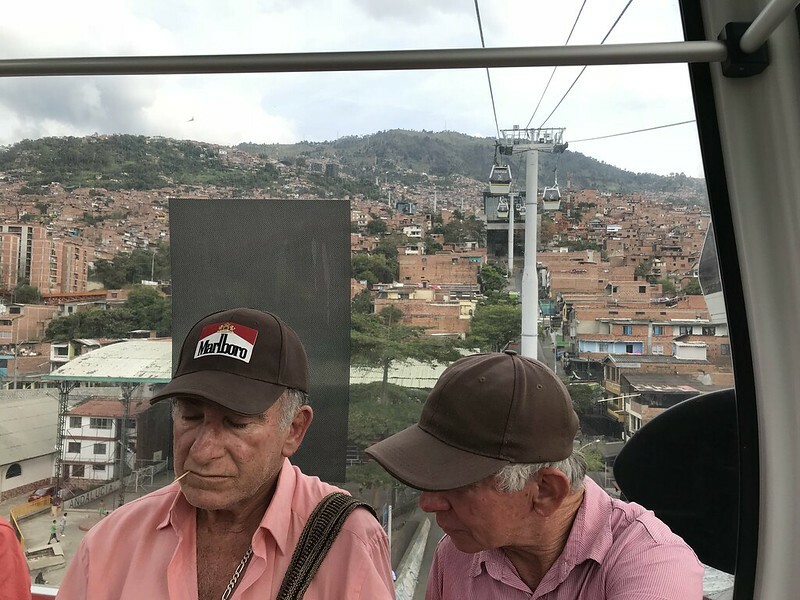 I rode the metro with these sweet old men that reminded me of the Odd Couple. 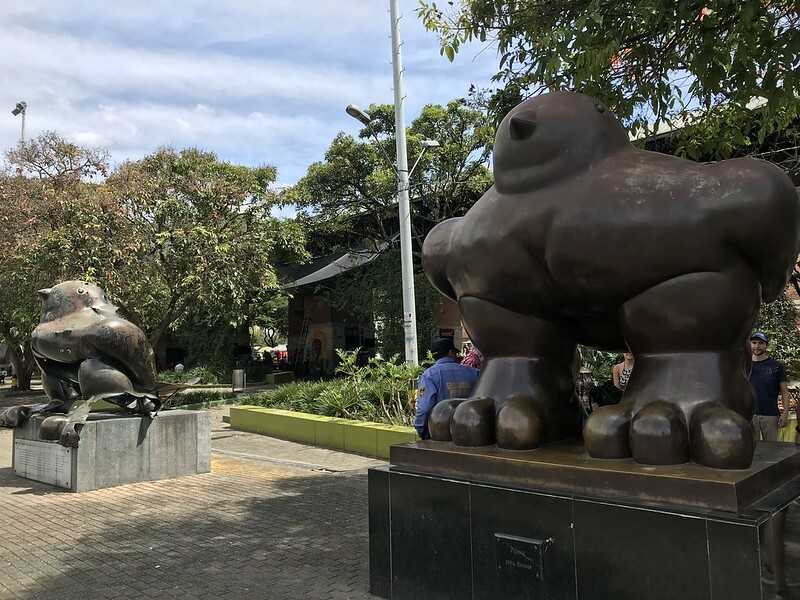 They were reminiscing about the old days when none of this was here, bickering about silly little nuances, and “ooing and aahing” at the metro like fireworks. 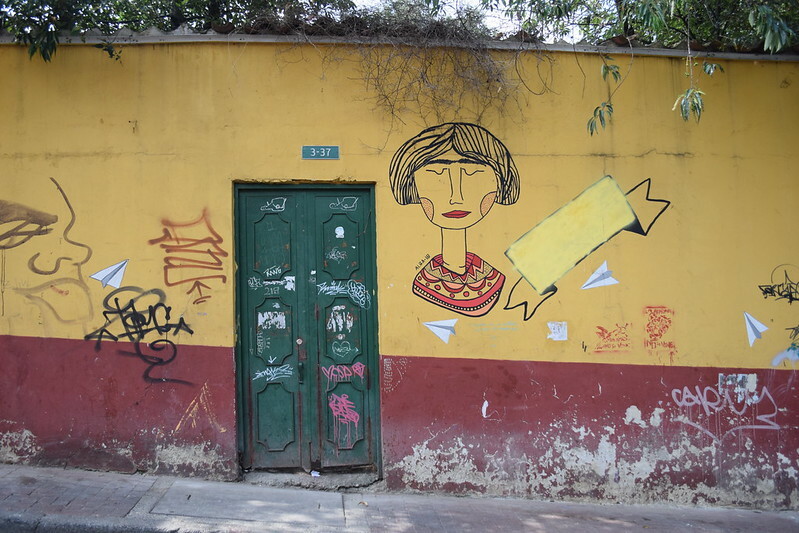 Because the metro is so respected, you will not find trash or graffiti near it. 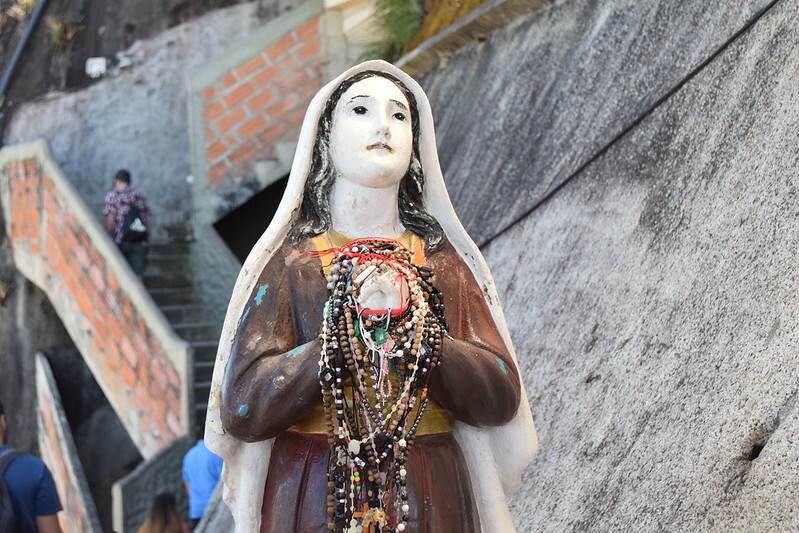 It is seriously looked at as sacred ground. 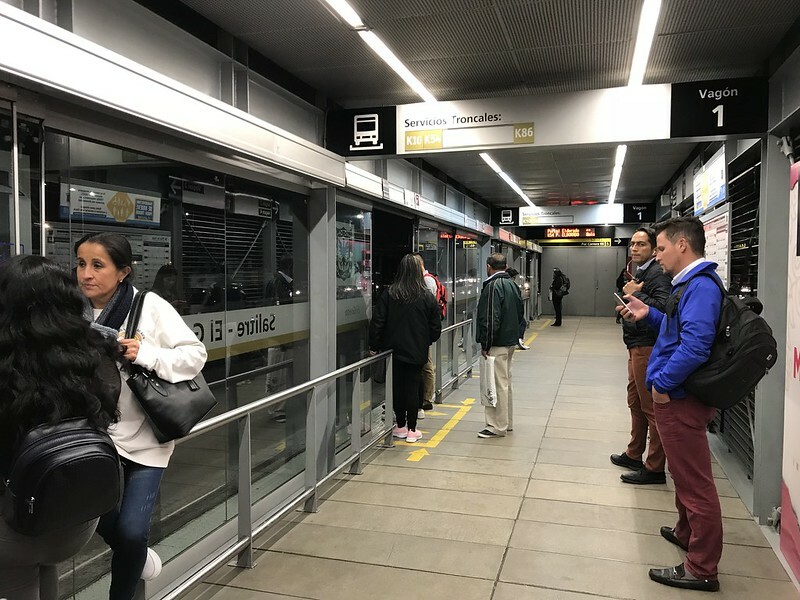 Personally, I liked how you only paid one small fee to ride the metro, and could take it from one side of the city to the other. 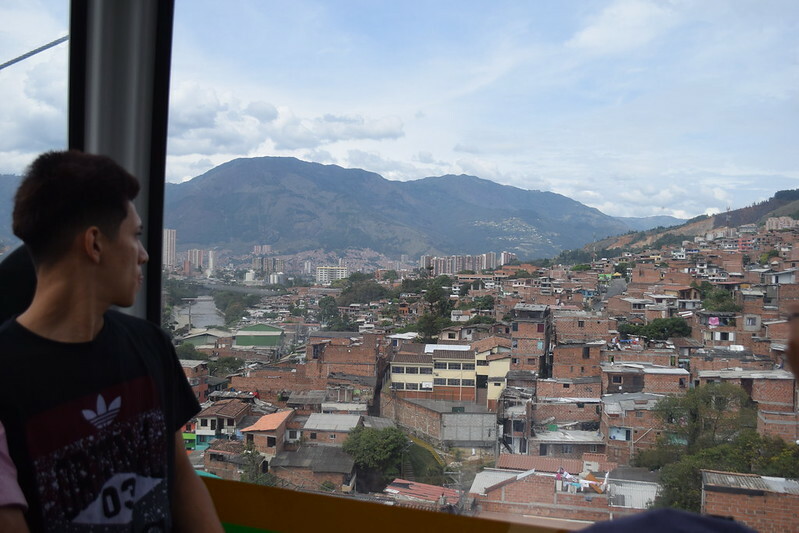 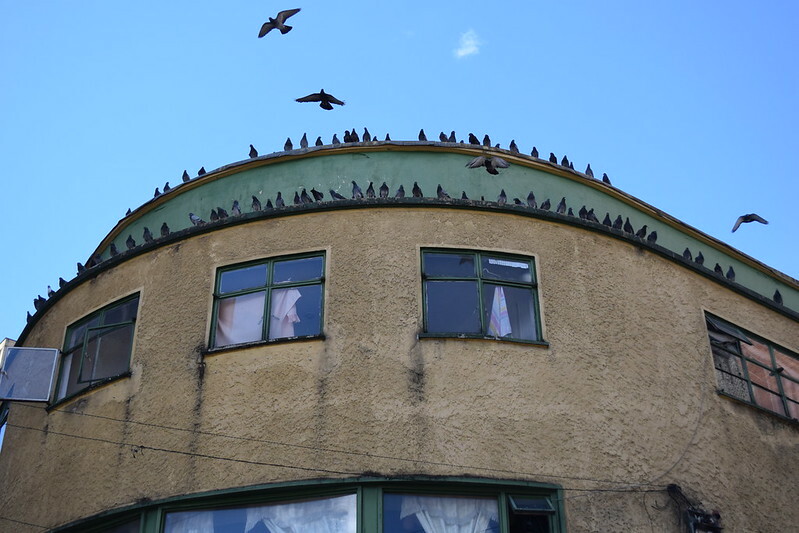 I recommend stopping off at different points within the city center, to get a birds-eye-view of the different attractions. 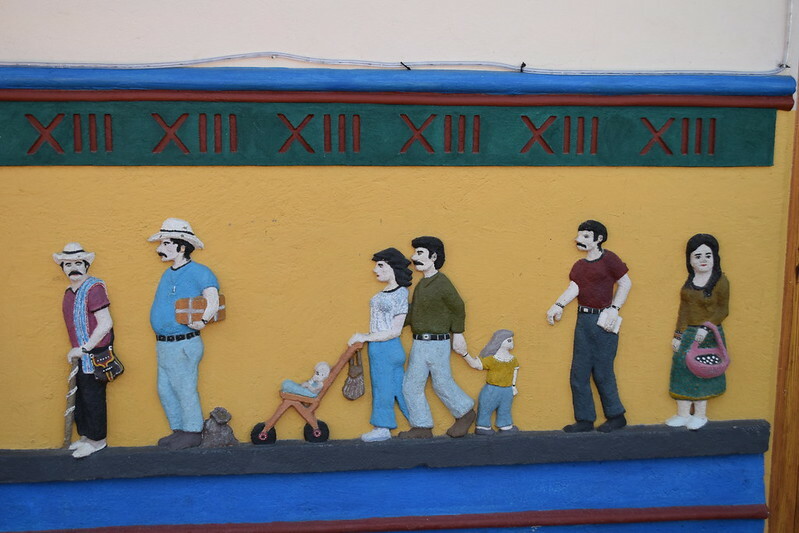 Thankfully Juan was also able to put his life back together as well. 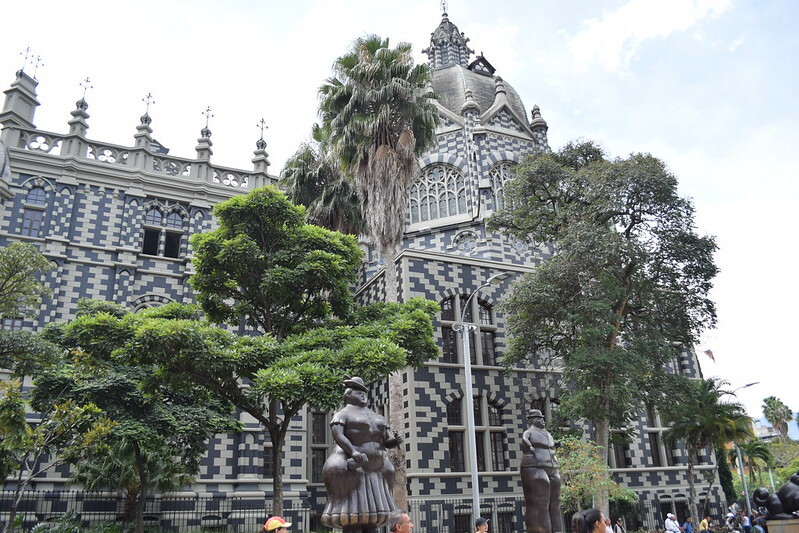 He became a tour guide and even got remarried. 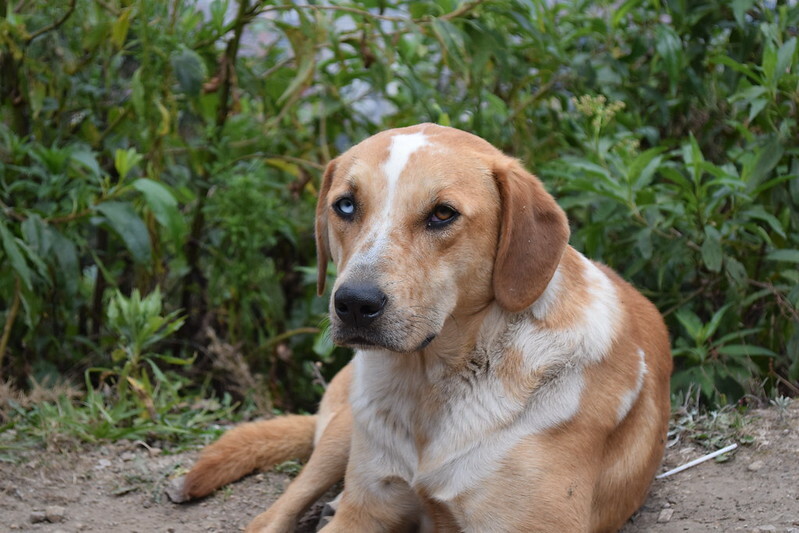 He says she is his one true love. 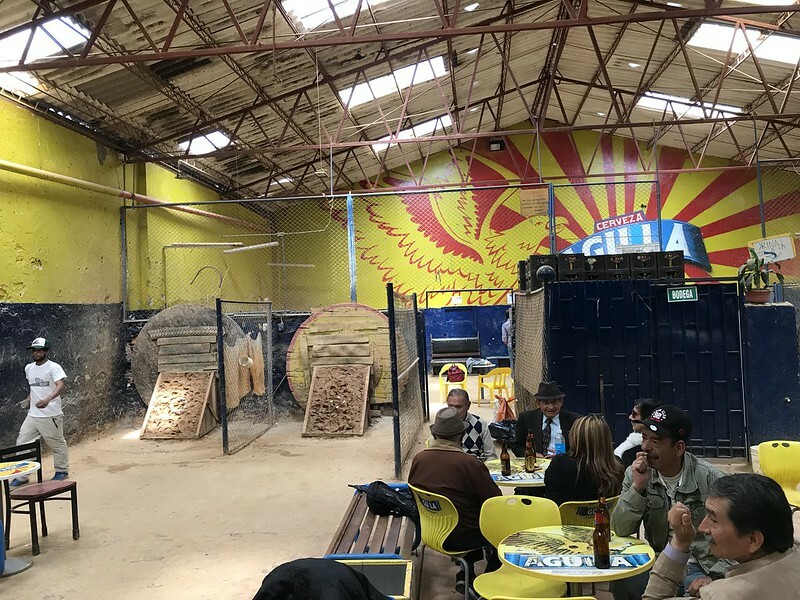 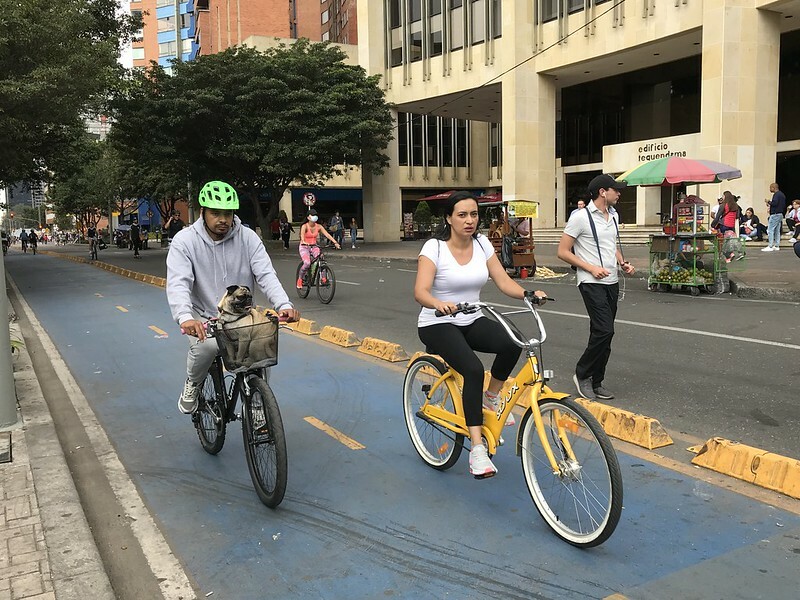 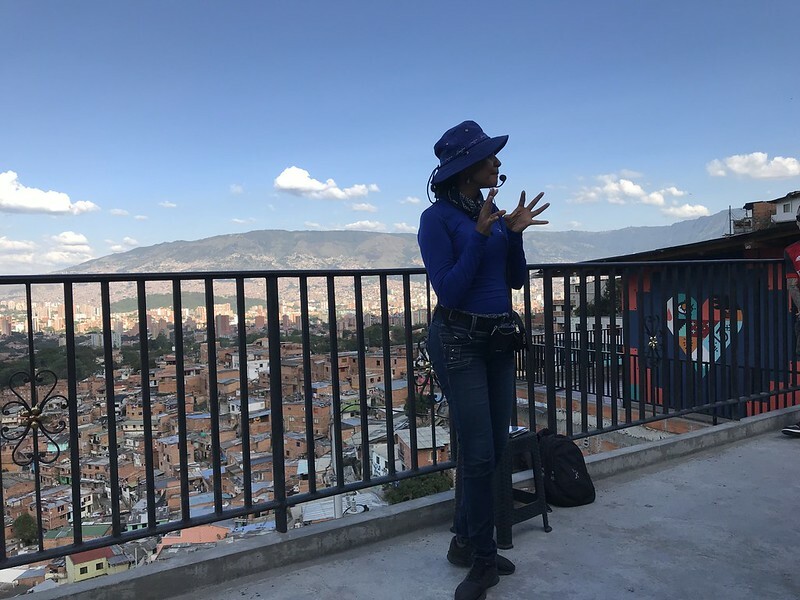 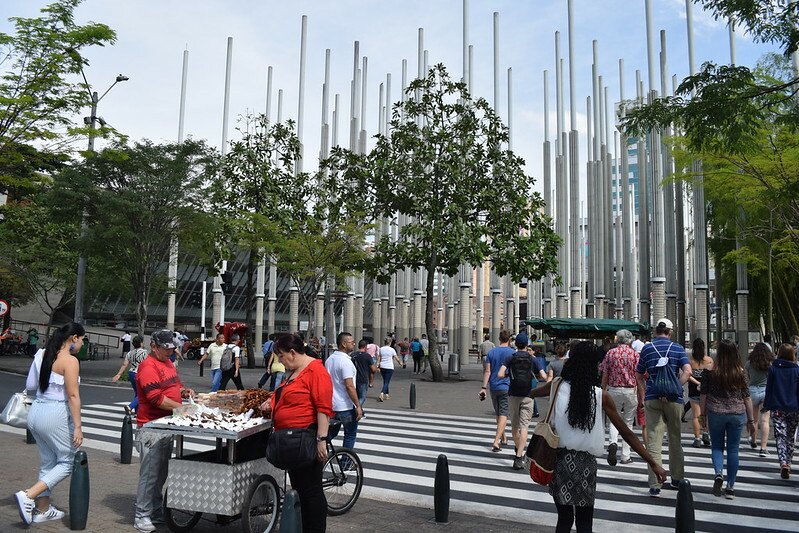 💓 In addition to the metro, Medellin also helped improve the city center by filling up empty spaces that were once areas of violence and crime. 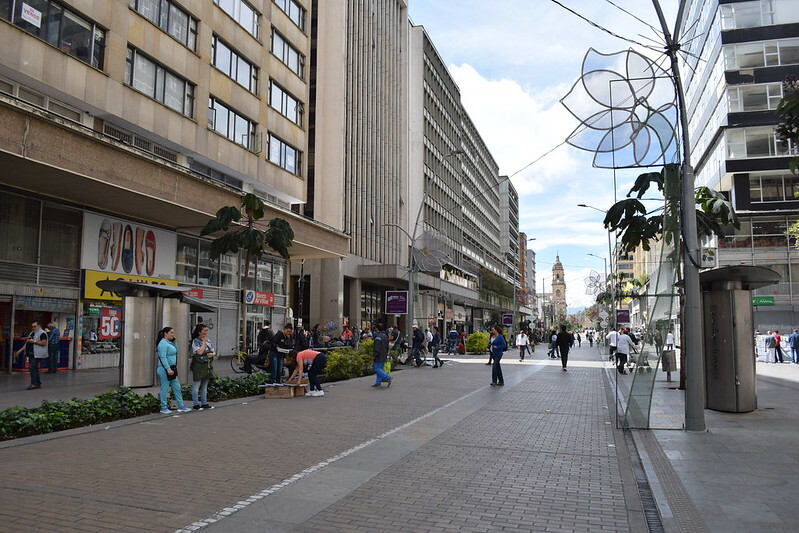 For example, 300 massive illuminated concrete columns were installed in order to create a positive energy in the downtown. 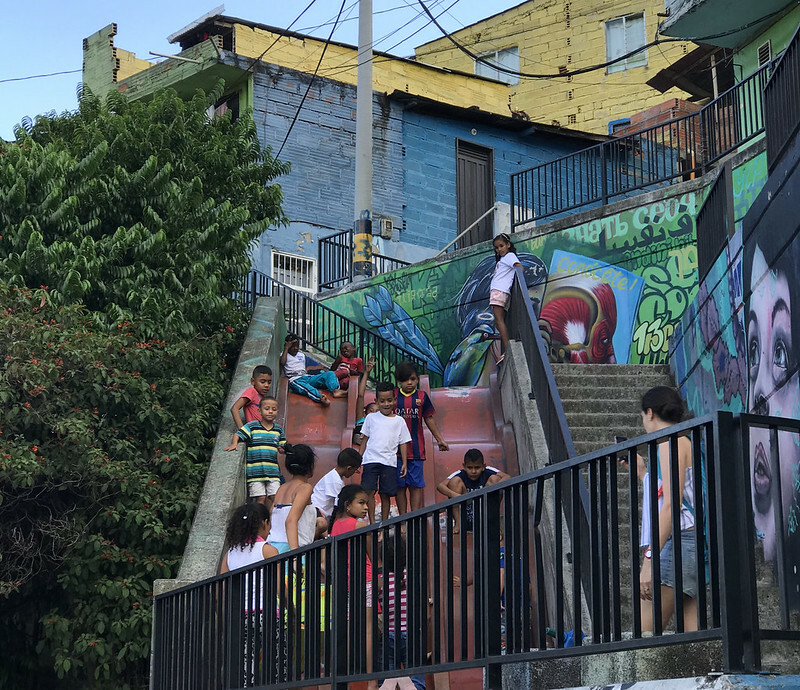 This area was once infiltrated with drug users and prostitutes, and is now home to a free community library, and is a popular gathering space for families, businessmen, and local food vendors. 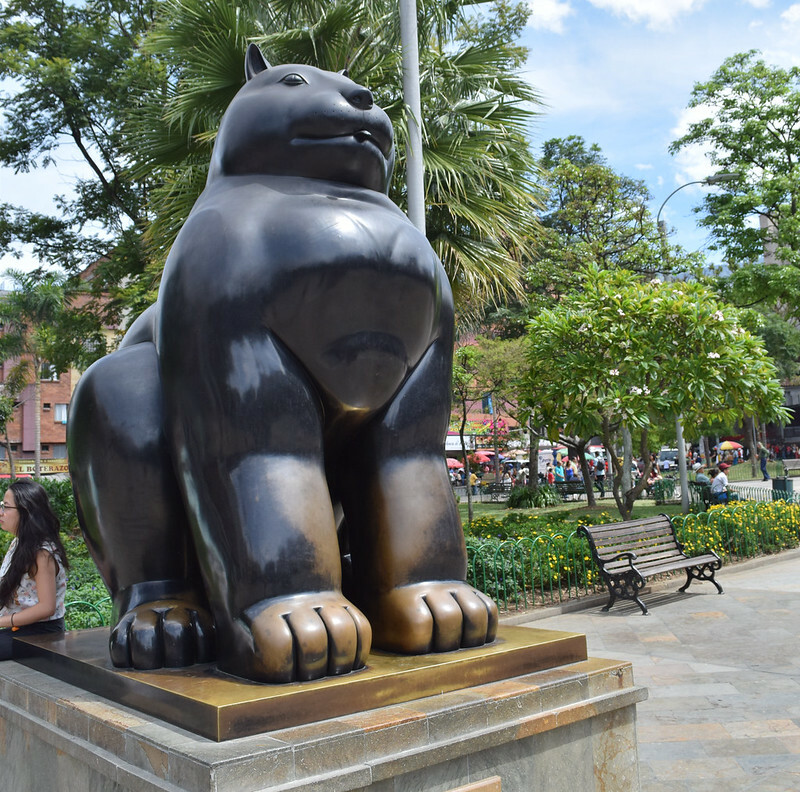 Another positive space for Medellin locals to enjoy is Botero Park. 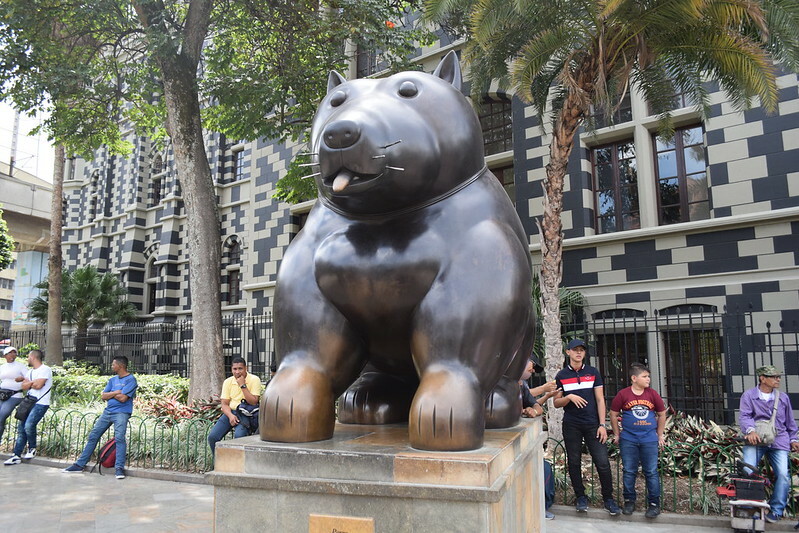 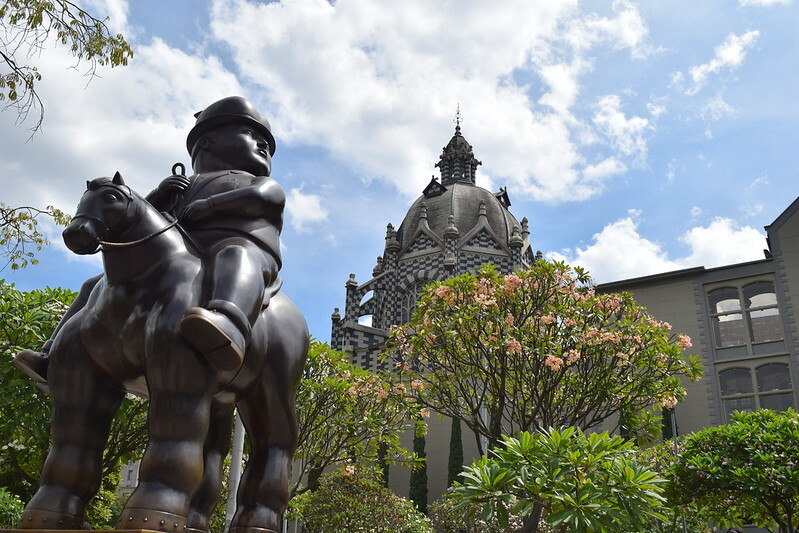 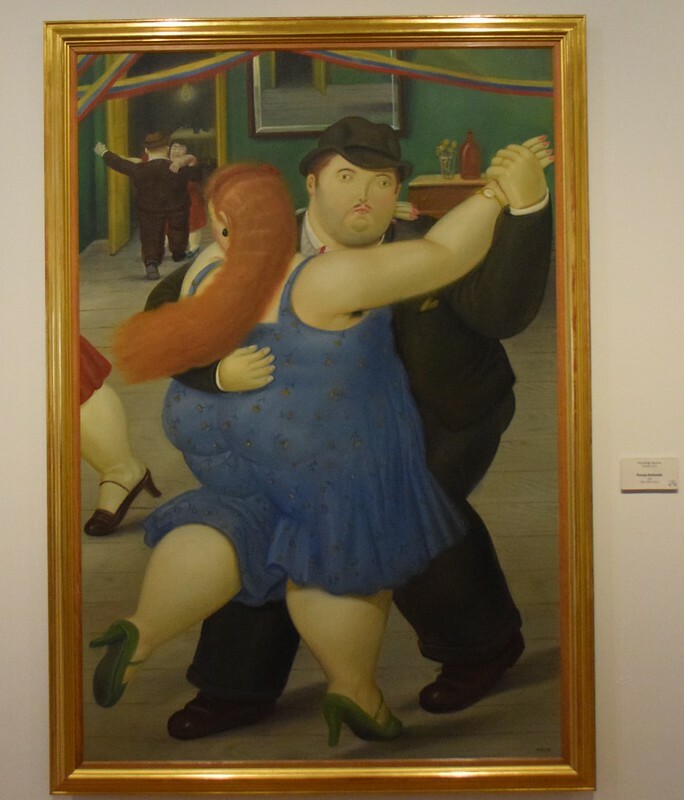 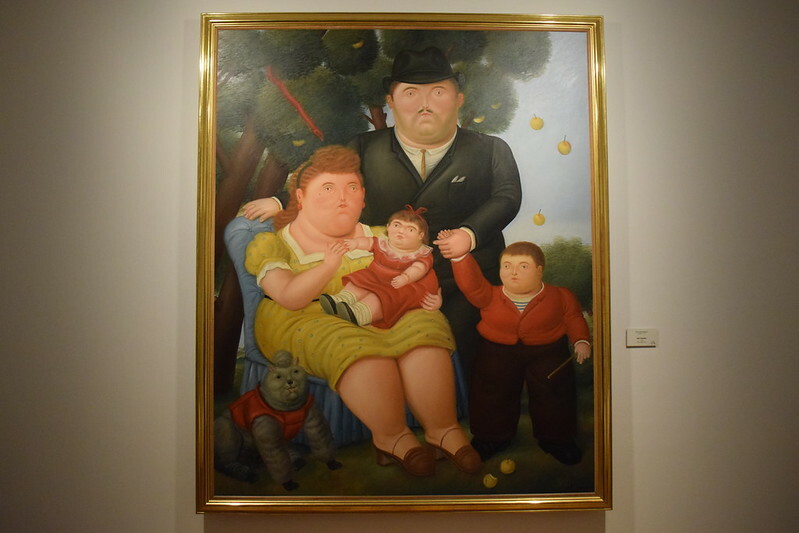 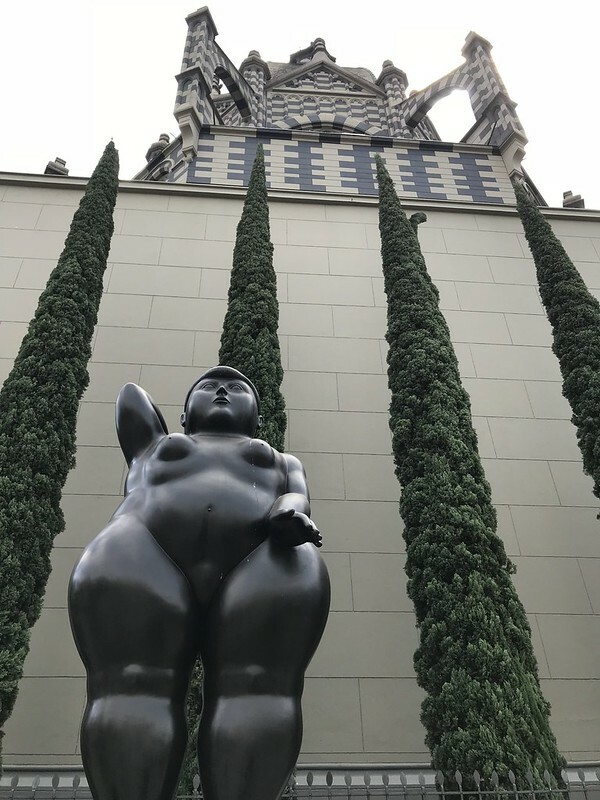 Fernando Botero is a famous Colombian artist who has donated numerous metal sculptures to the city of Medellin. 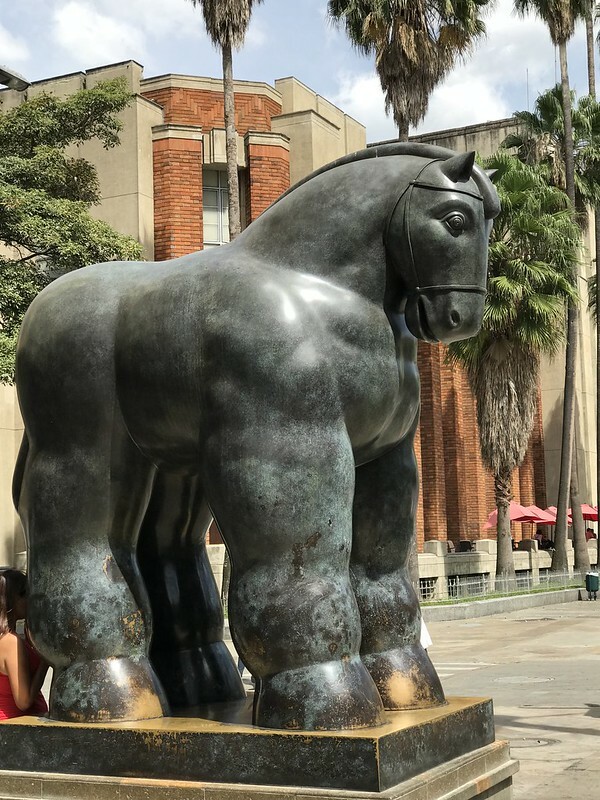 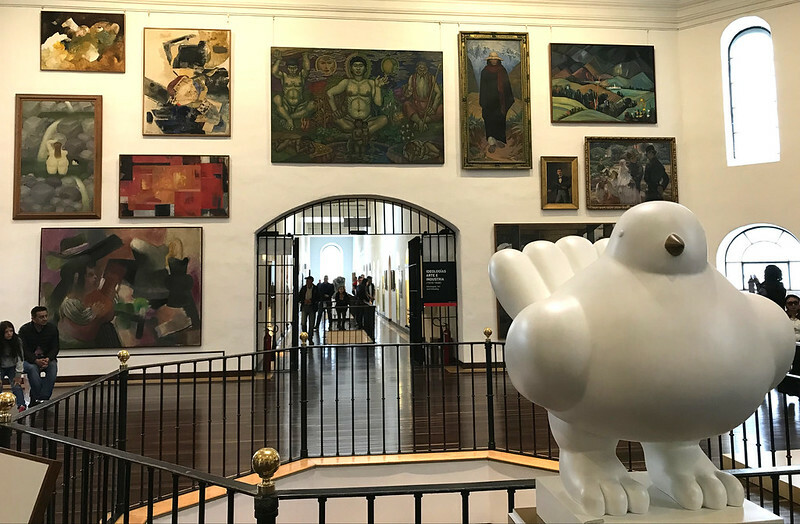 His curvaceous sculptures of both animals and humans represent a non-realistic reality with very disproportionate features, like large women with tiny hands and stocky horses with minute heads. 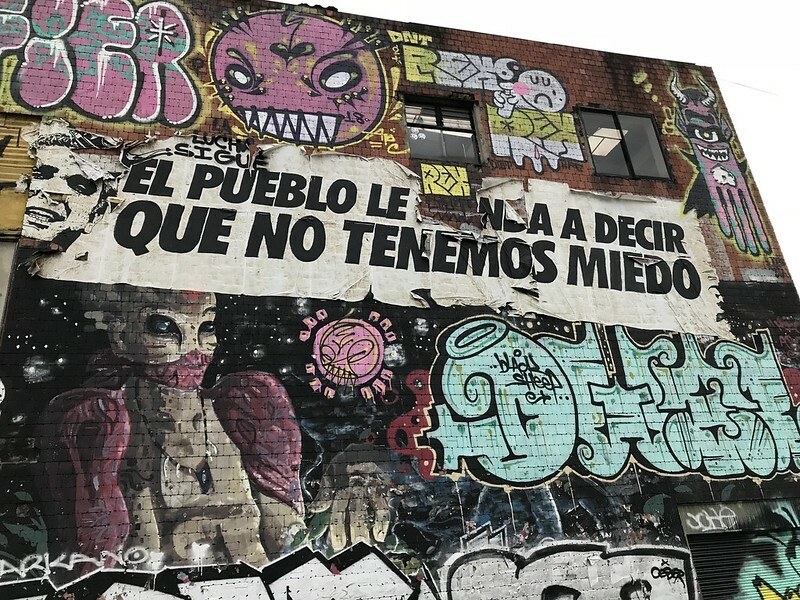 At that point, the community started to show resistance. 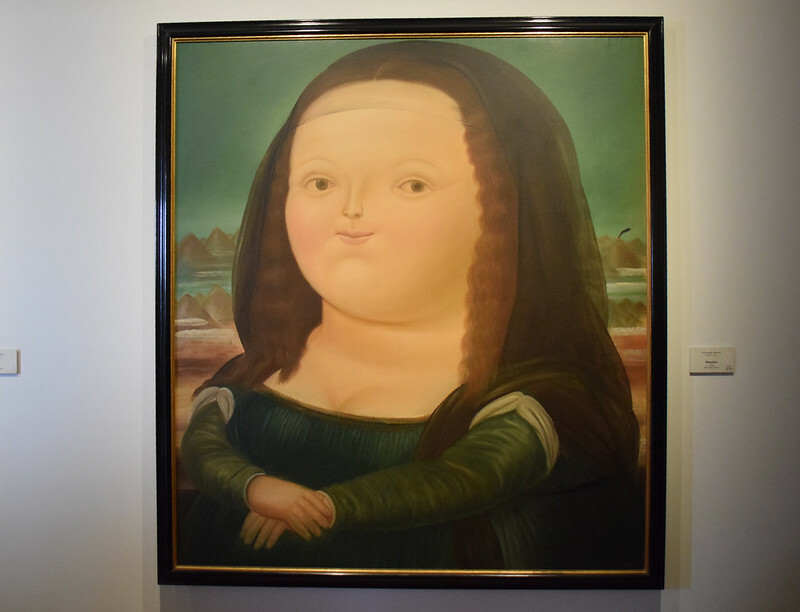 They began to use art as a way to show their disapproval of the situation. 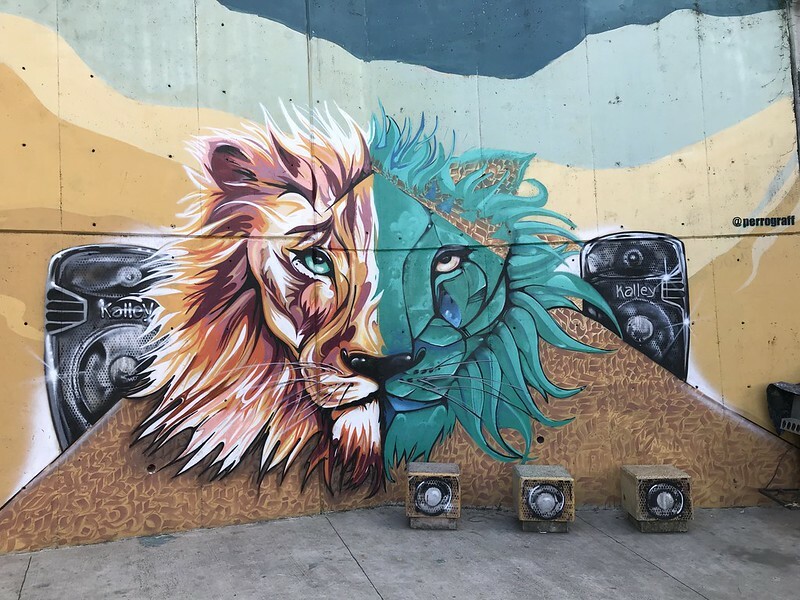 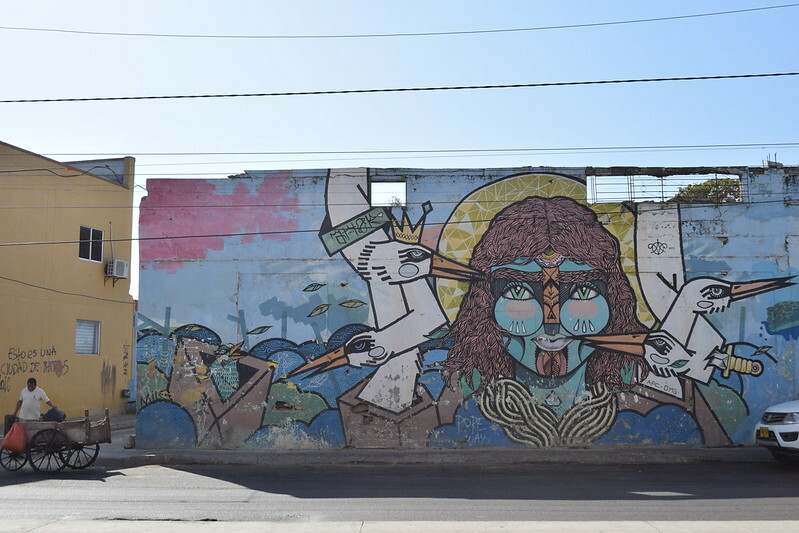 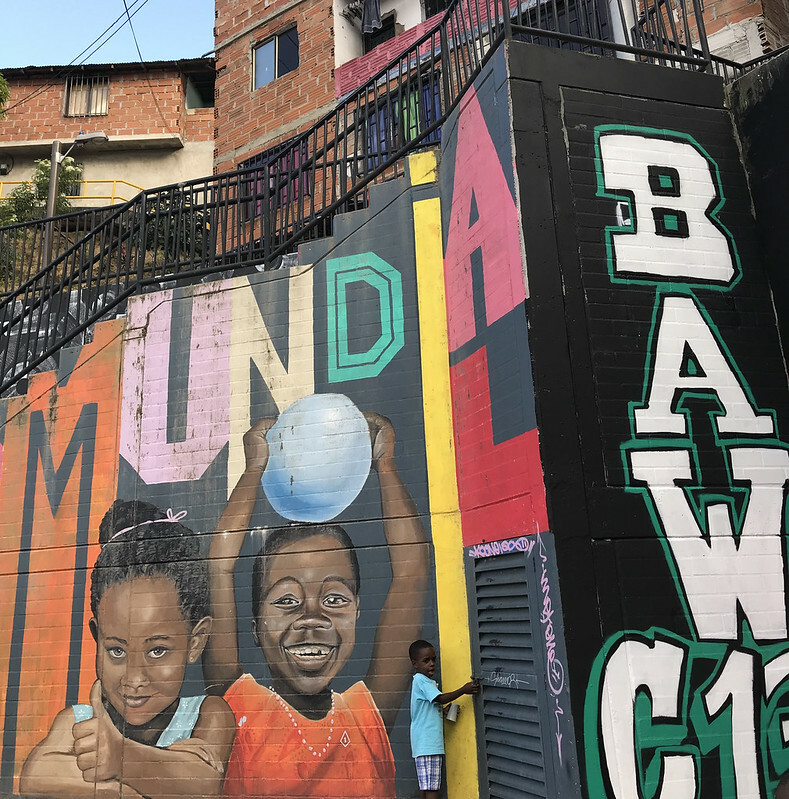 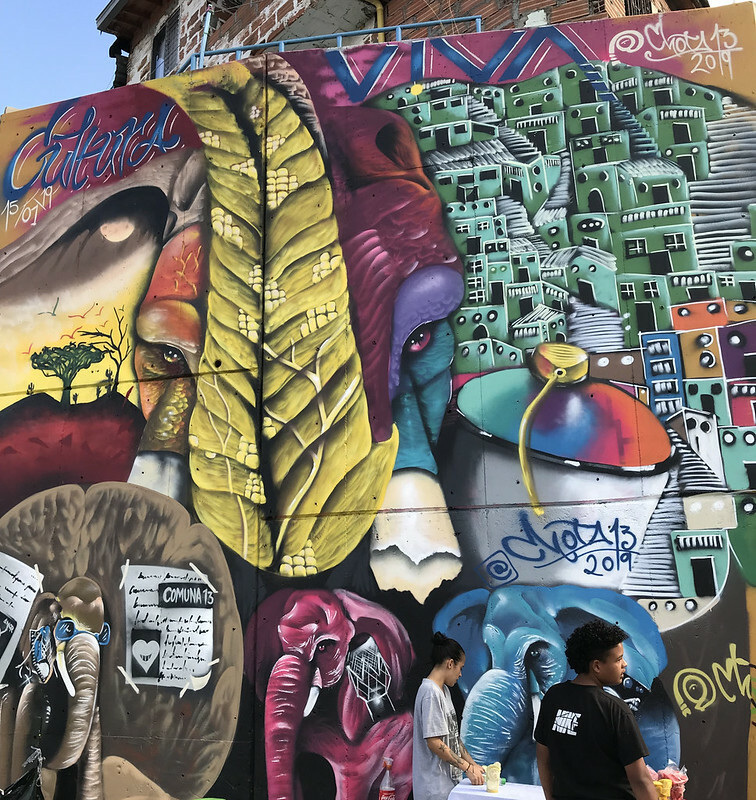 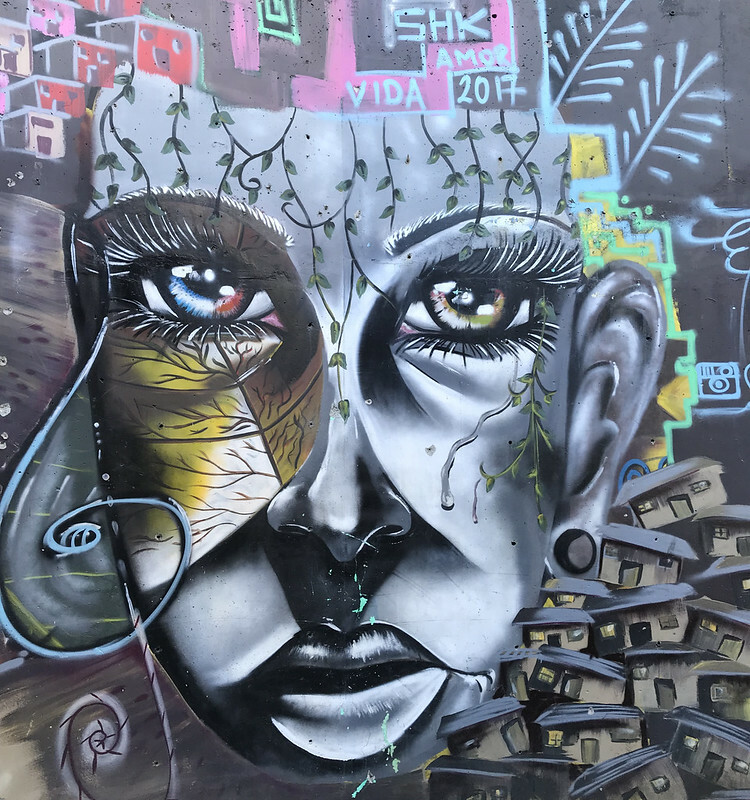 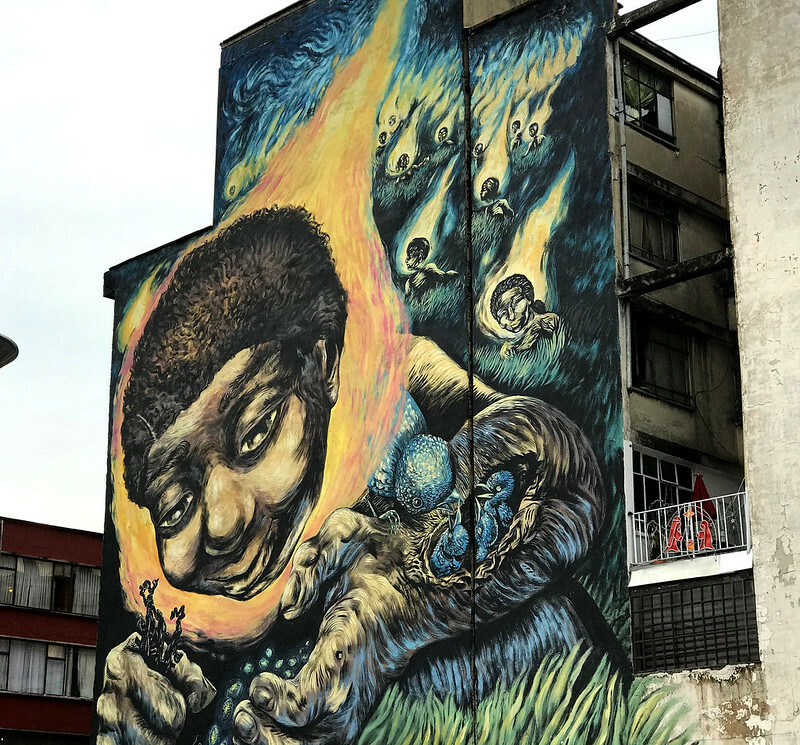 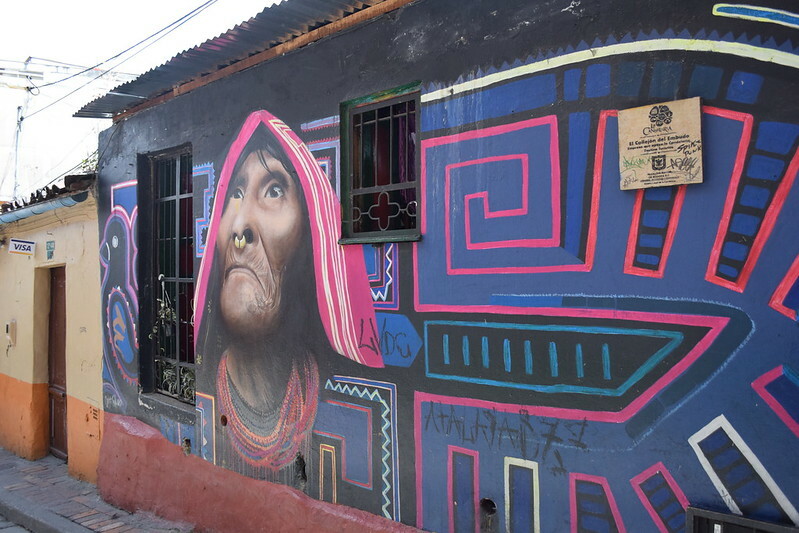 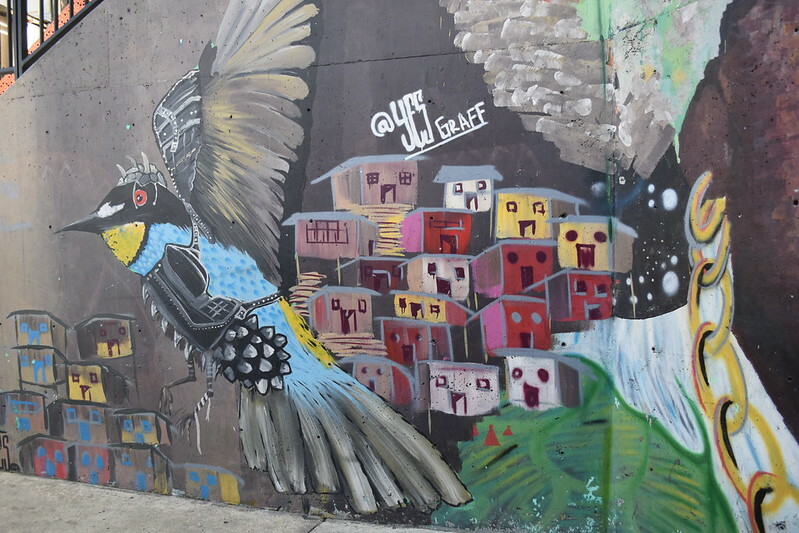 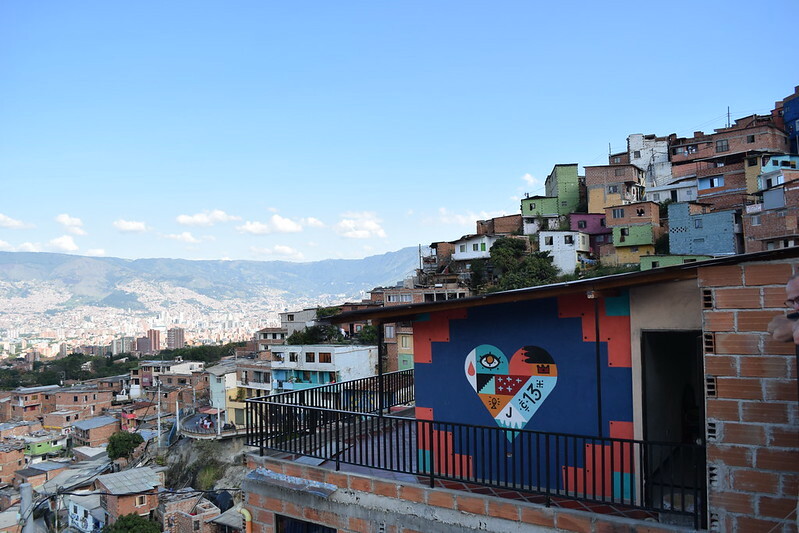 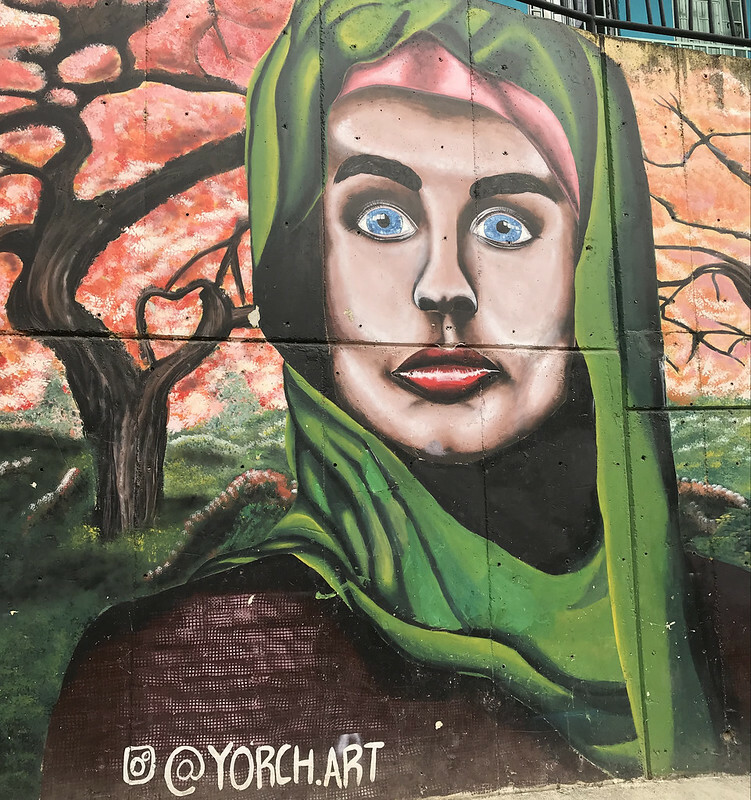 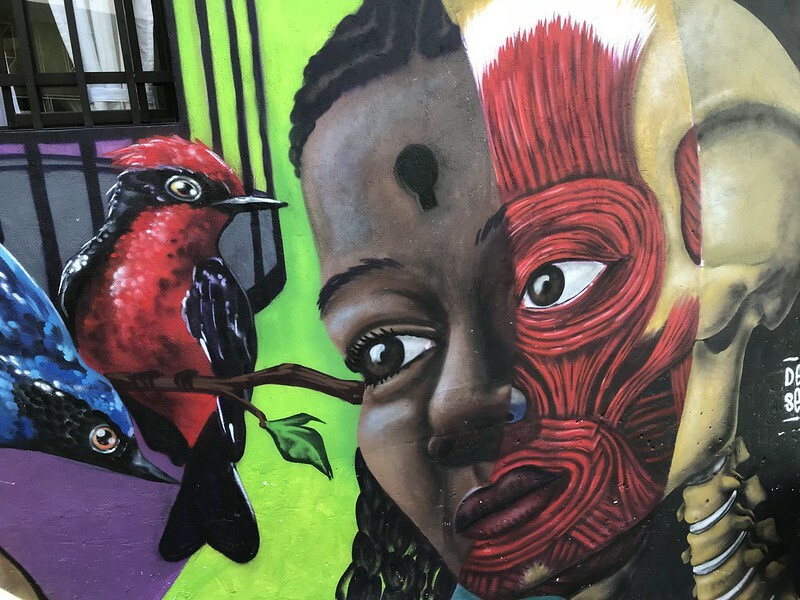 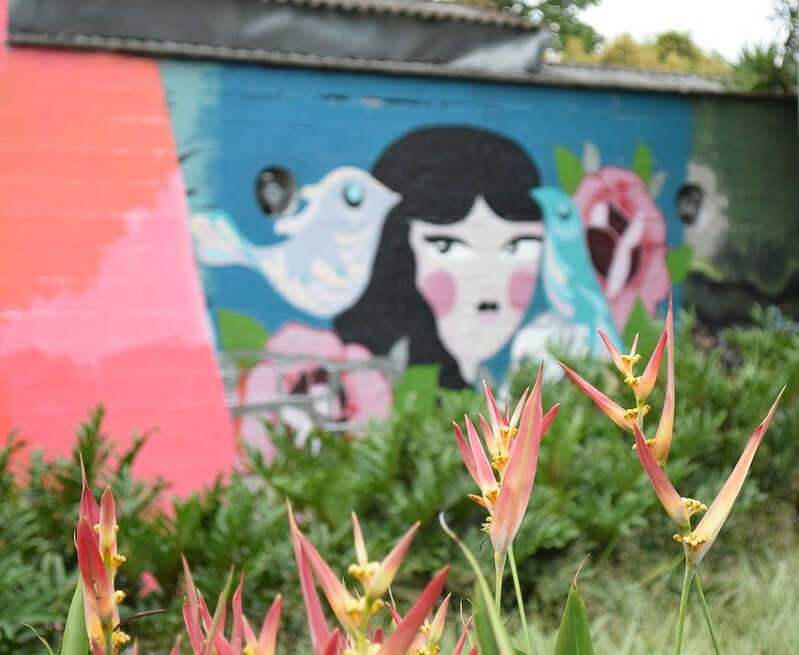 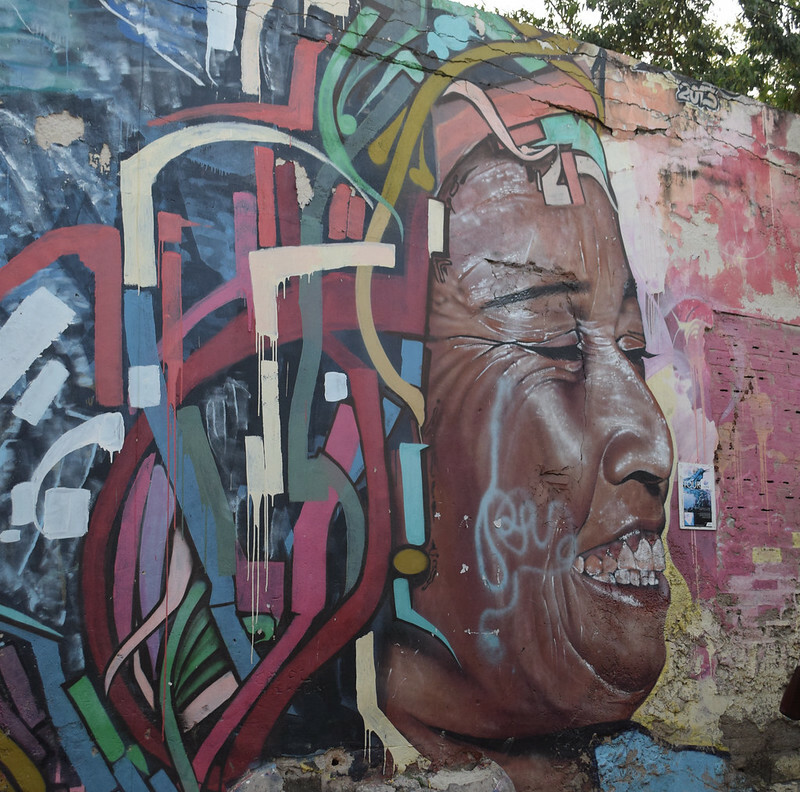 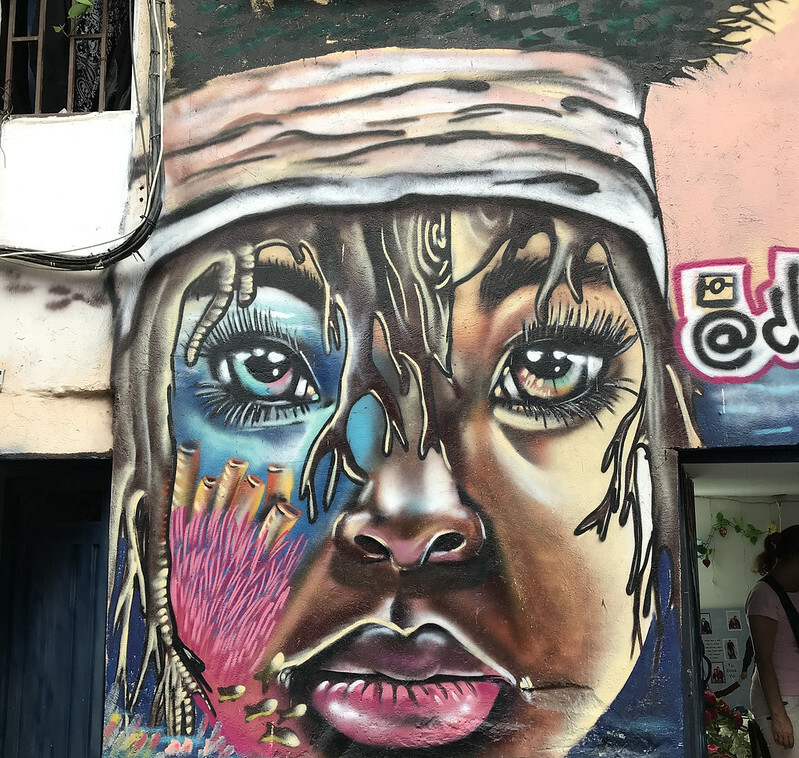 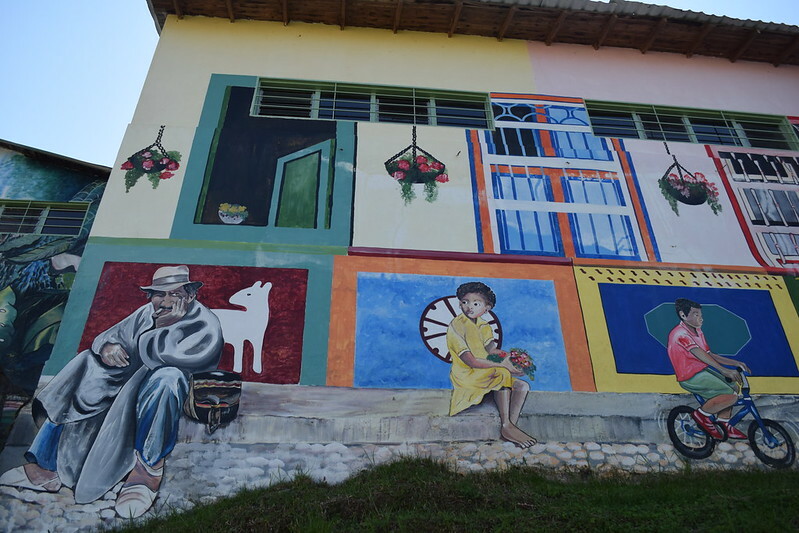 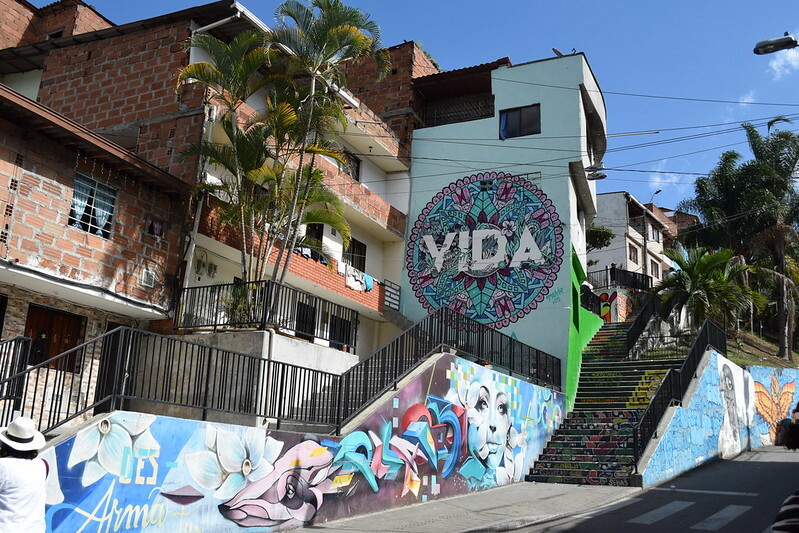 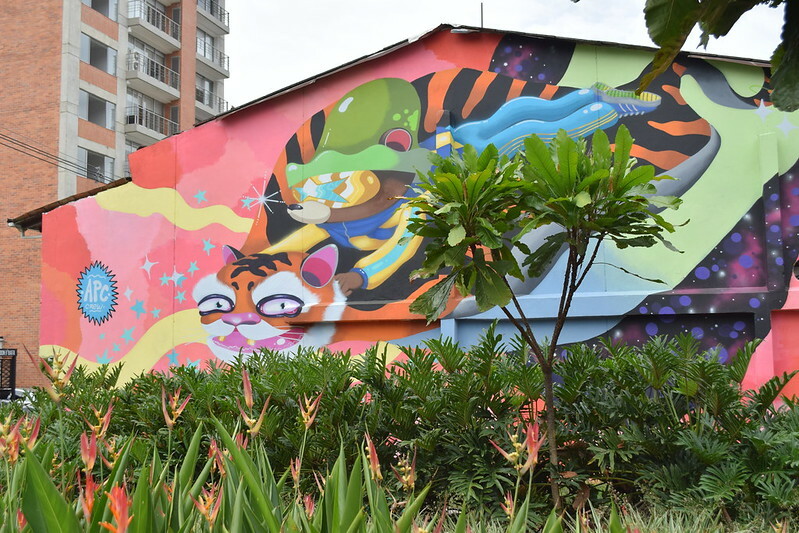 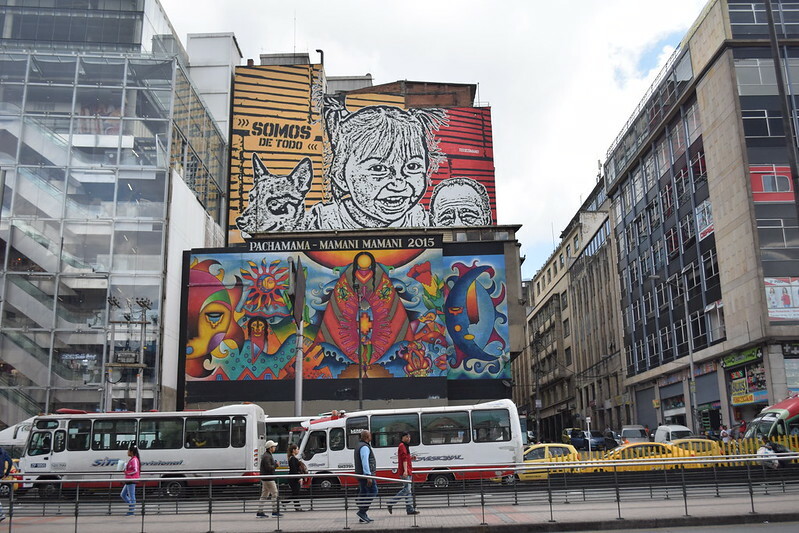 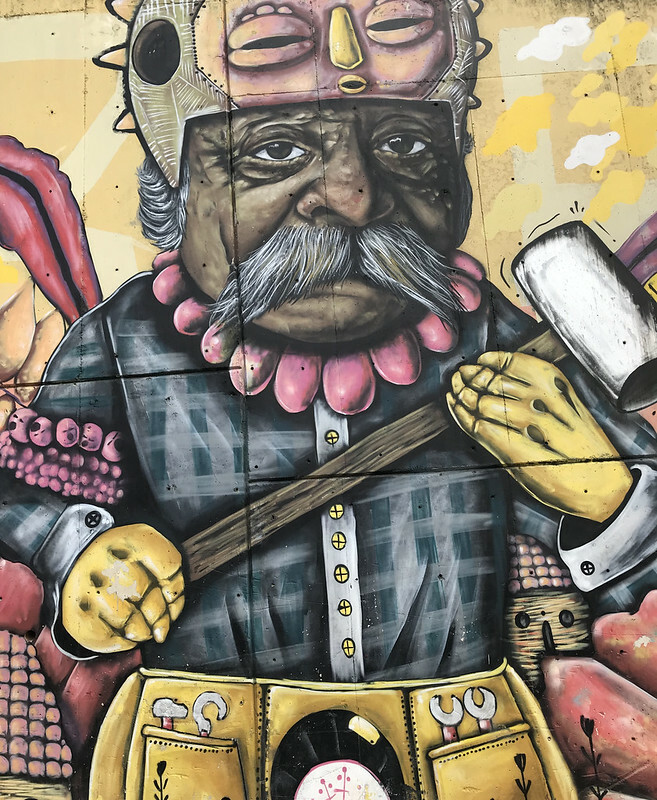 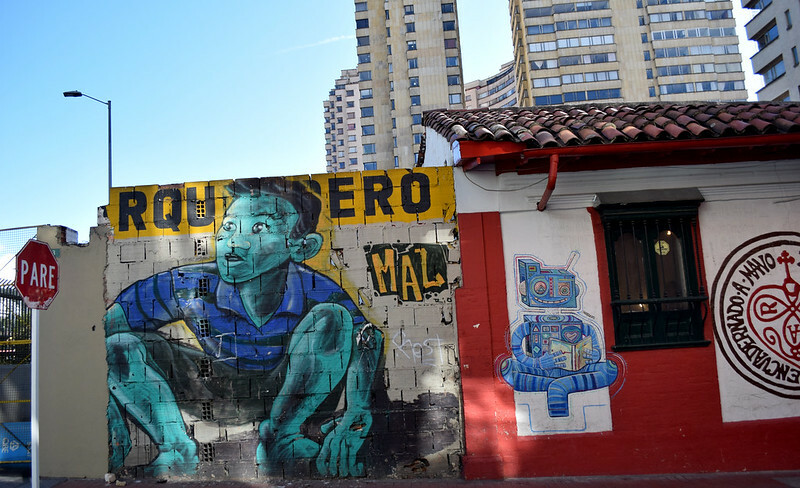 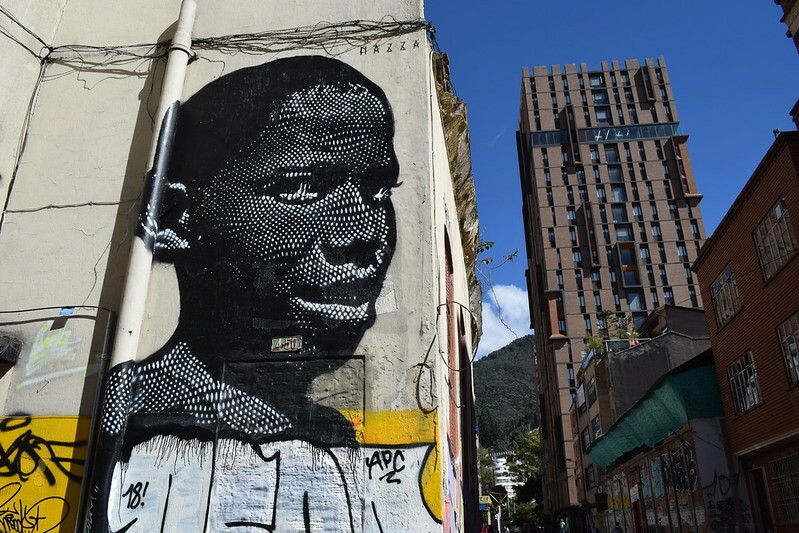 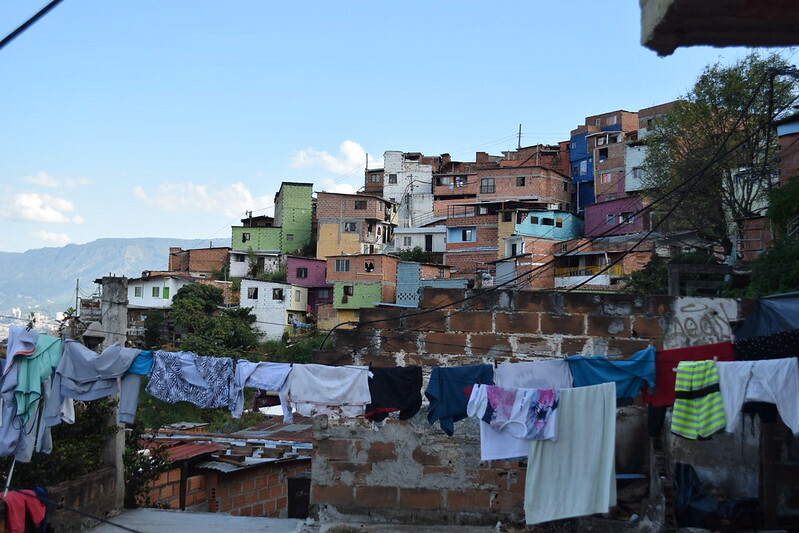 Murals began to overtake the buildings in Comuna 13, many of them with a split face representing the dark times of the past and the hope for a prosperous future. 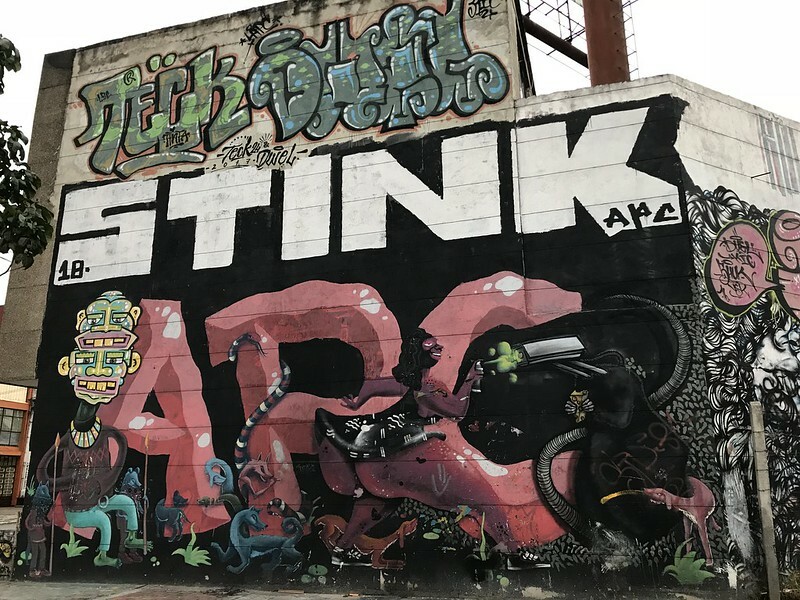 Over time, the community has really made a name for itself. 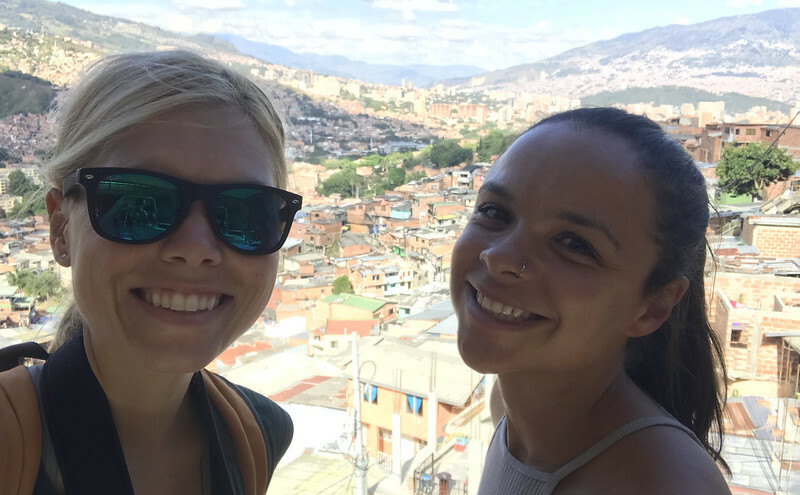 Our guide, who learned to speak English through local volunteers in the area, says she is now proud to say she is from Comuna 13. 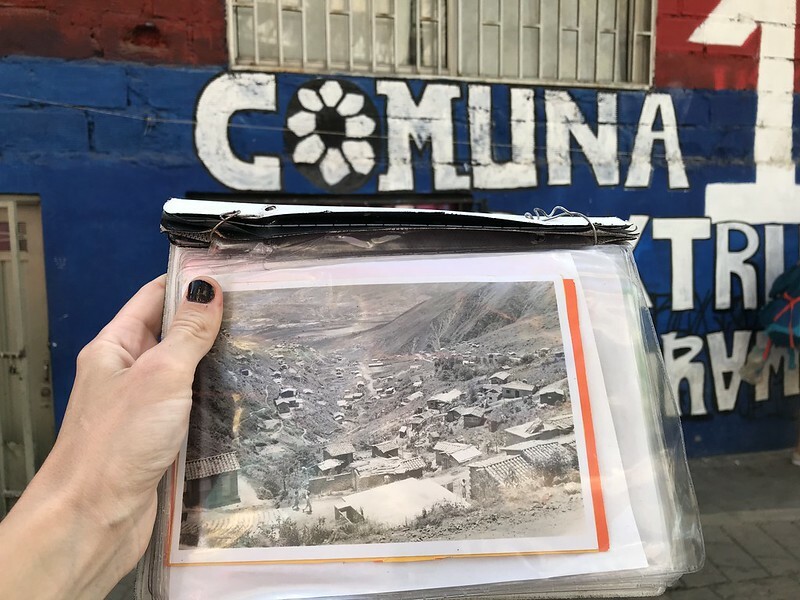 She no longer feels shameful to be from this place. 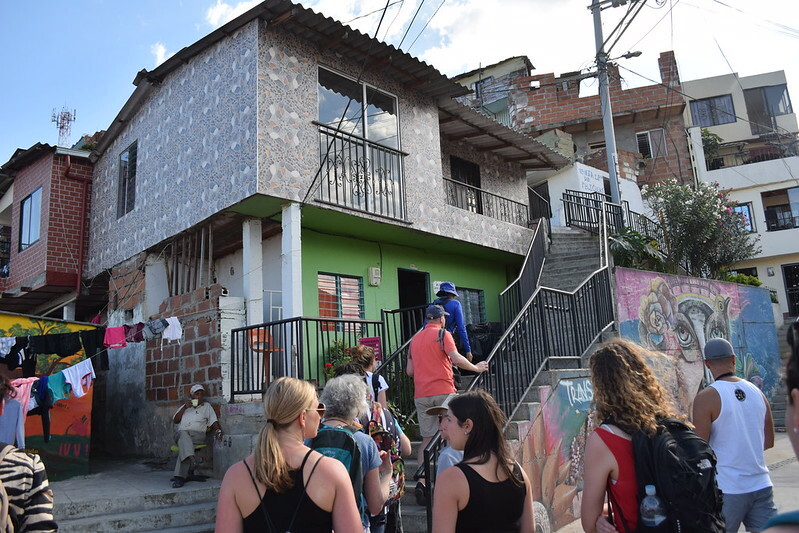 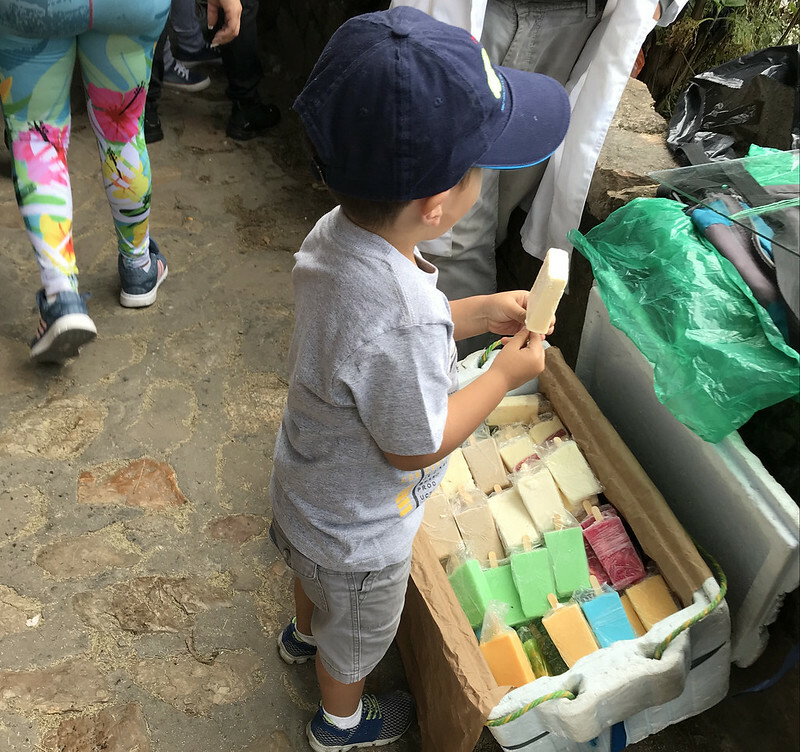 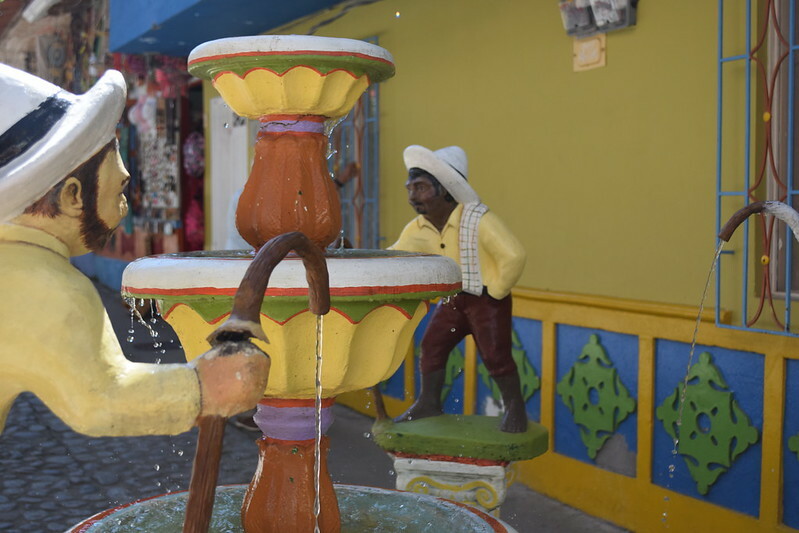 It has become a place of artistic inspiration, with daily tours of the neighborhood, where people purchase local goods and support the local community. 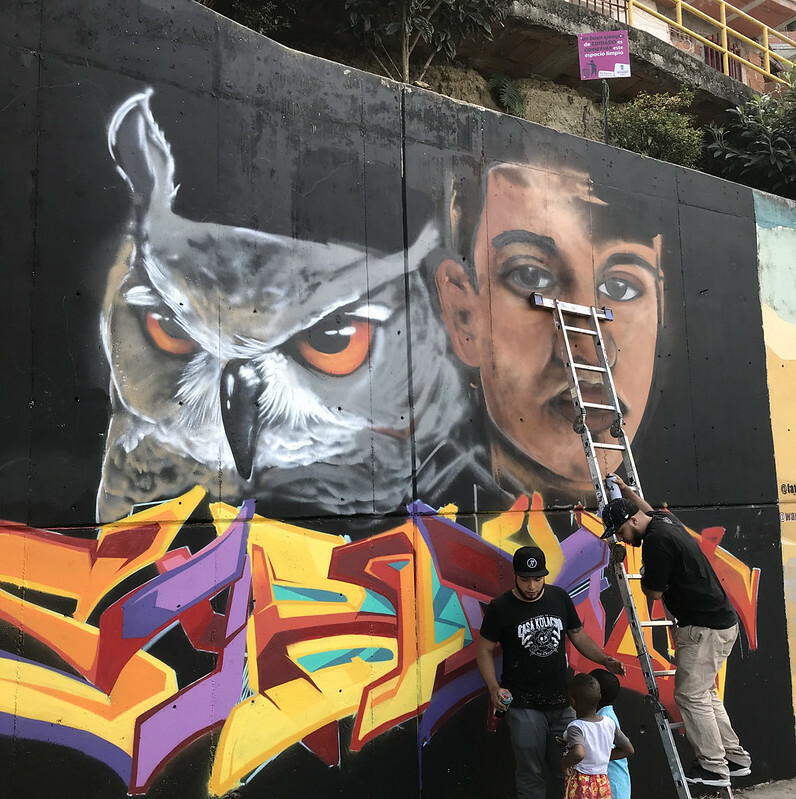 Kids can now be seen playing in the parks, street performers dancing to hip hop, and lots of inspirational artwork in progress. 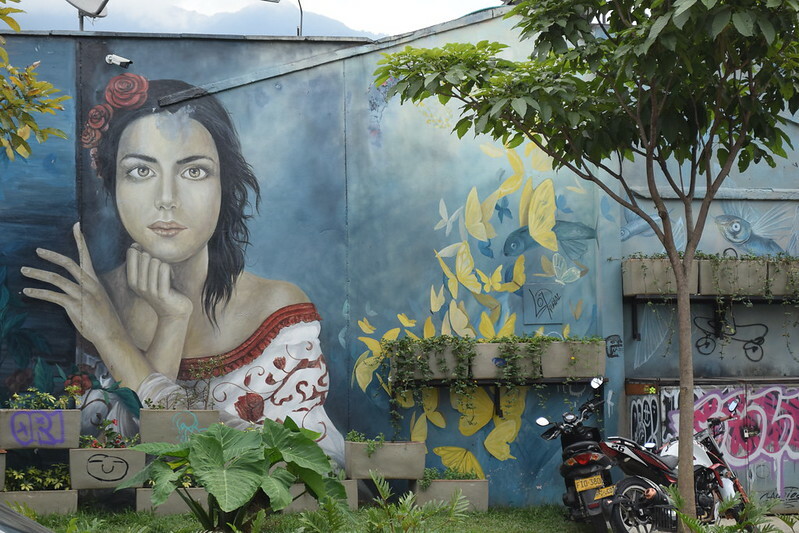 In terms of grub, after a long day of walking in Medellin, I’d highly recommend visiting Ajiacos and Mondongos. 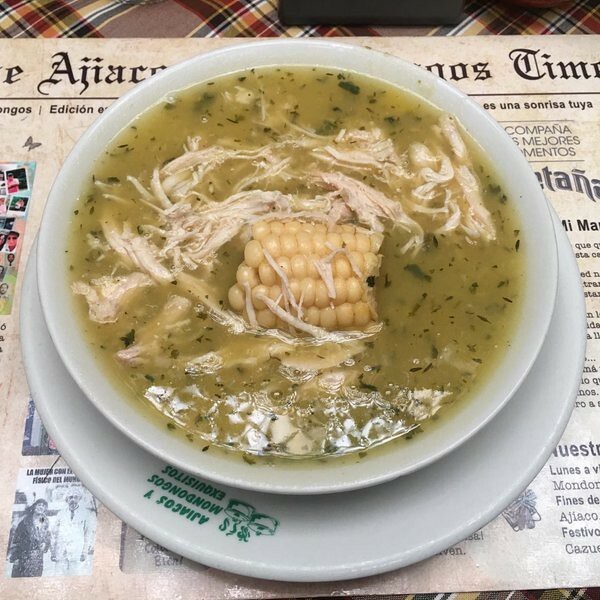 Ajiaco is a delicious stew made with chicken, potato and corn. 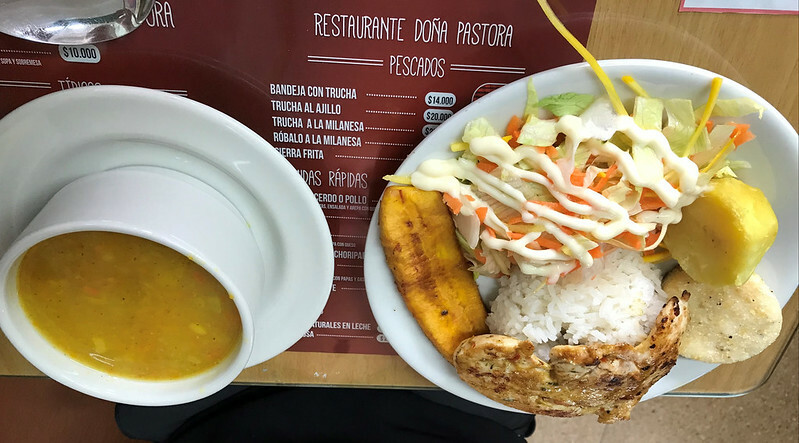 For the more adventurous, mondongo is a tripe stew. 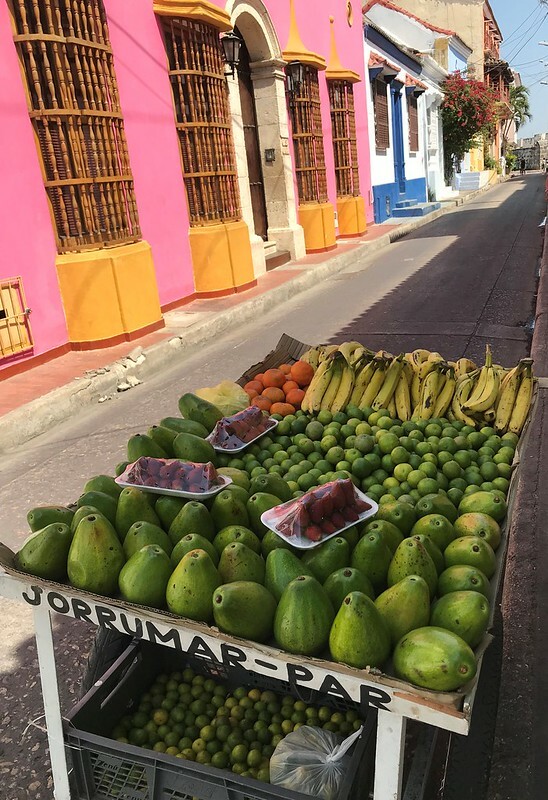 As a budget traveler, I also frequented the grocery stores often. 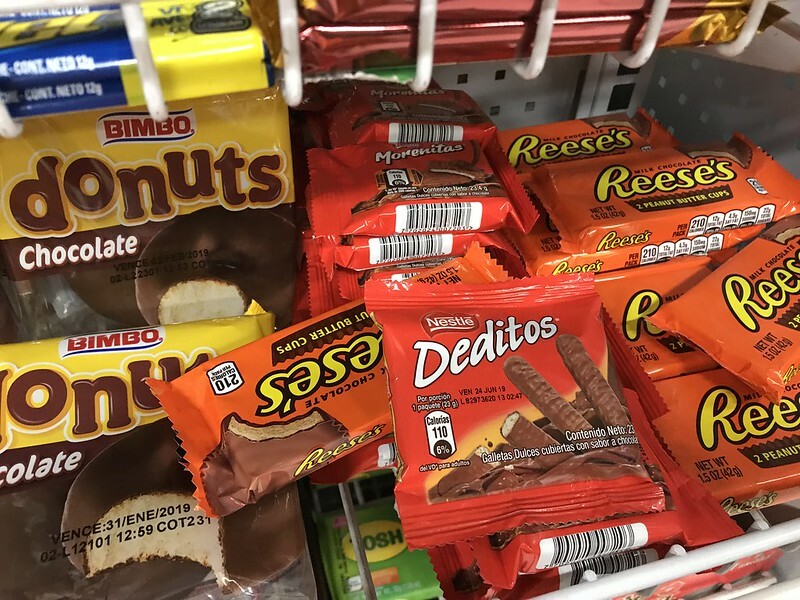 I found Carulla and Exito to be popular supermarket chains. 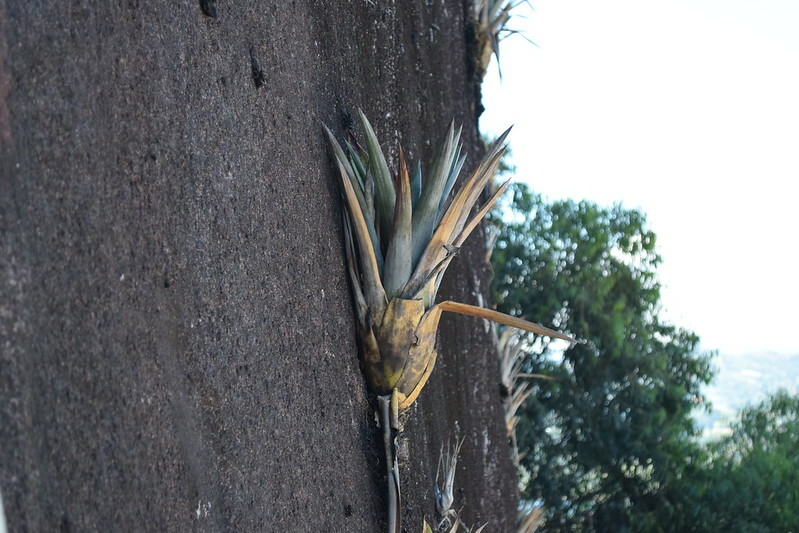 Nobody knows exactly how it got there, but its most likely the result of a volcanic eruption. 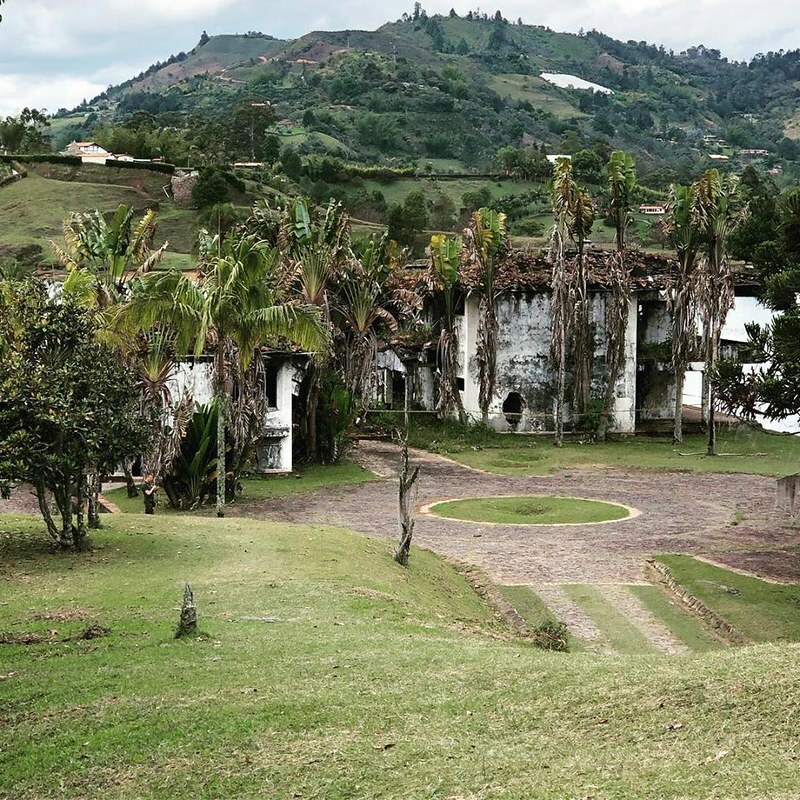 Because of its immense size and mysterious origin, it has also become a major site for worshipers. 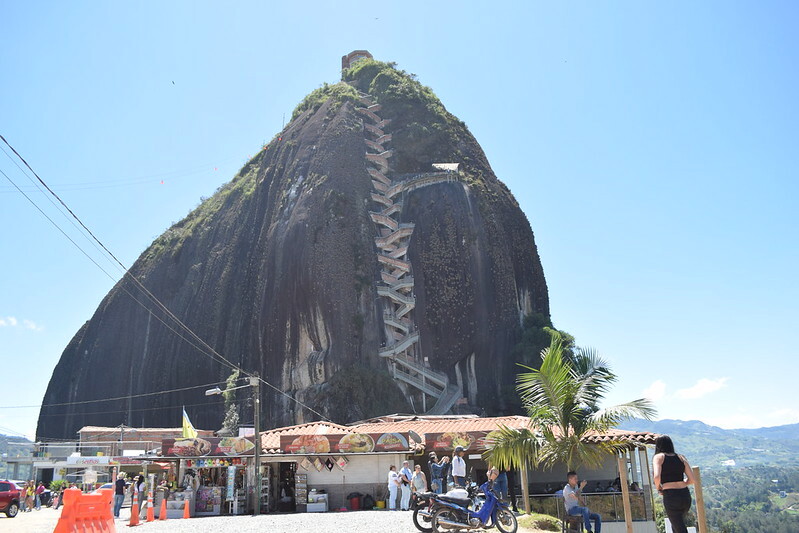 To climb the monolith, you must ascend a series of over 700 stairs on one of the most bizarre staircases I’ve seen yet! 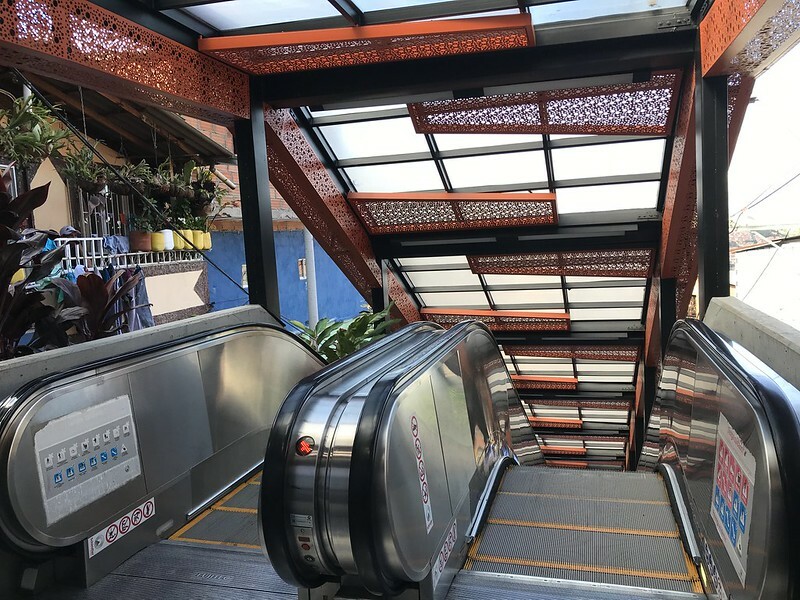 😮 The entry fee is around 6 USD, which at least gives you peace of mind to know that the staircase receives regular maintenance. 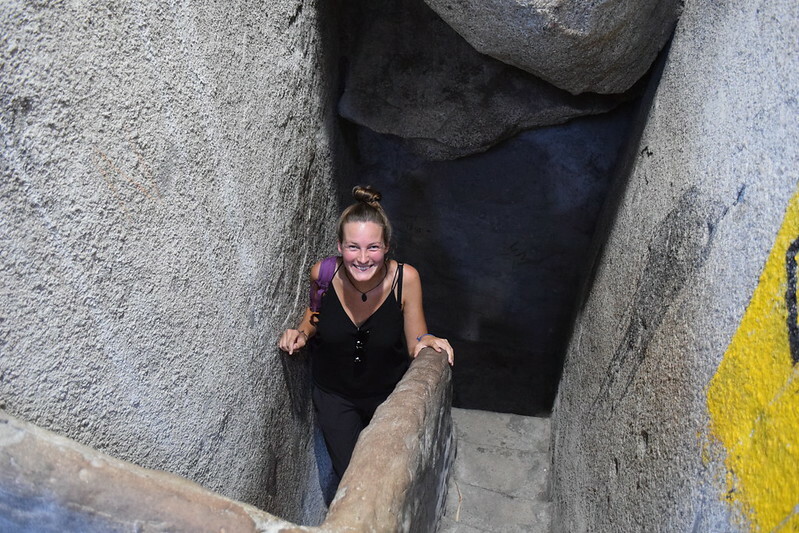 I climbed with this German girl I met at the bus station. 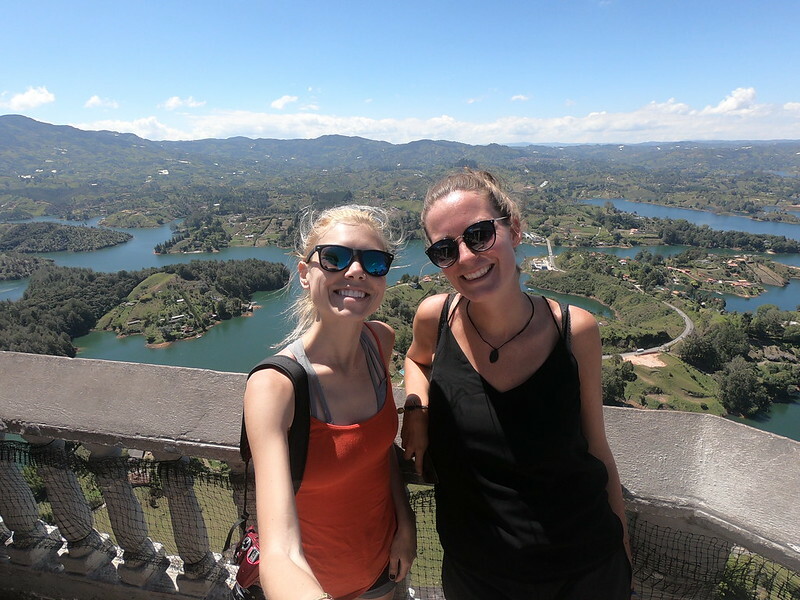 The two of us felt quite out of shape, but we took it slow and steady, and stopped to enjoy the views at many points along the way. 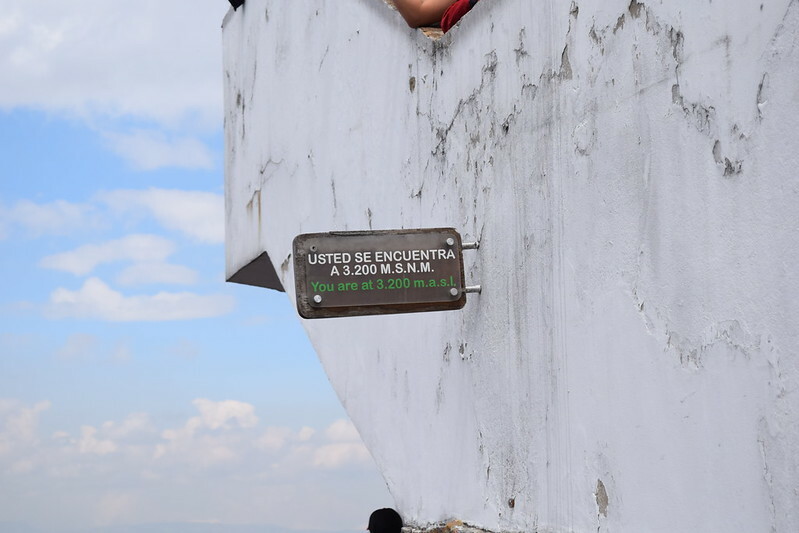 Finally, at the top, we were rewarded with unobstructed views of the surrounding region. 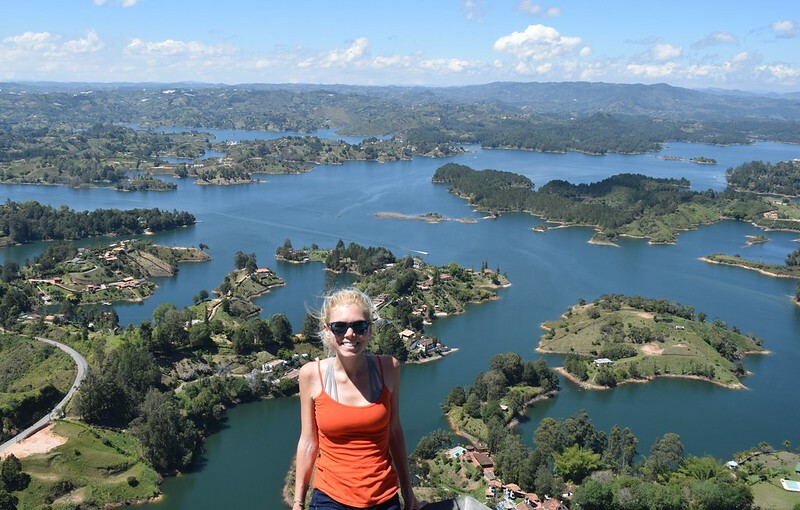 Another absolutely spectacular VISTA! 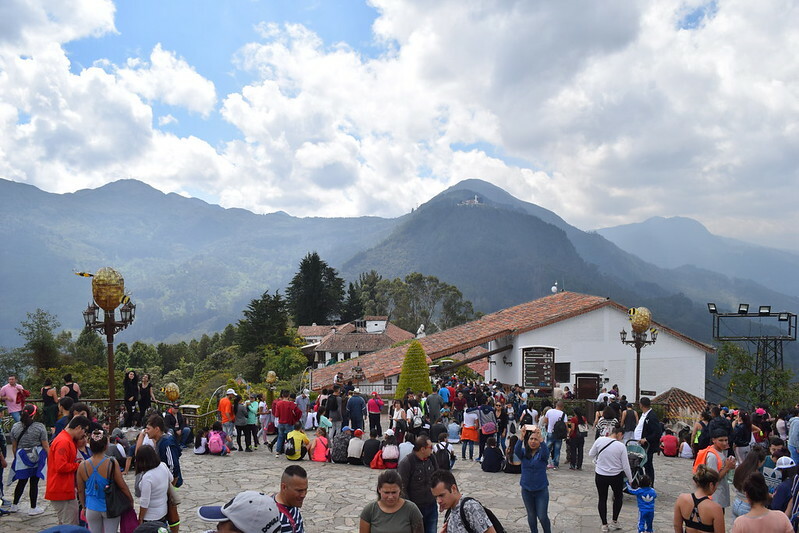 😍 They also had souvenir shops and a few restaurants at the top for you to enjoy before heading back down. 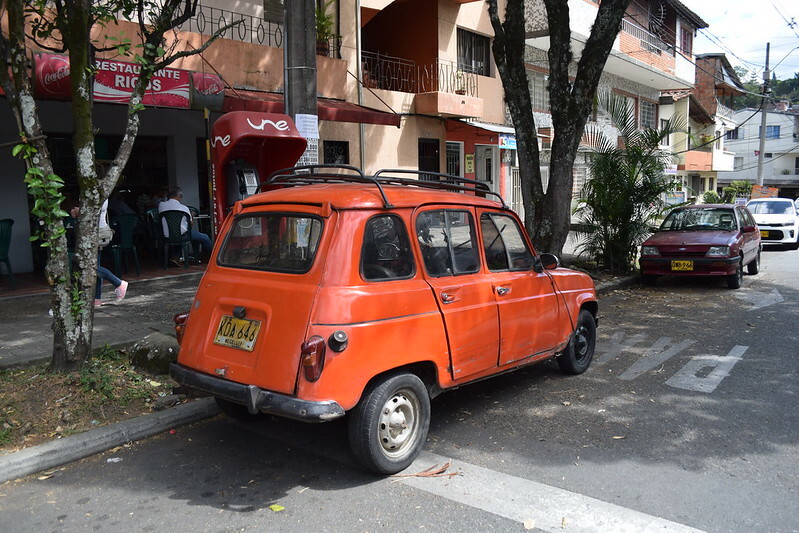 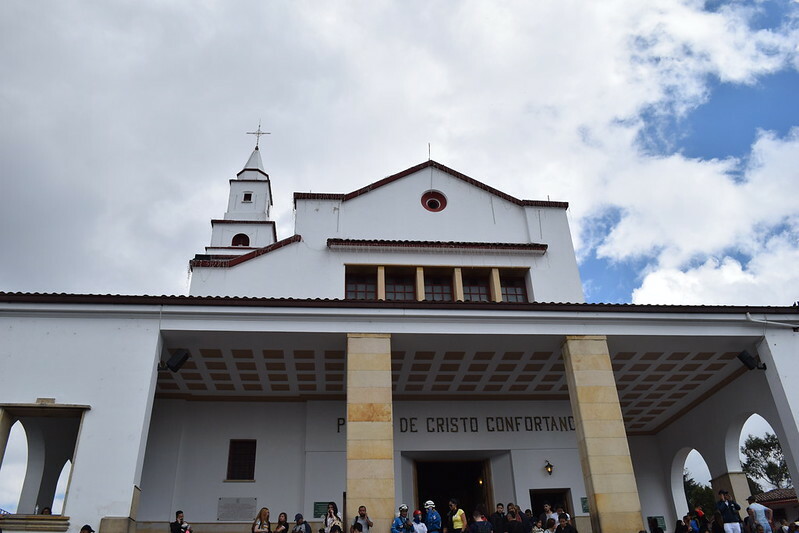 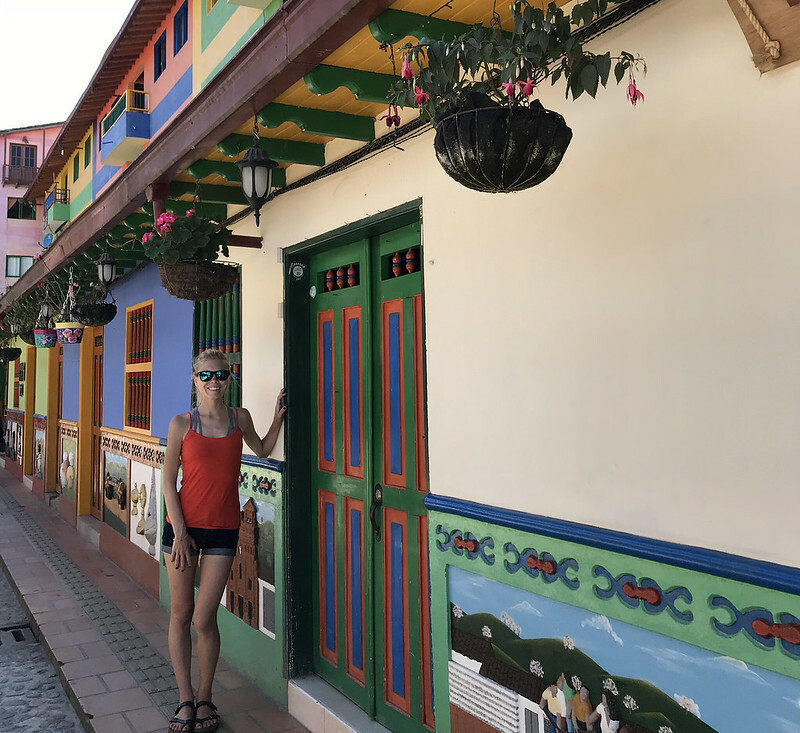 We opted to head to the city of Guatapé, where we wandered around for a bit before taking lunch at a local hole in the wall. 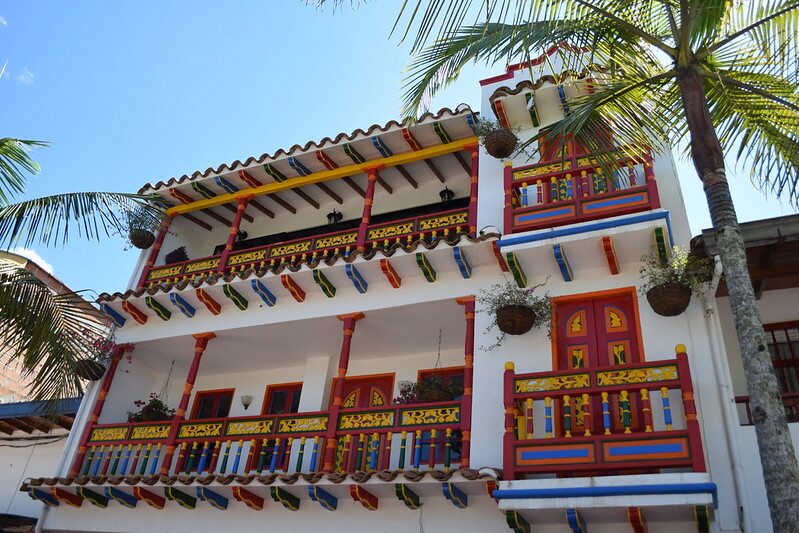 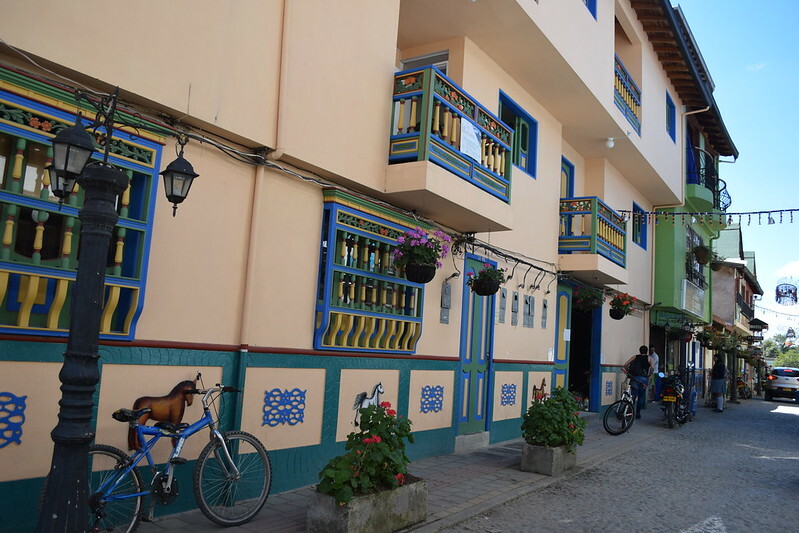 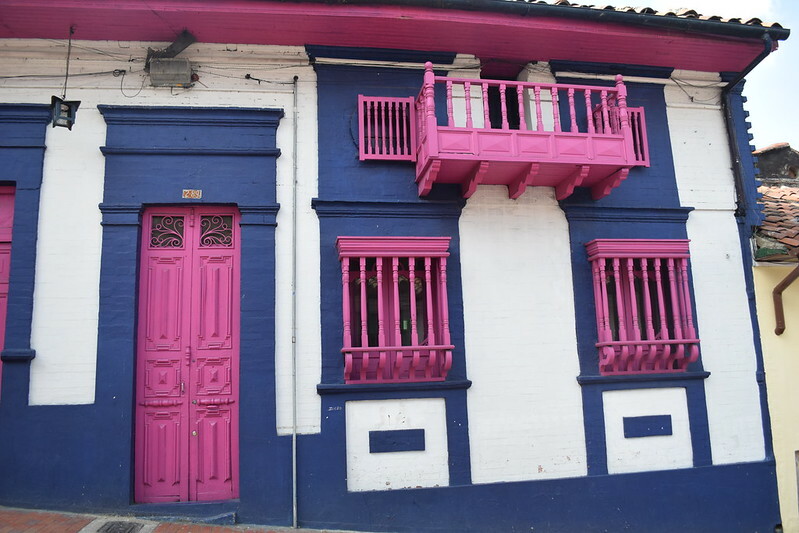 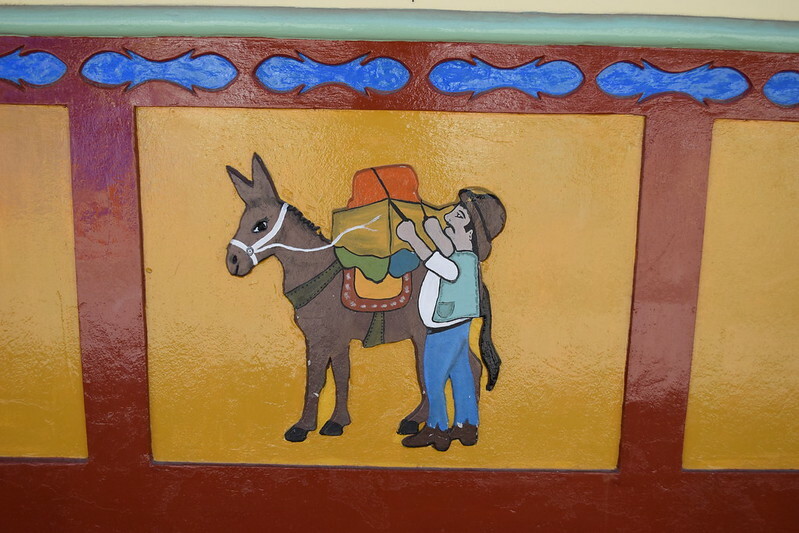 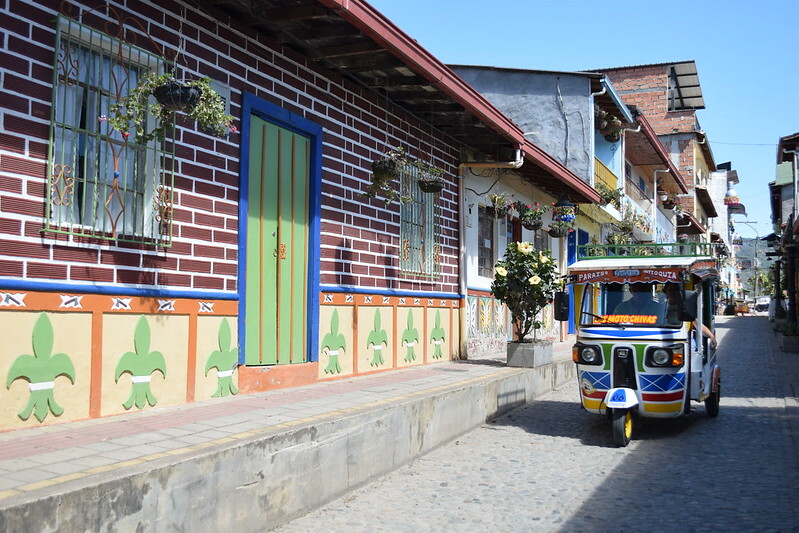 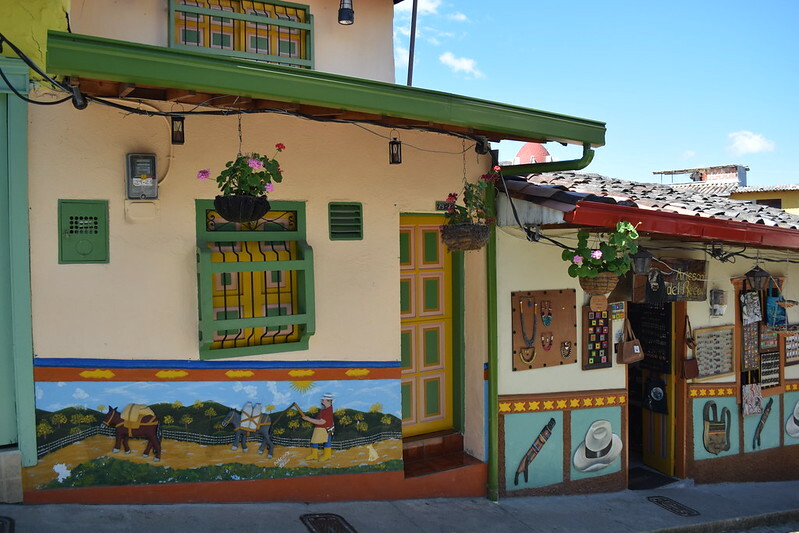 😊 Guatapé is a charming little resort town full of colorful buildings decorated with mosaics. 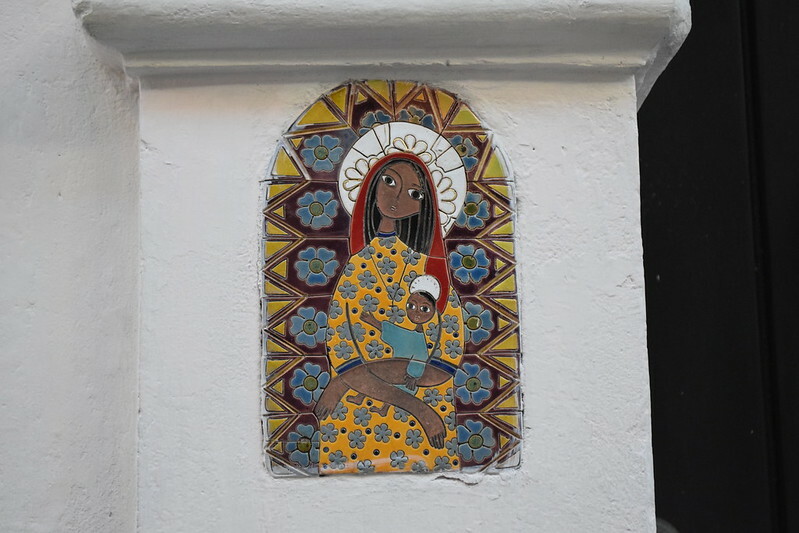 I loved how each of the mosaics represented the kind of business in that building. 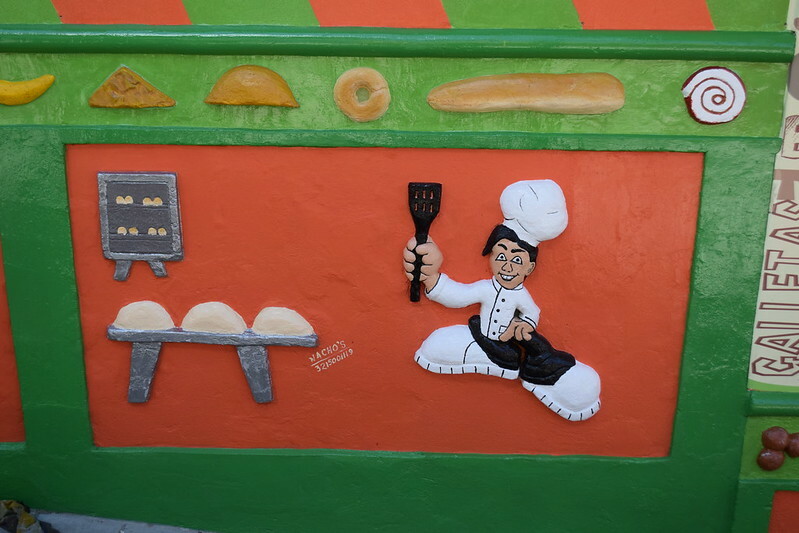 For example, the bakery was decorated with a baker and bread loaves. 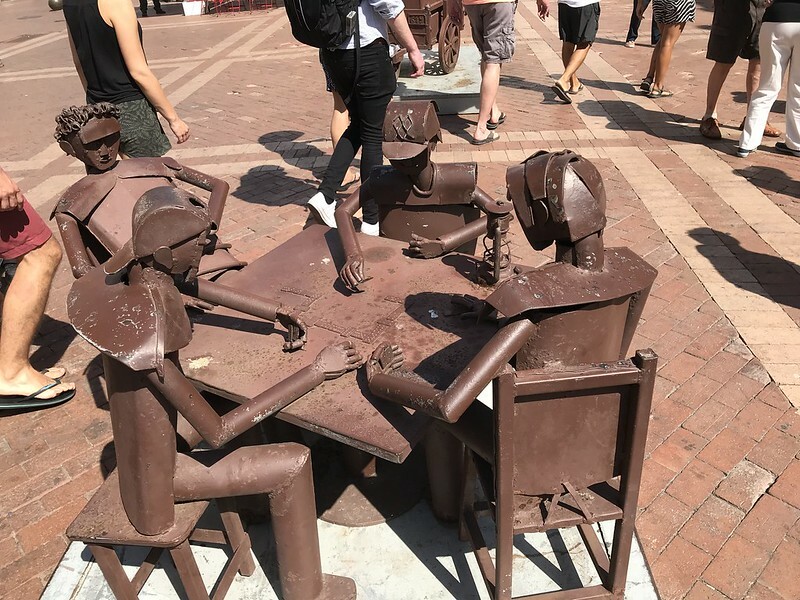 🍞 I also loved the personal touches, like fixtures made from recycled bottle caps. 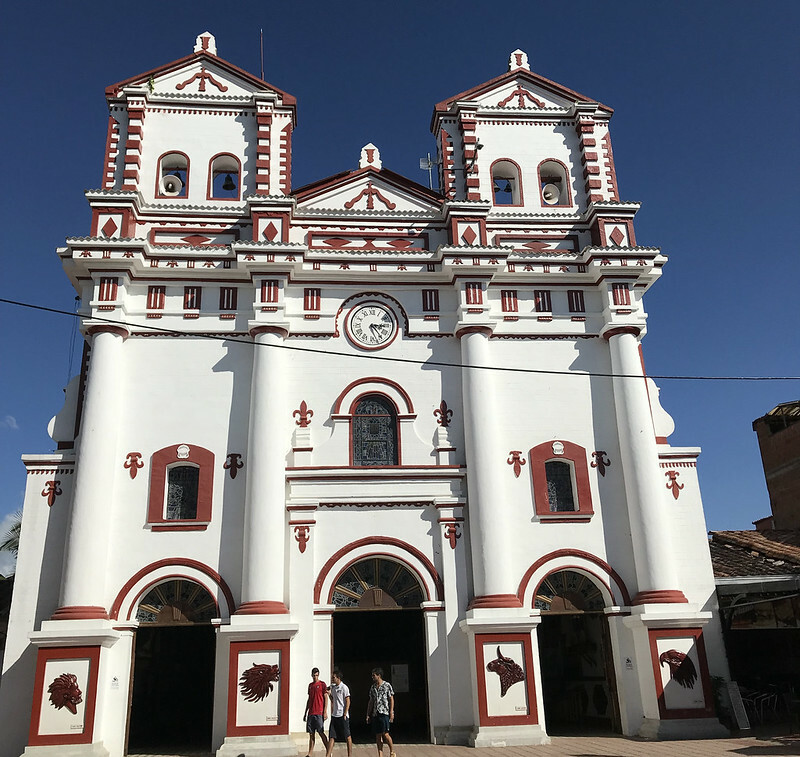 Overall, this was an easy, relaxing, and affordable day trip from the city, as well as, a nice way to see how everyday life is for the residents of this region. 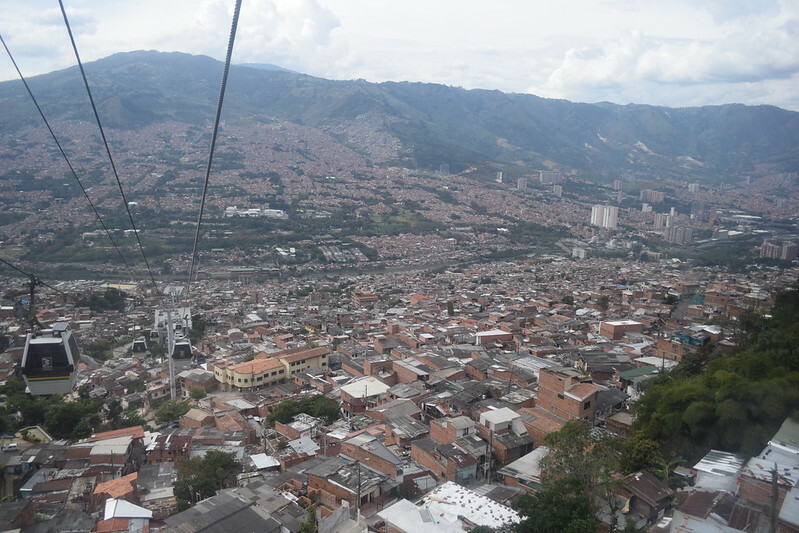 Anyway, after my three days in Medellin were finished, I took an 8-hour overnight bus to Bogota. 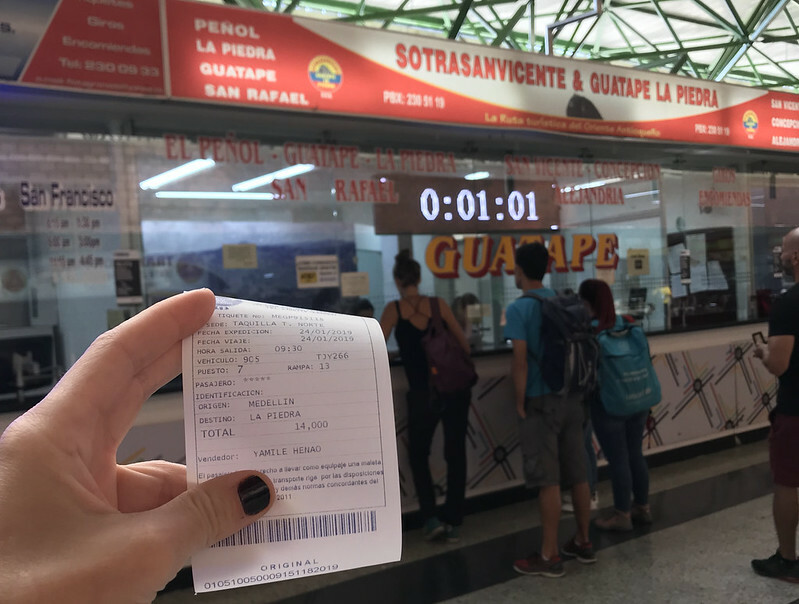 I bought the ticket using Rome2Rio for only 20 USD. 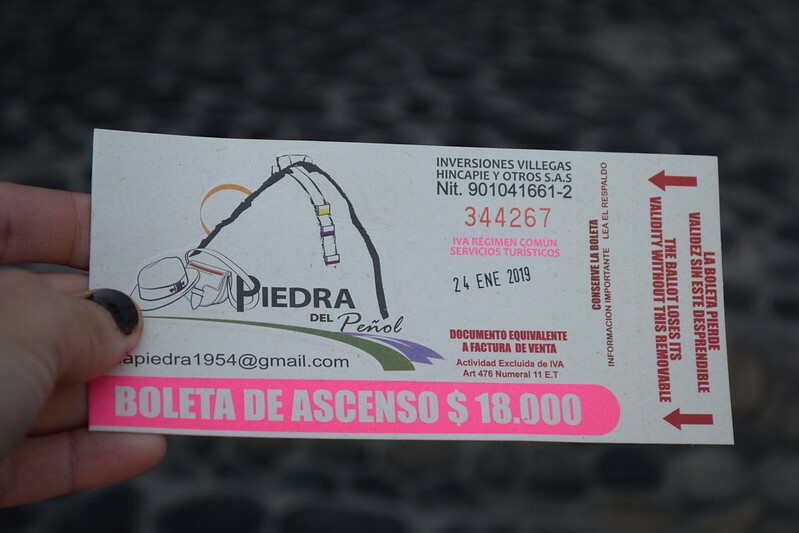 I liked how the overnight bus meant that I didn’t lose out on any sightseeing time and it meant one less night of accommodation costs. 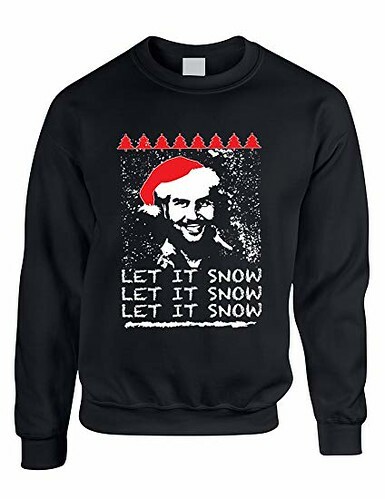 That being said, I felt that my bus was super cold, and the bus was blasting both a terrible Keanu Reeves movie and music until the wee hours of the morning. 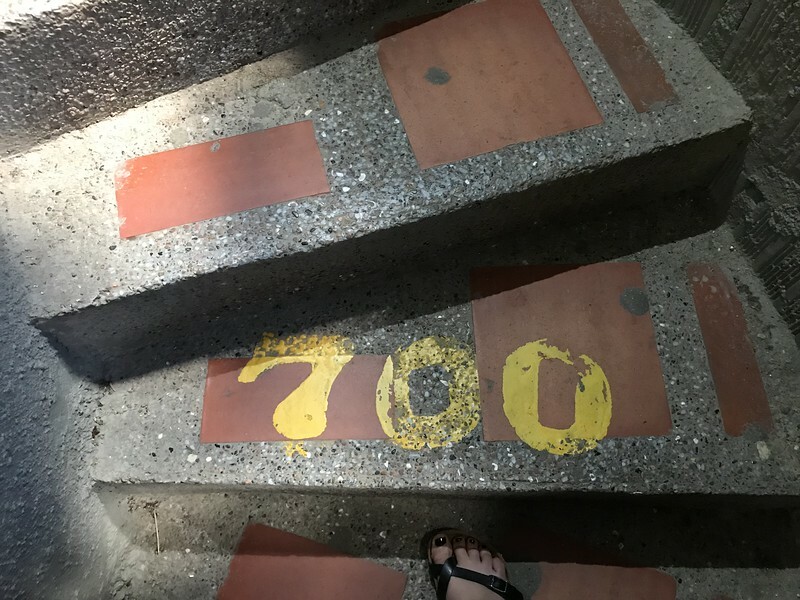 🎵 😭 Definitely not the best night’s sleep, even for a seasoned traveler such as myself who also had ear plugs, extra clothes, and a face mask. 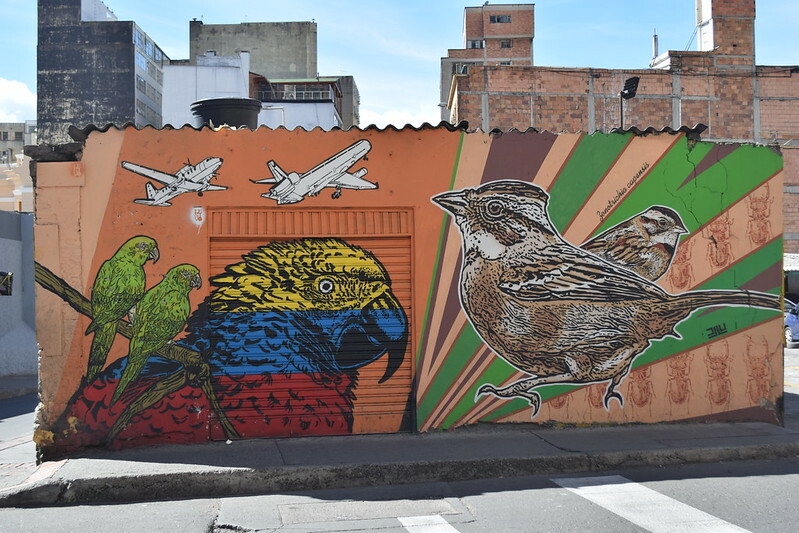 One of the first things that struck me about Bogota, was the city’s amazing street art. 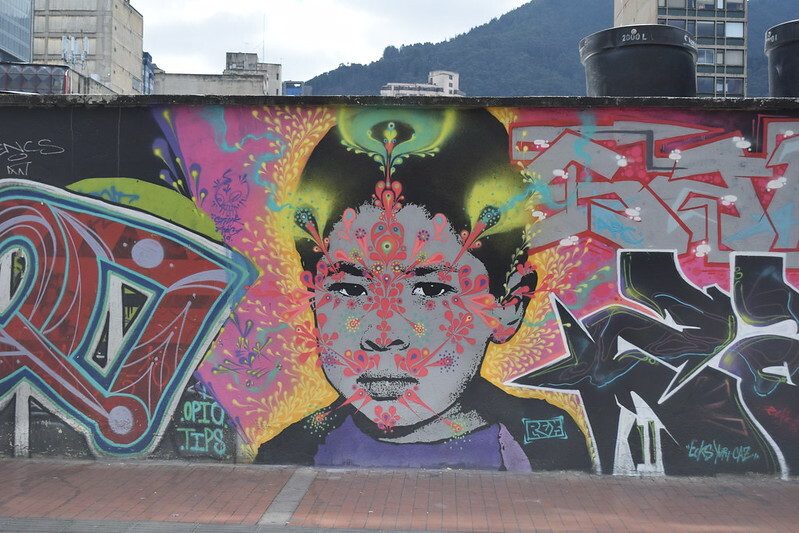 Oddly enough, despite the fact that street art is still illegal in many public spaces in the city, some of the best art could be found in plain sight along the busy street on the way to the bus station/airport.🧡 One of the most famous street artists in Bogota is STINKFISH, but there are countless others with their own very inspirational message and unique design. 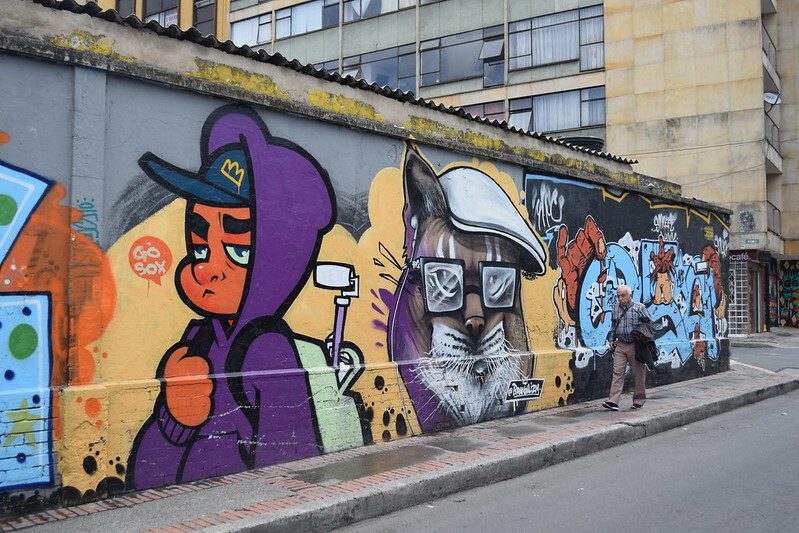 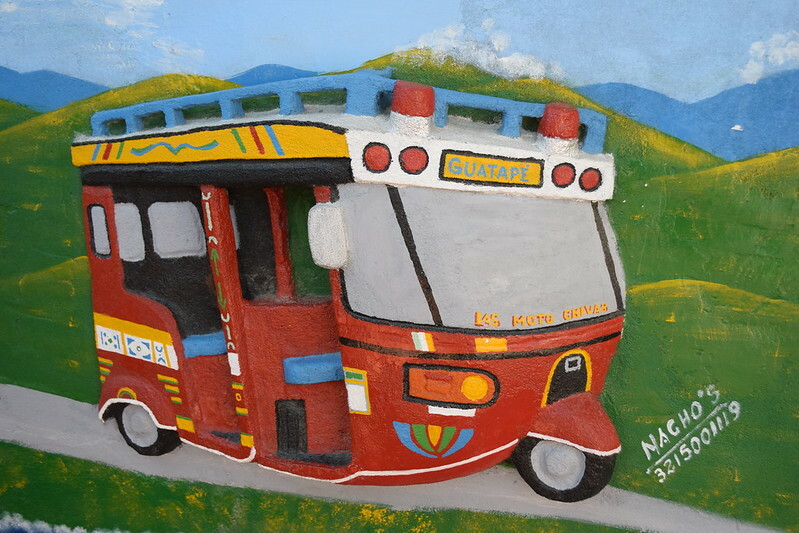 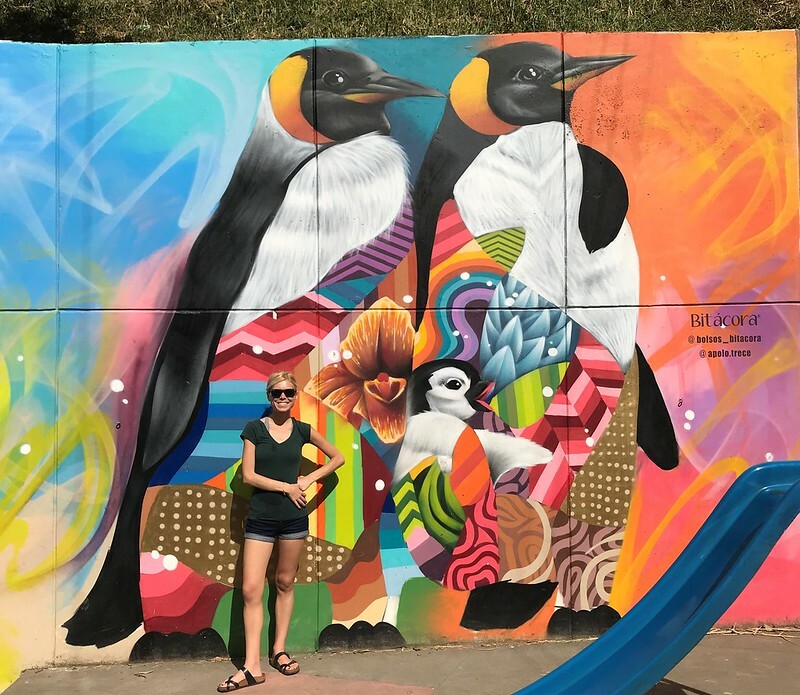 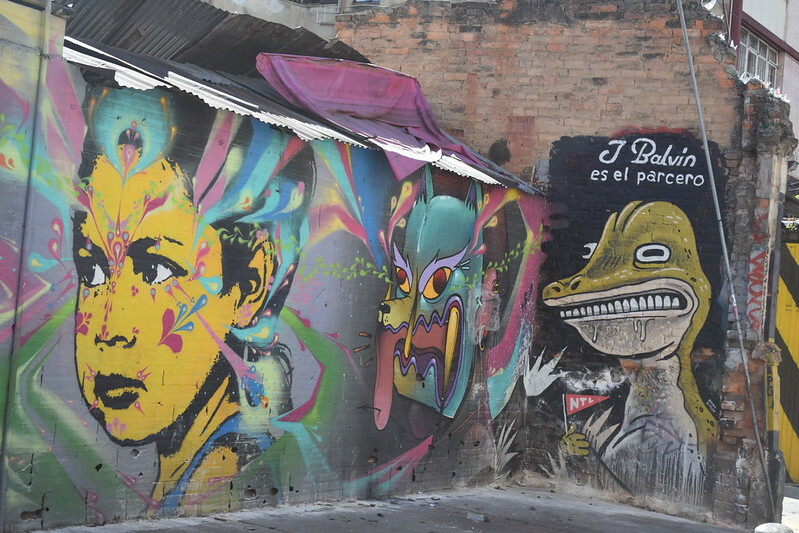 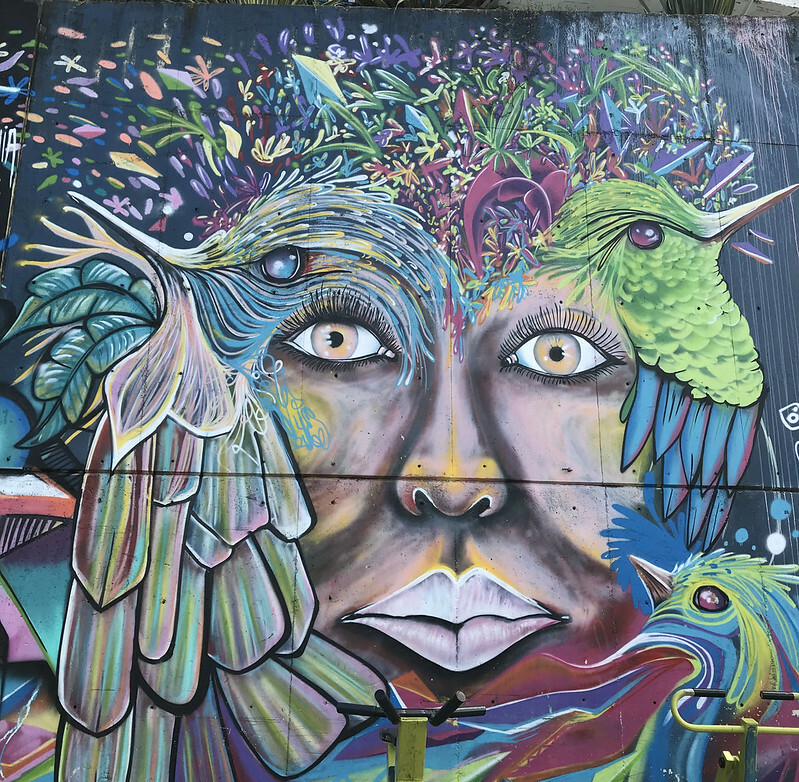 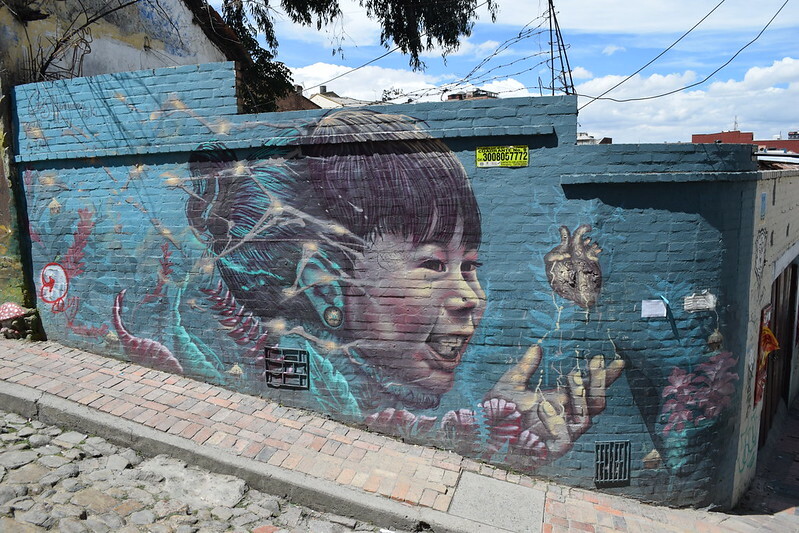 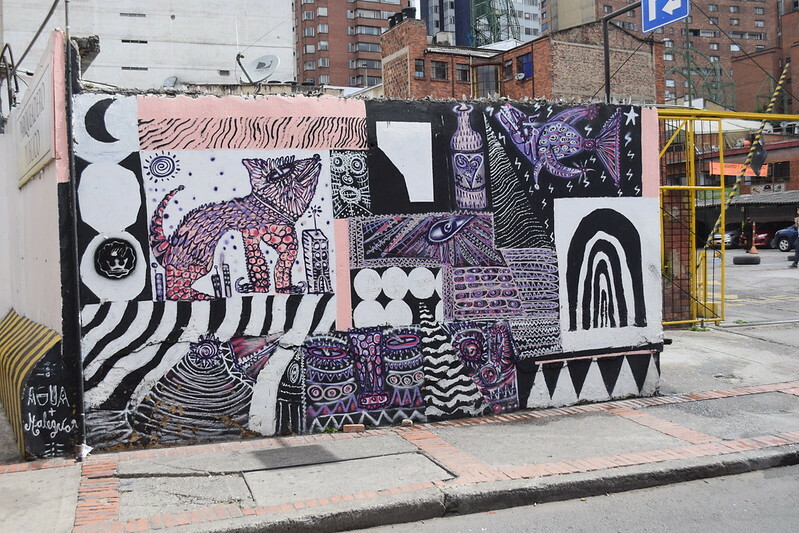 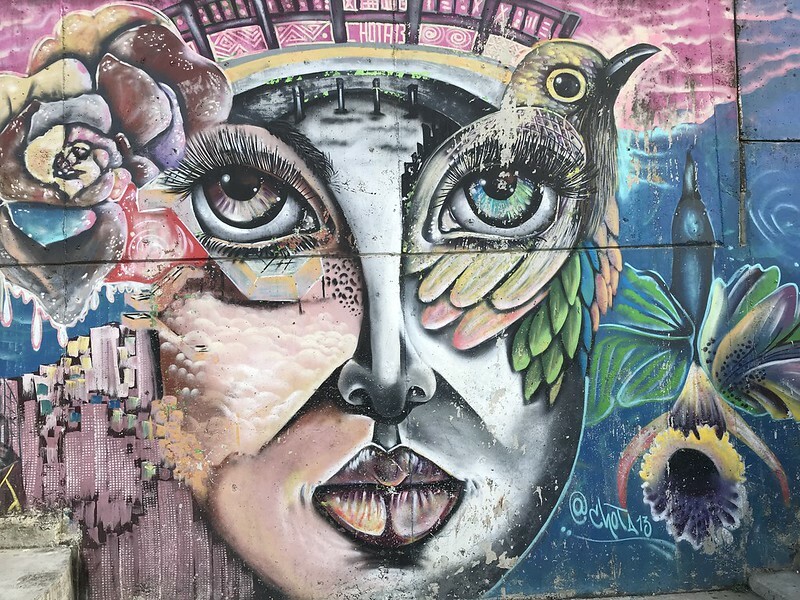 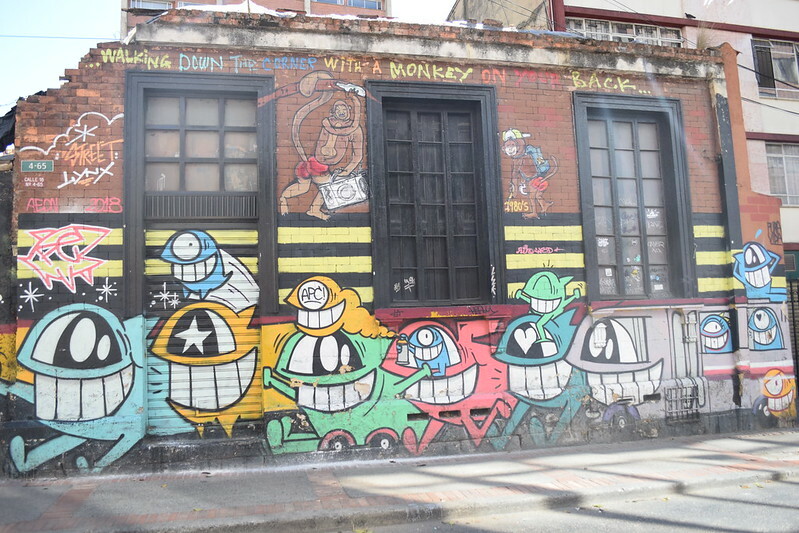 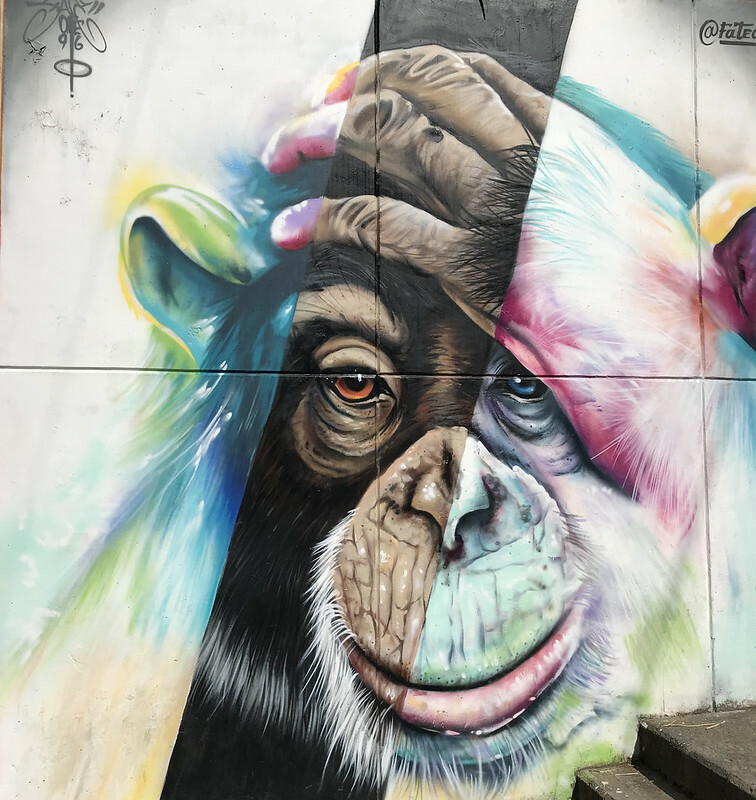 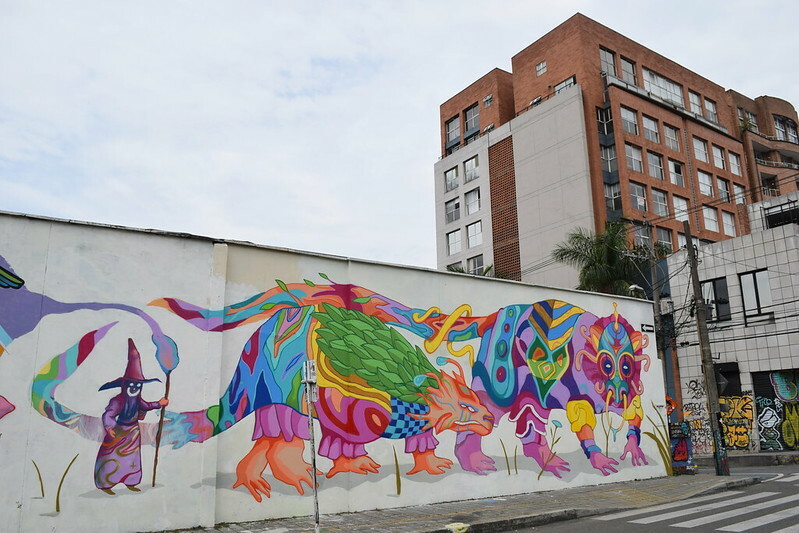 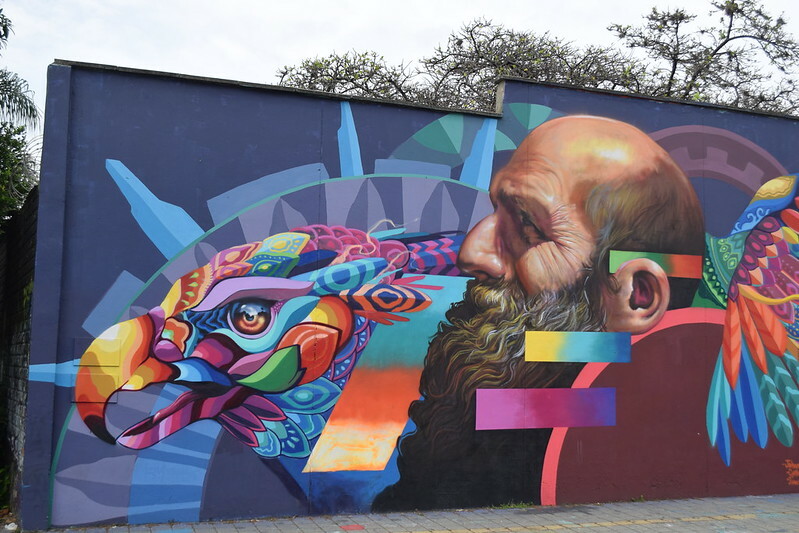 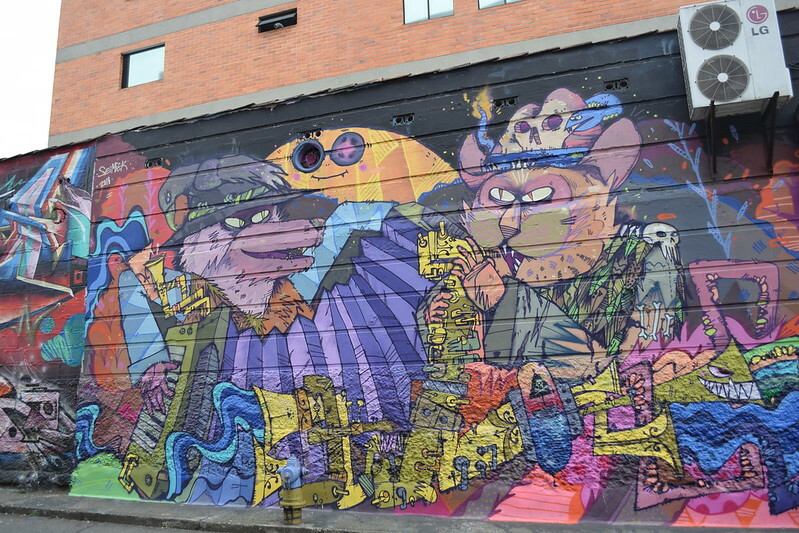 To learn more about this incredible street art, I decided to go on the Bogota Graffiti Tour. 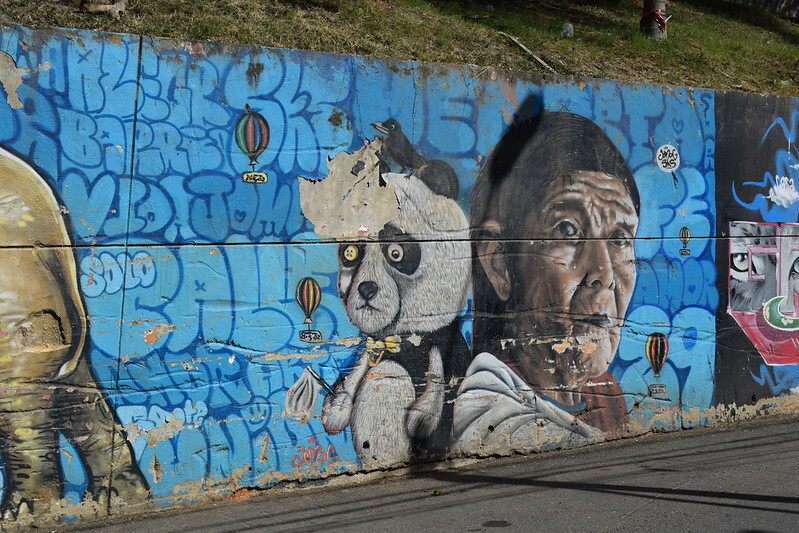 What was most inspirational to hear was about the incident that spurred the flurry of graffiti art across the city. 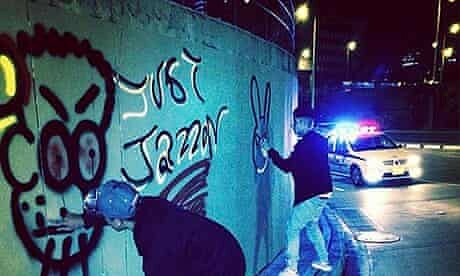 Basically, back in 2011, a young artist who was illegally spray painting a cat on a public building was shot and killed by a police officer. 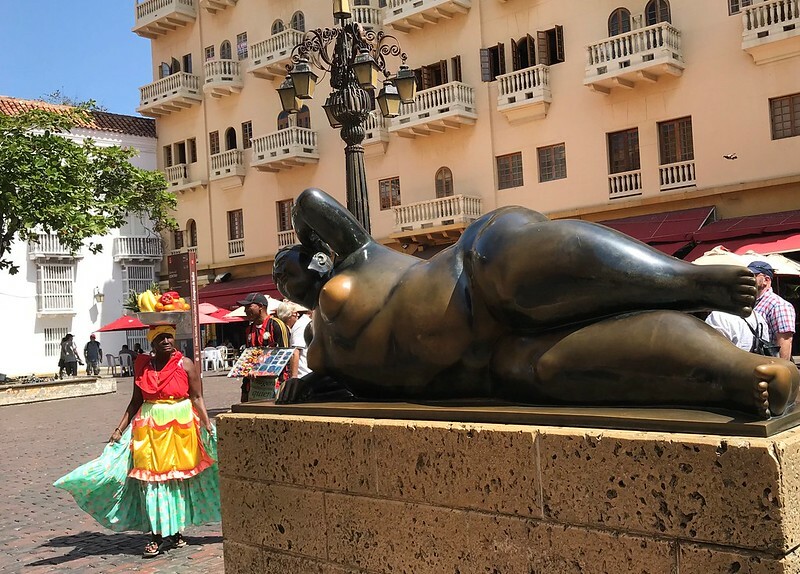 They tried to cover up the incident, but the public outrage could not be controlled. 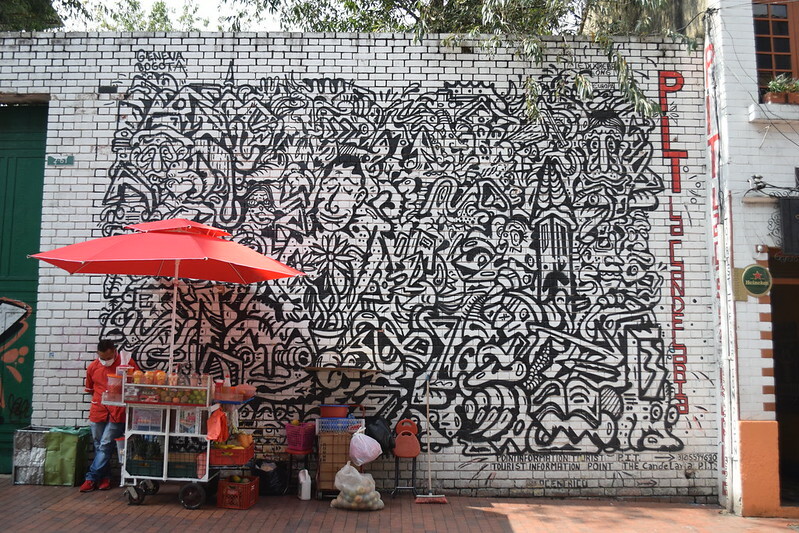 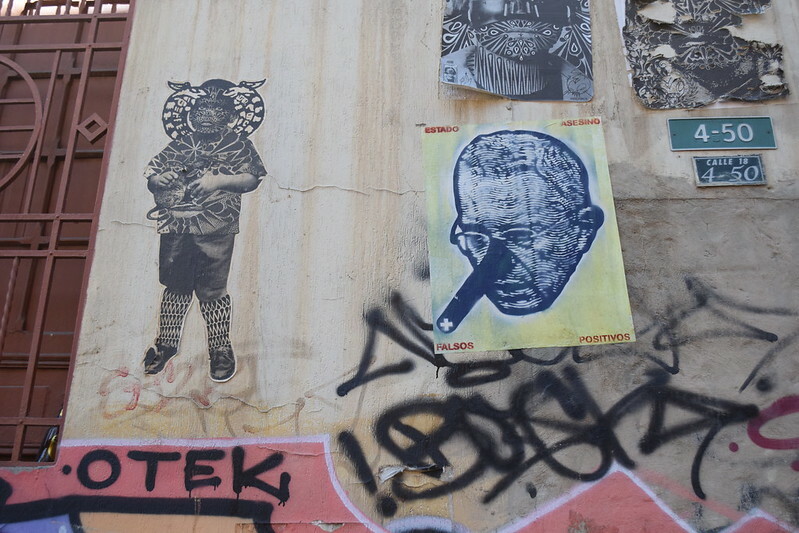 As a way to appease the masses, the mayor subsequently announced that street art could be performed as a form of artistic and cultural expression. 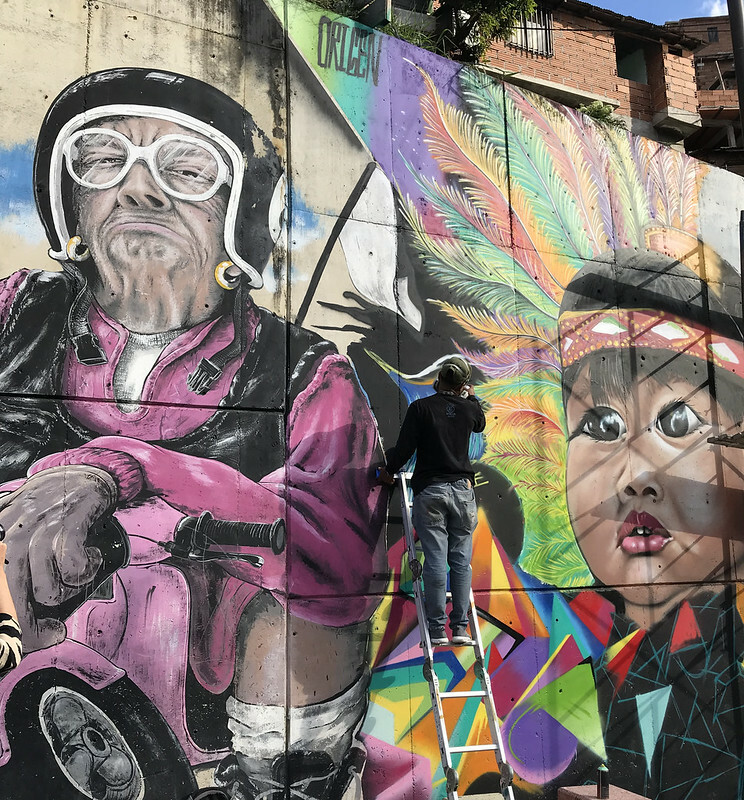 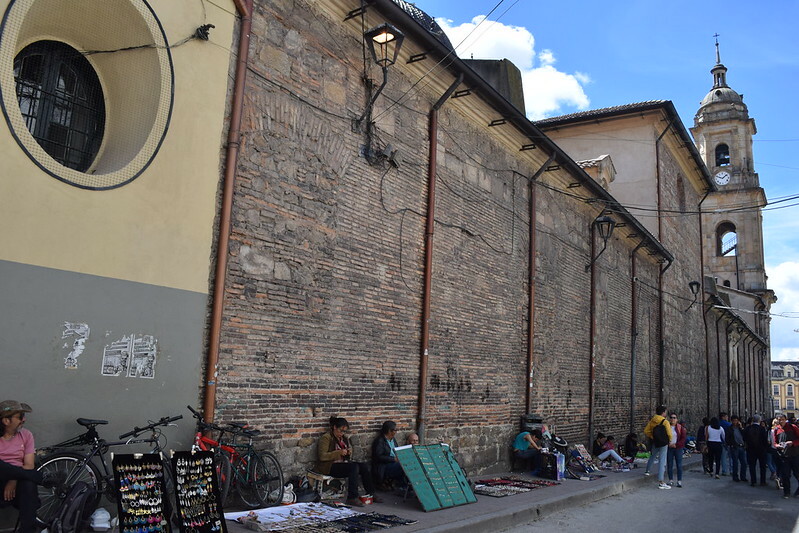 Despite that decree, street art was still limited to only a small number of public spaces, and many times, artists were still asked to cover up their masterpieces the very next day. 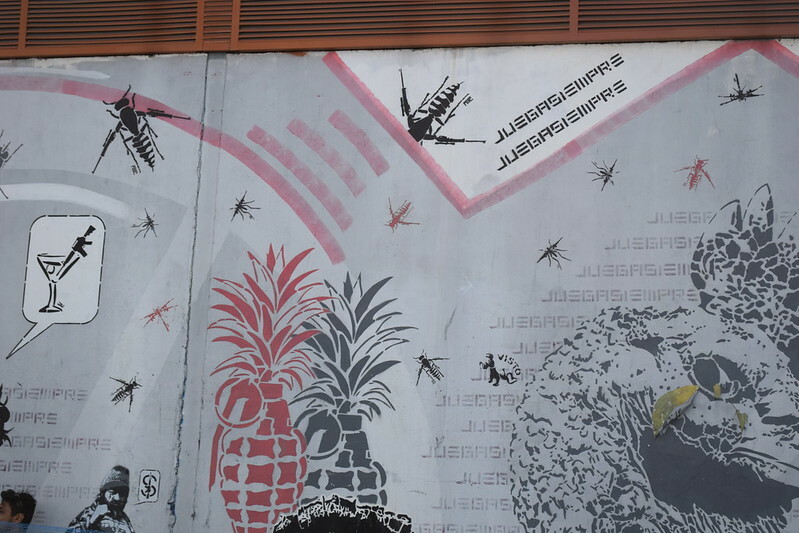 Then, back in 2013, Justin Bieber got roped into this controversy. 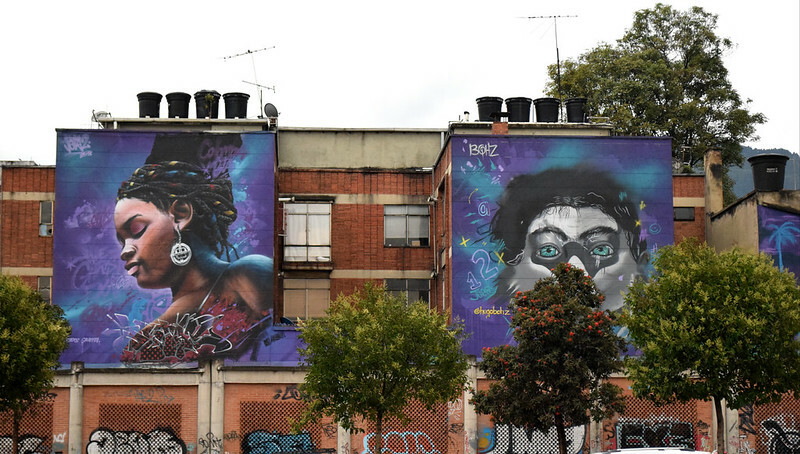 He had a concert in Bogota and afterwards he illegally painted on a public building. 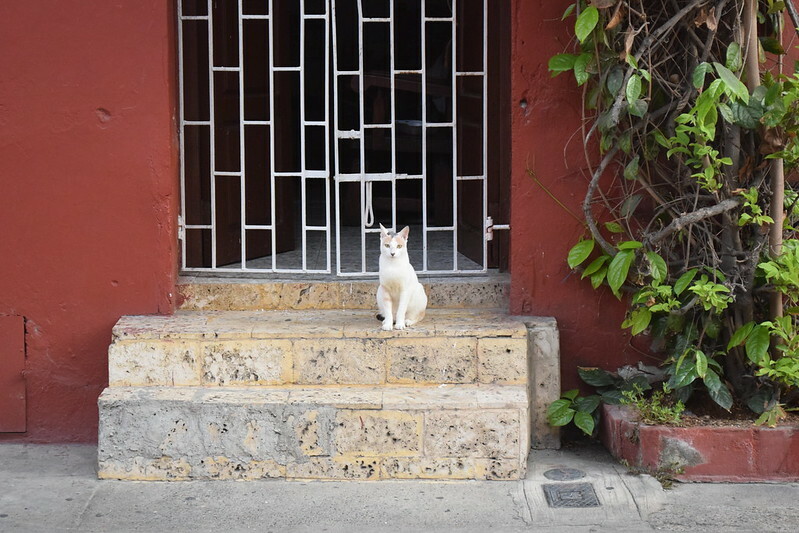 Because of his fame, the police officers did NOTHING to stop him! 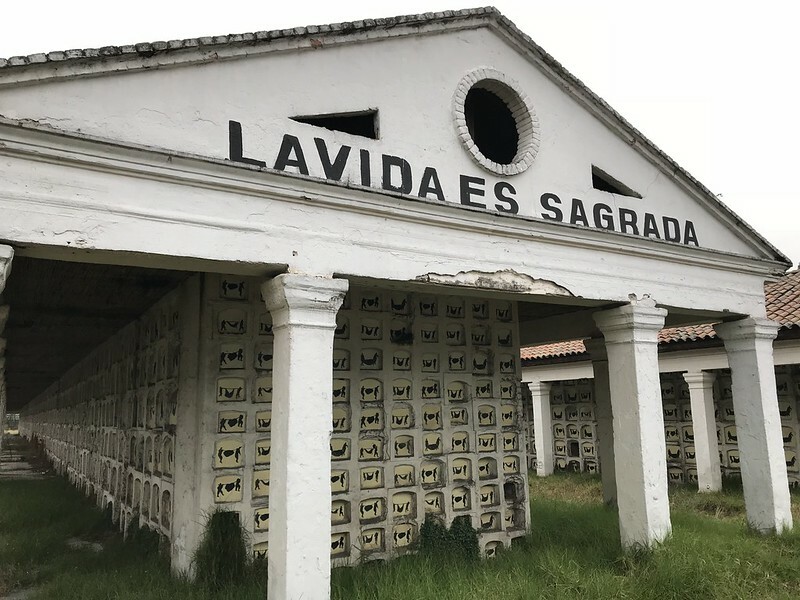 Falsos positivos was a scandal that occurred with government where essentially, because the US was giving funding to Colombia for killing paramilitary groups, the police officers here were killing ordinary citizens, dressing them up like rebels, taking their photo, and sending it off for further funding. 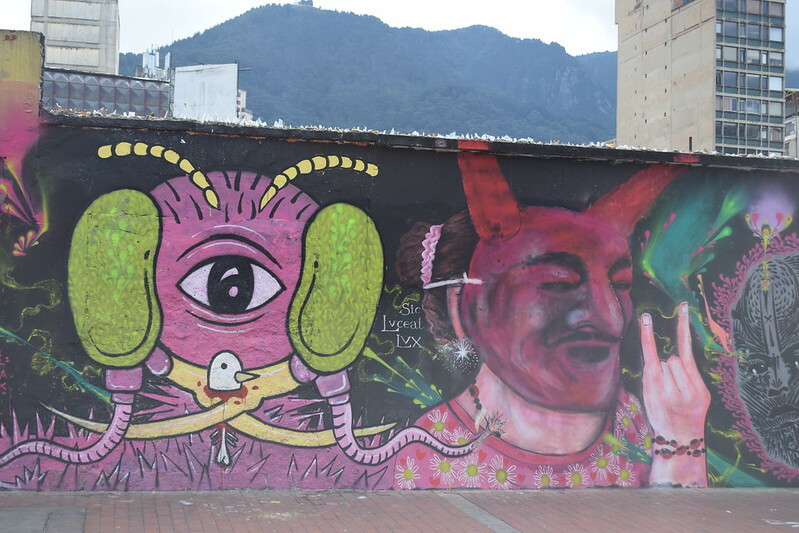 Anyway, political street art and the cartels are really just a small part of the culture here in Colombia. 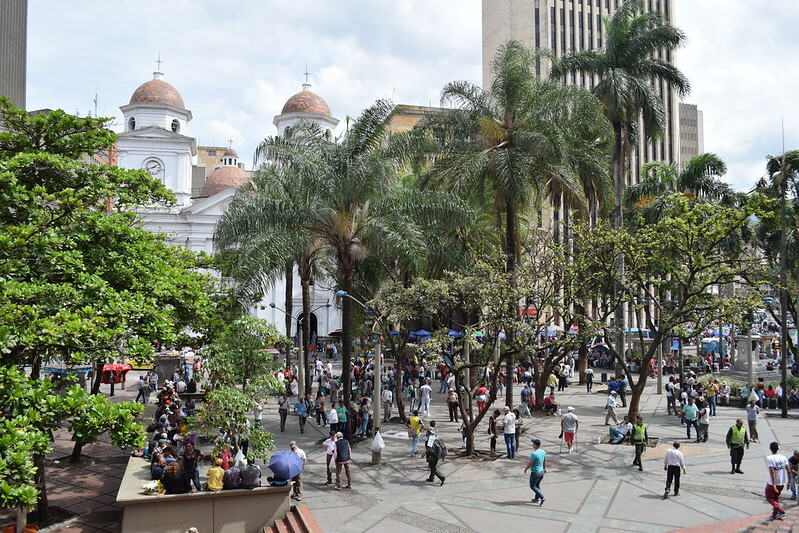 As such, to learn more about this complex country and this capital city of over 8 million people, I’d suggest taking a free walking tour. 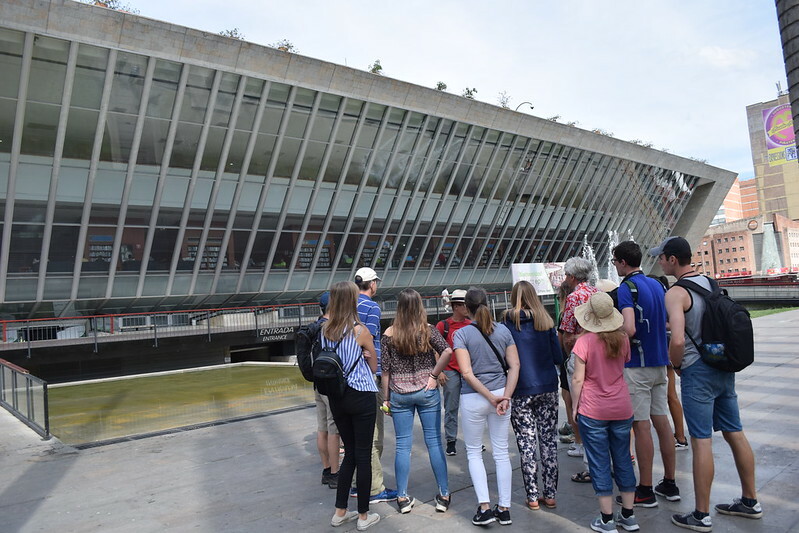 One of the first things we talked about on the tour was the architecture in the city. 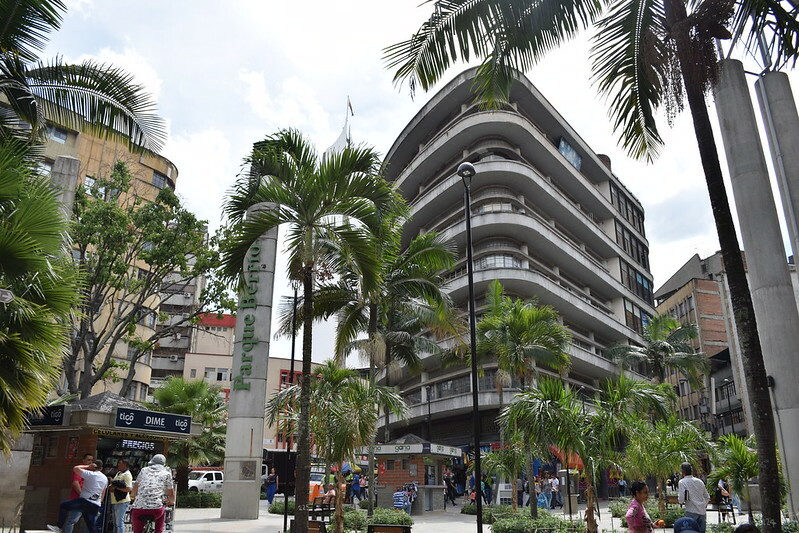 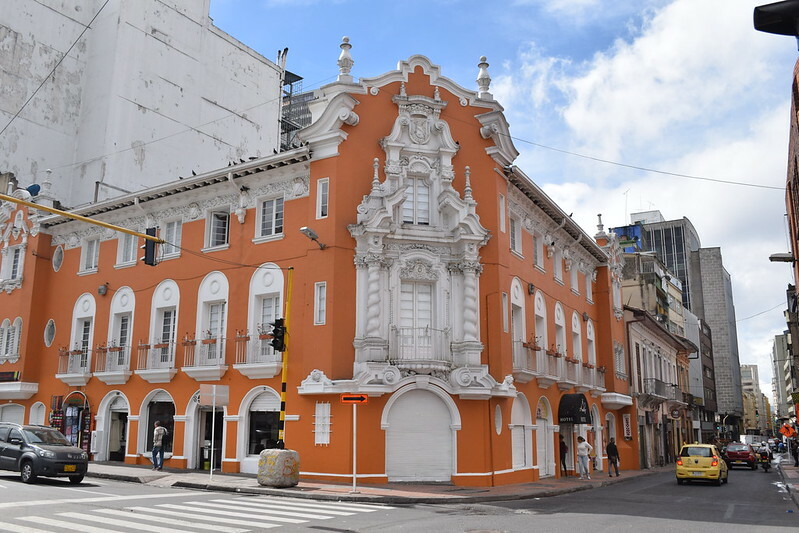 The streets here are a beautiful fusion of modern 1970s style art deco buildings and also more colonial 19th century landmarks. 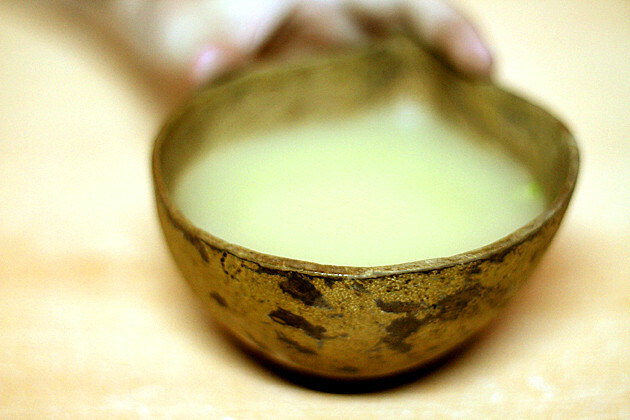 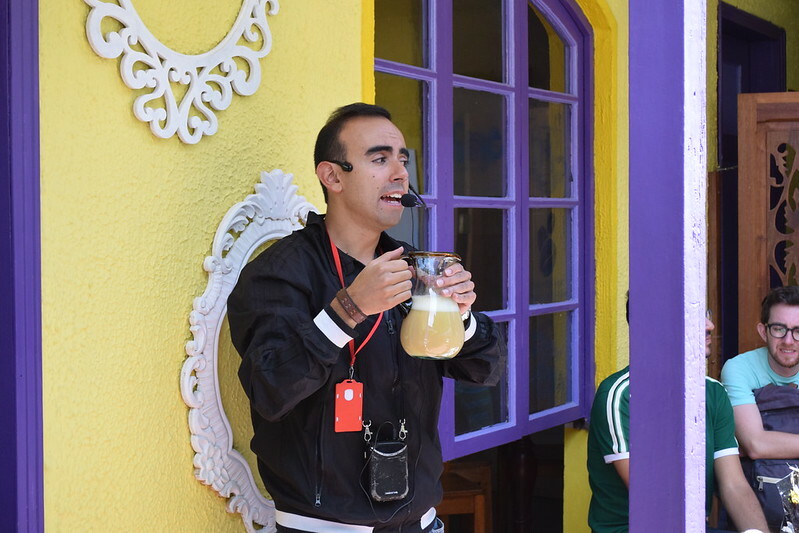 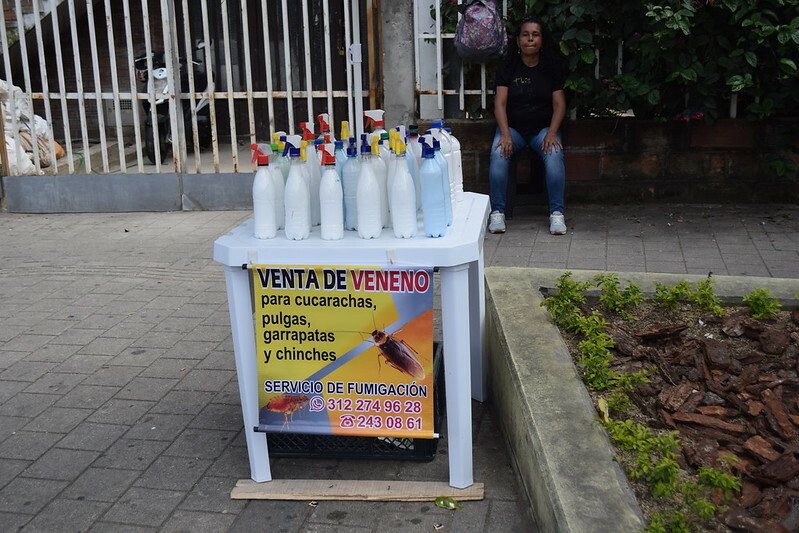 To loosen everyone up on the tour, our guide took us to a local cafe to try CHICHA, a popular fermented corn drink. 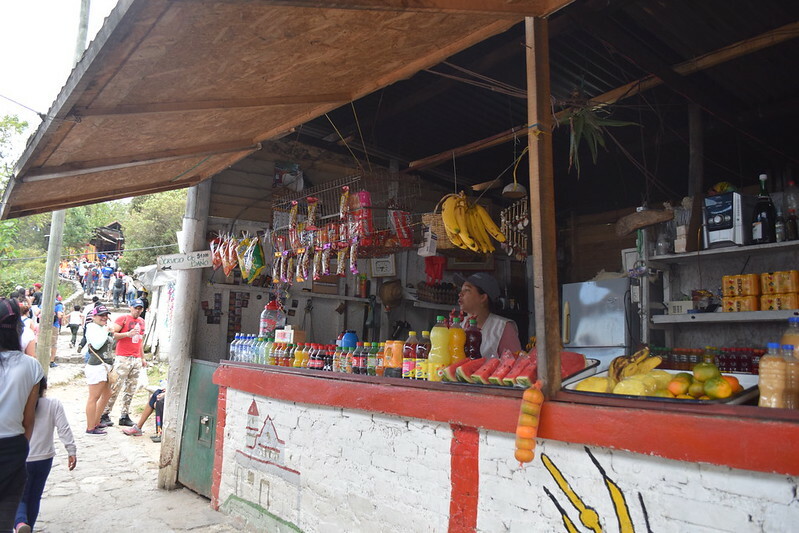 The drink is communal, so everyone got these cup necklaces to wear and our guide came around to pour a small shot of chicha into our cup. 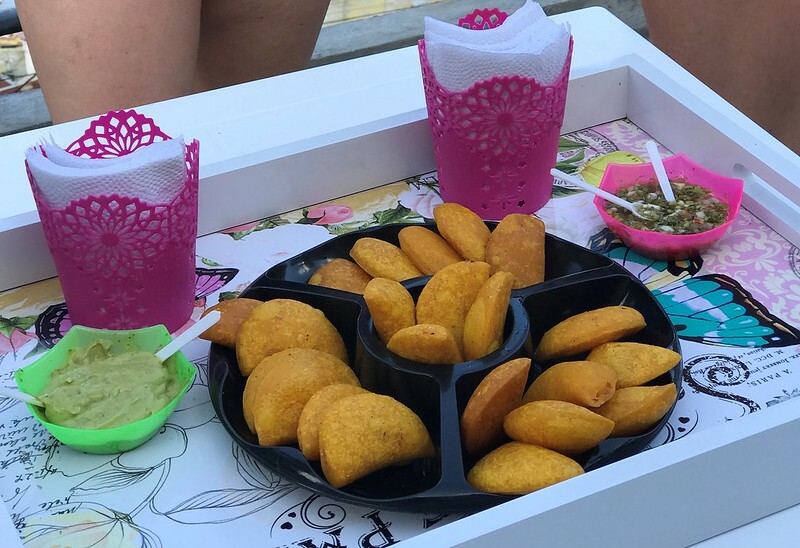 I was NOT a big fan of chicha, but I liked how we each got the cup as a souvenir. 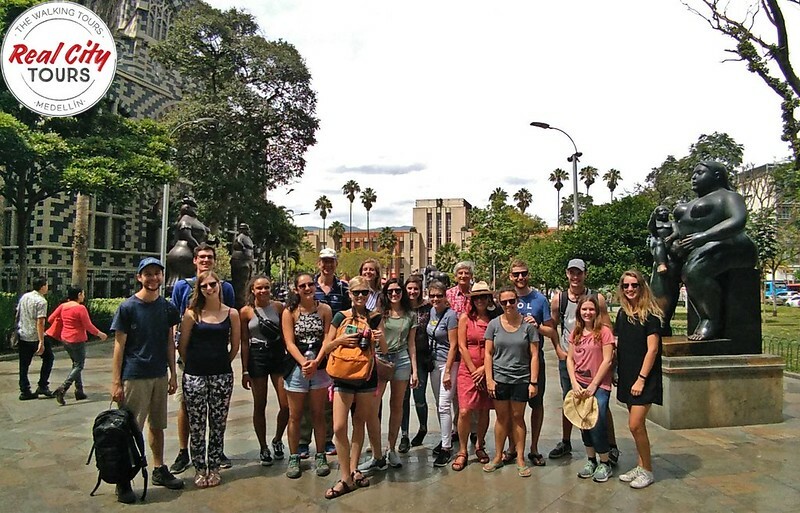 🙂 Another thing we learned about on the tour was the legend of El Dorado. 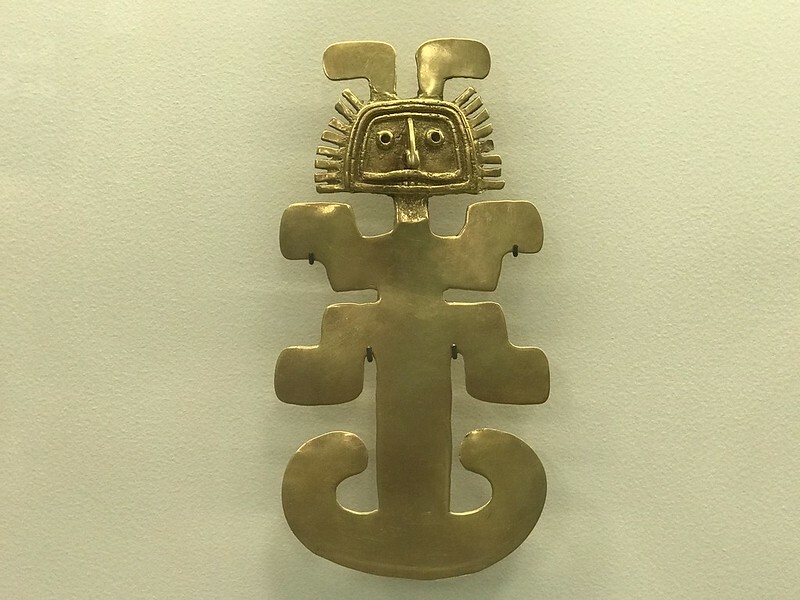 Essentially, indigenous Colombians didn’t really have a monetary value for gold. 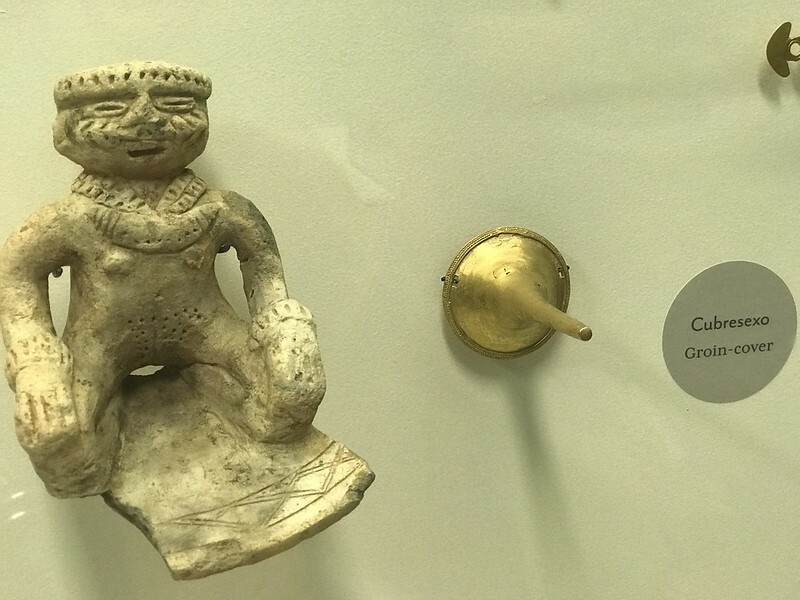 They used it a lot to adorn their bodies and in ritual ceremonies. 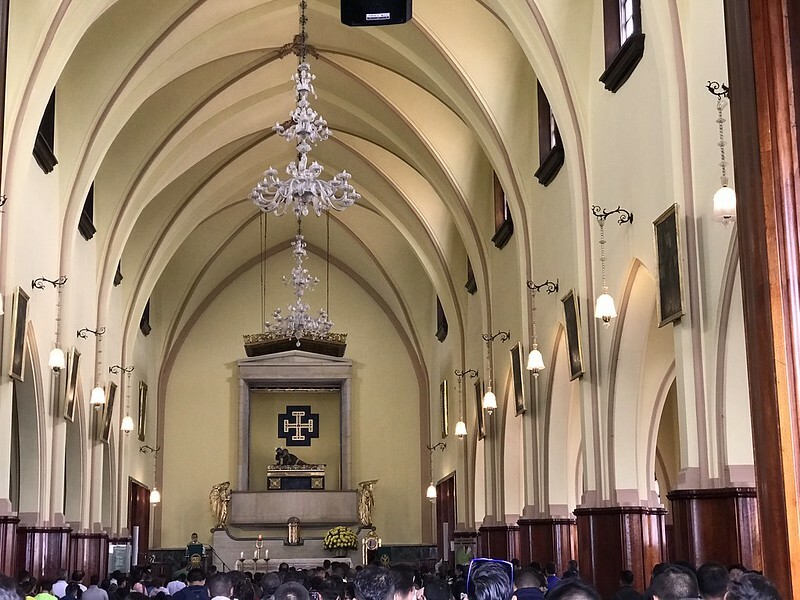 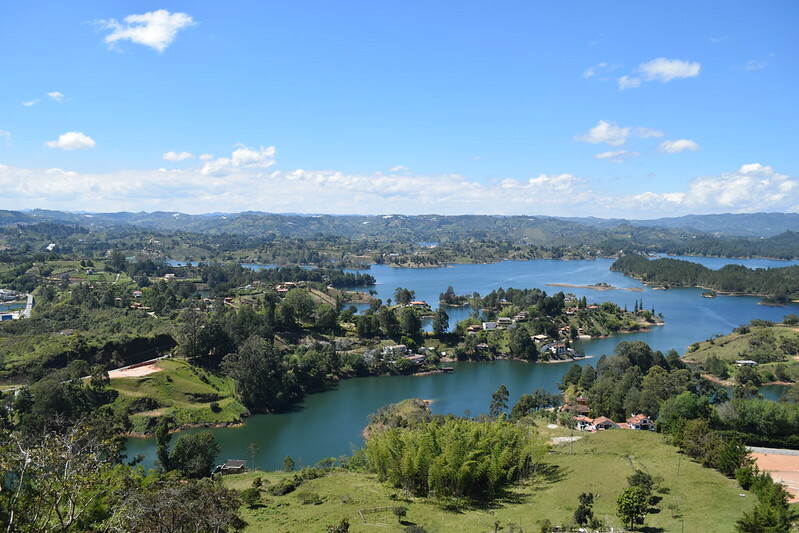 One of these ceremonies was held at a place called Lake Guatavita, where the ruler would dress in gold dust and everyone would throw gold into the lake as an offering to a God that lived under the water. 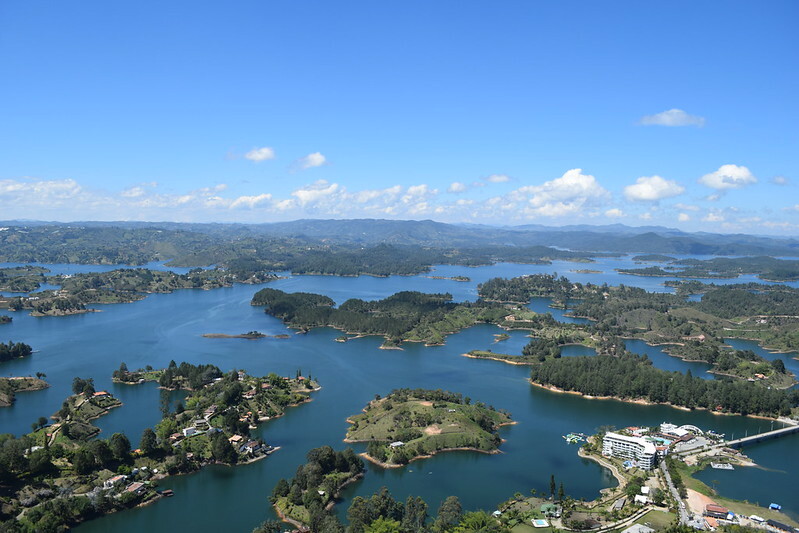 Well, the Spanish found out about this gold-filled reservoir and promptly went out to find it and drain it for all of its wealth. 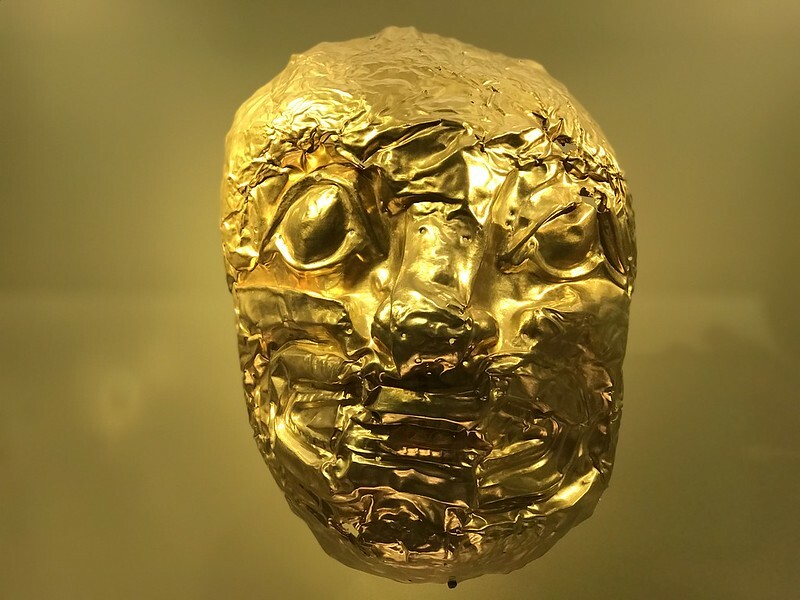 To learn more about the gold in Colombia or the legend of El Dorado, I’d suggest visiting the Gold Museum in either Cartagena or Bogota. 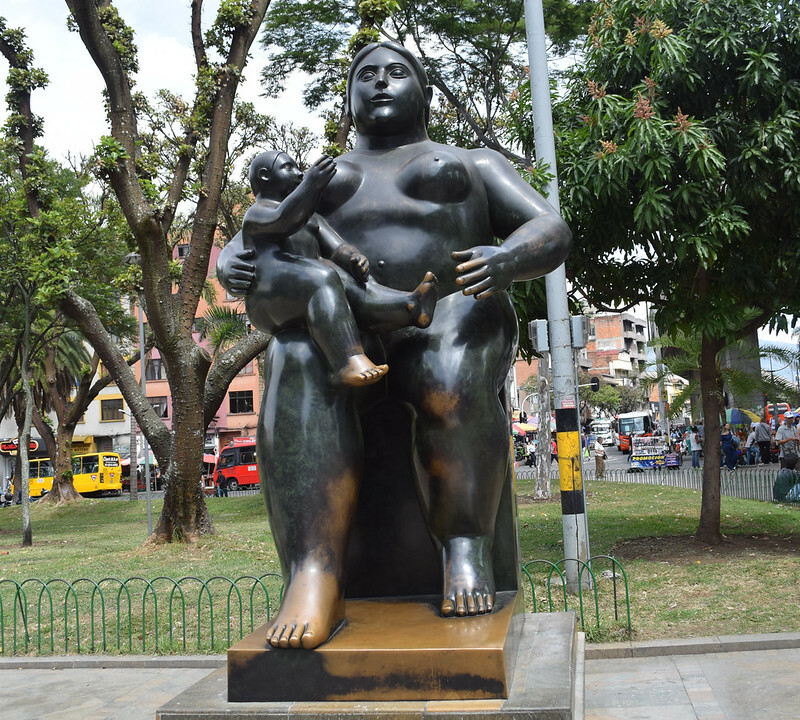 The one in Cartagena is free everyday and the other in Bogota is free on Sunday. 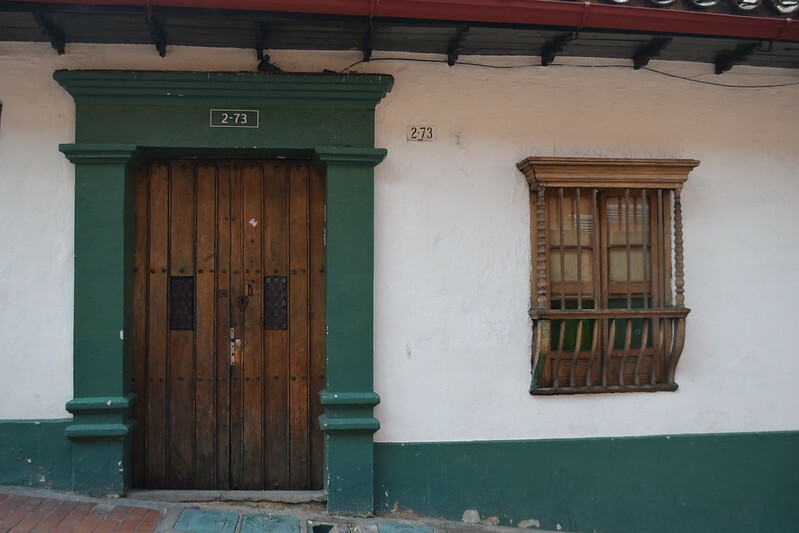 Now, speaking of Colombia’s natural resources, the country is also well-known for its EMERALDS. 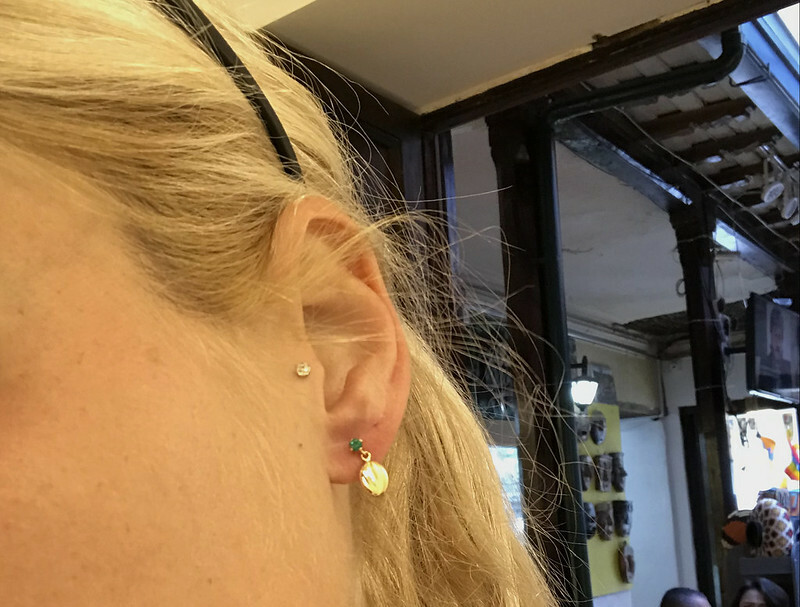 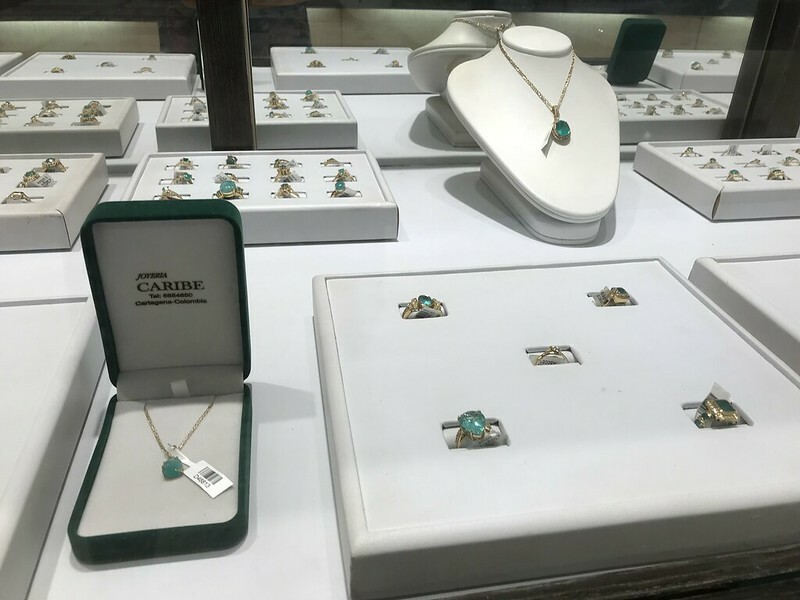 In fact this country is the second largest exporter of this precious stone, and purchasing emeralds in-country means you’ll avoid import taxes, plus you have the possibility of bartering on the price. 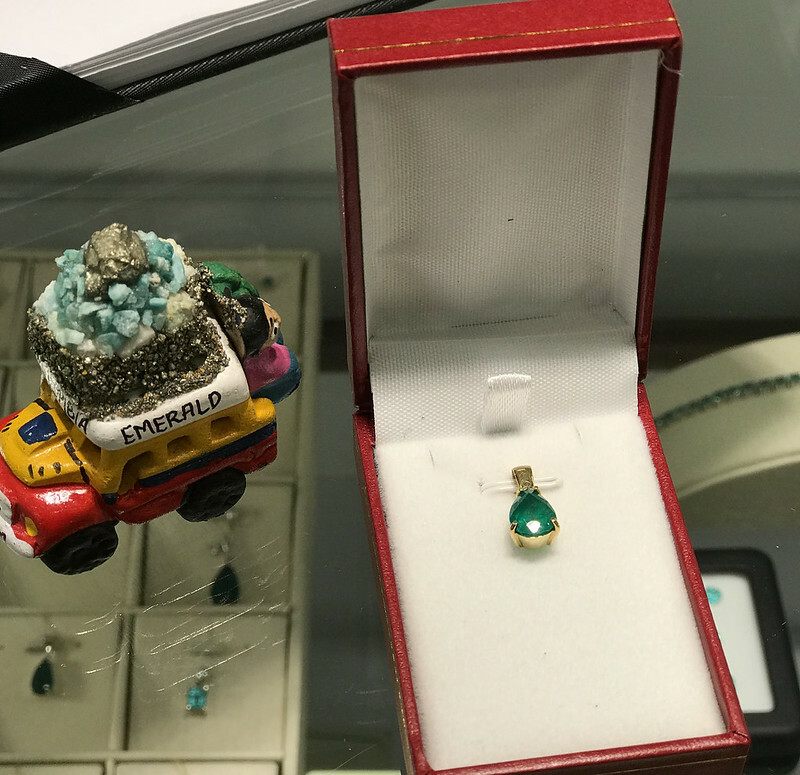 💰 The stones are priced based on weight and are produced in varying qualities, but expect to offer up to 60% off of the asking price. 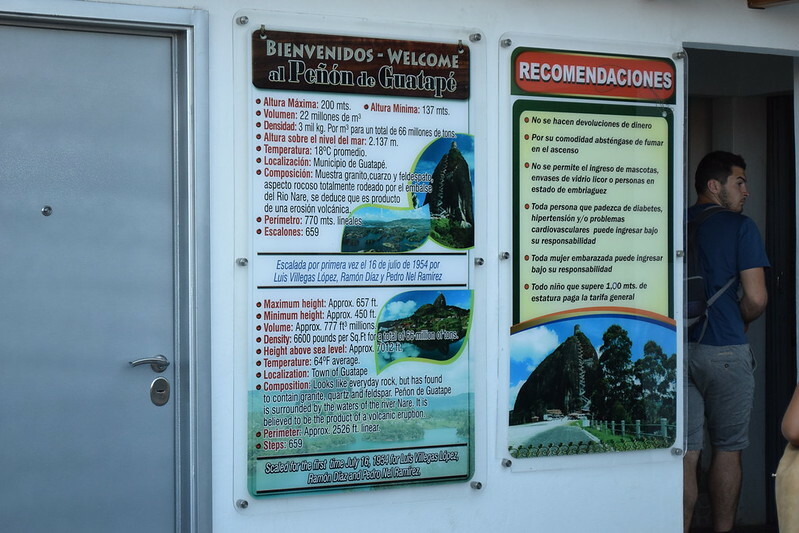 Also, make sure to stop at the DIAN office at the airport when you leave. 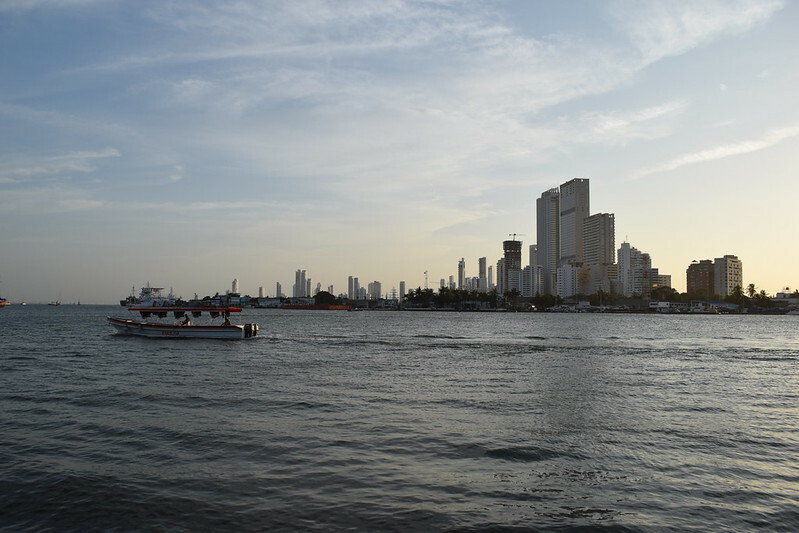 As a foreigner, you will receive back any taxes that you paid on luxury items, like jewelry. 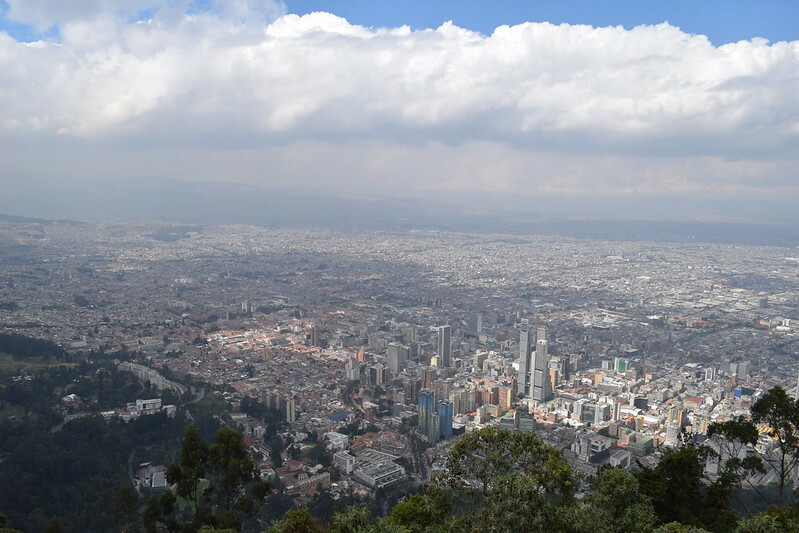 Anyway, aside from the walking tours, one of the best things to do in the city is to hike up to the peak of Monserrate. 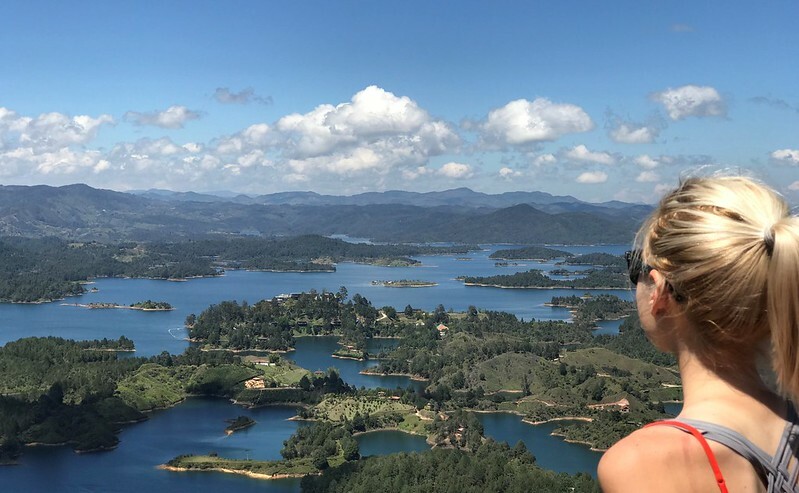 Another gorgeous VISTA! 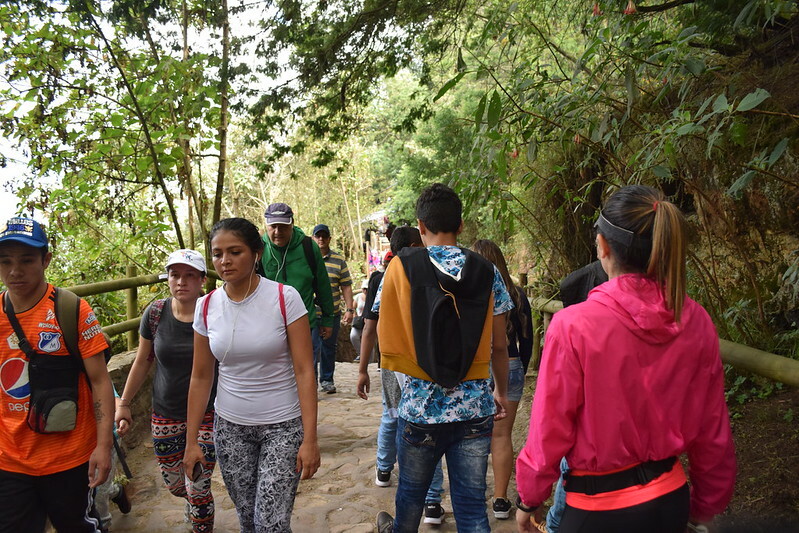 The hike will take about 1.5 hours each way, and includes a combination of flat pathways and steep stairs. 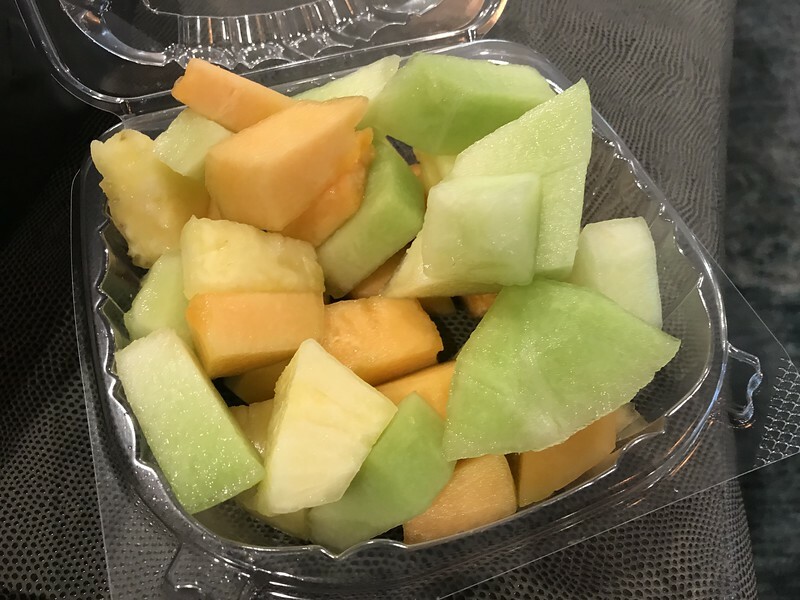 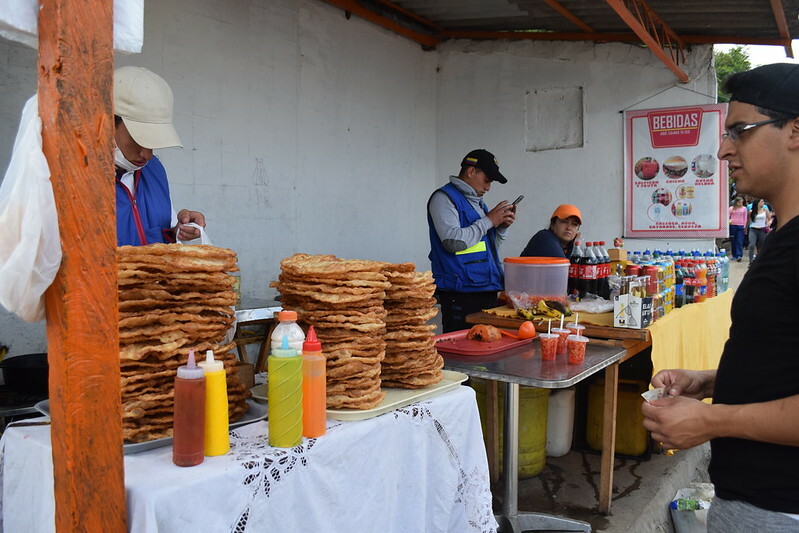 Luckily, there are countless food and drink sellers on the way up, so I would say it is a more leisurely activity, encouraging snack breaks and relaxation. 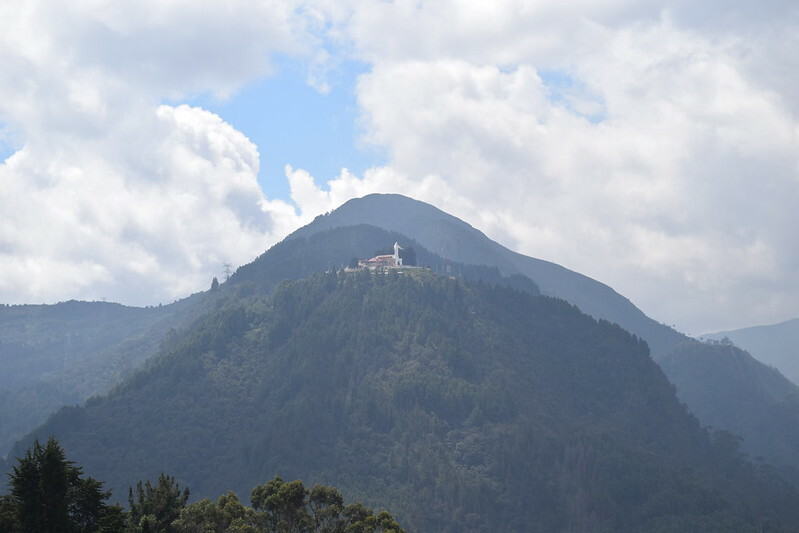 Anyway, at the top of Monserrate, not only do you have a spectacular view of the city, but there is also a church and many restaurants. 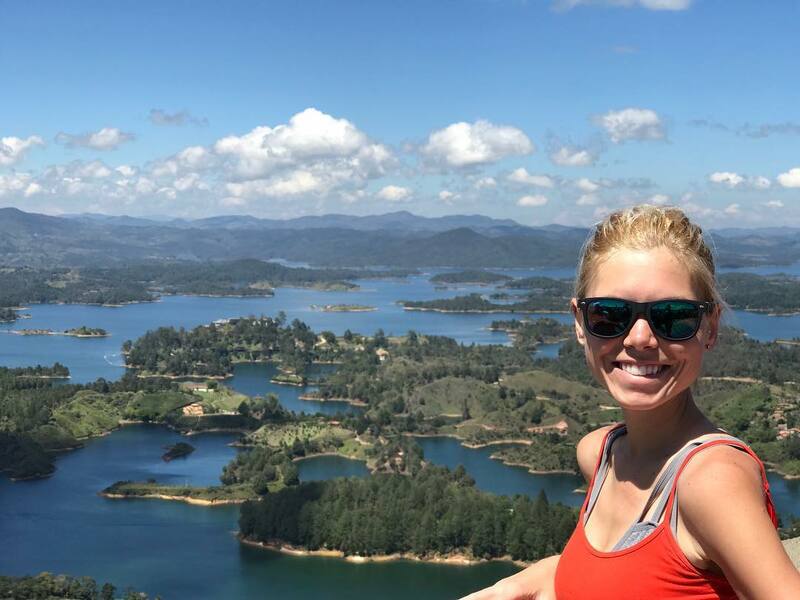 Side note: If you can’t hike to the top, don’t be discouraged. 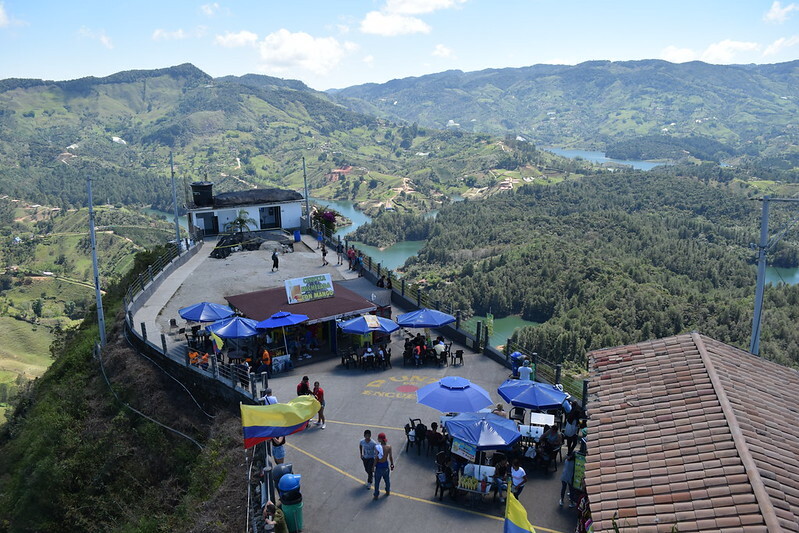 There is also a cable car that will take you up for about 9 USD round-trip. 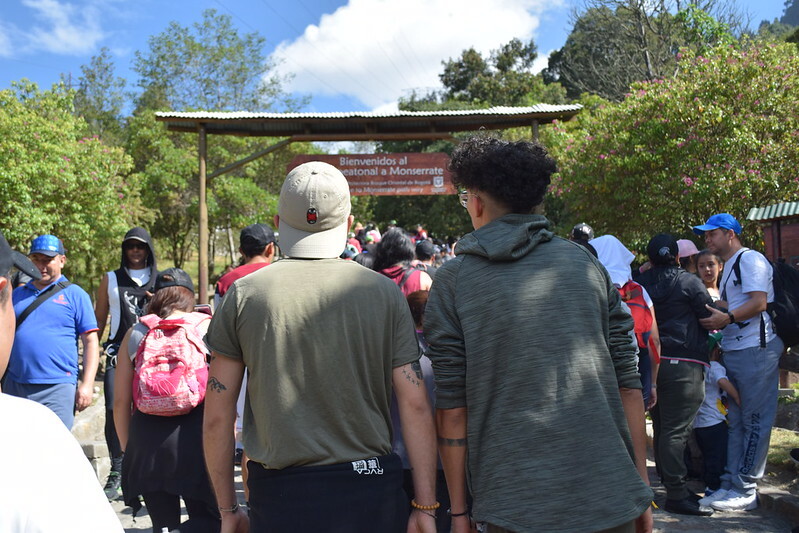 I had decided to hike up with these French guys I met at my hostel that were actually adopted from Colombia when they were very young. 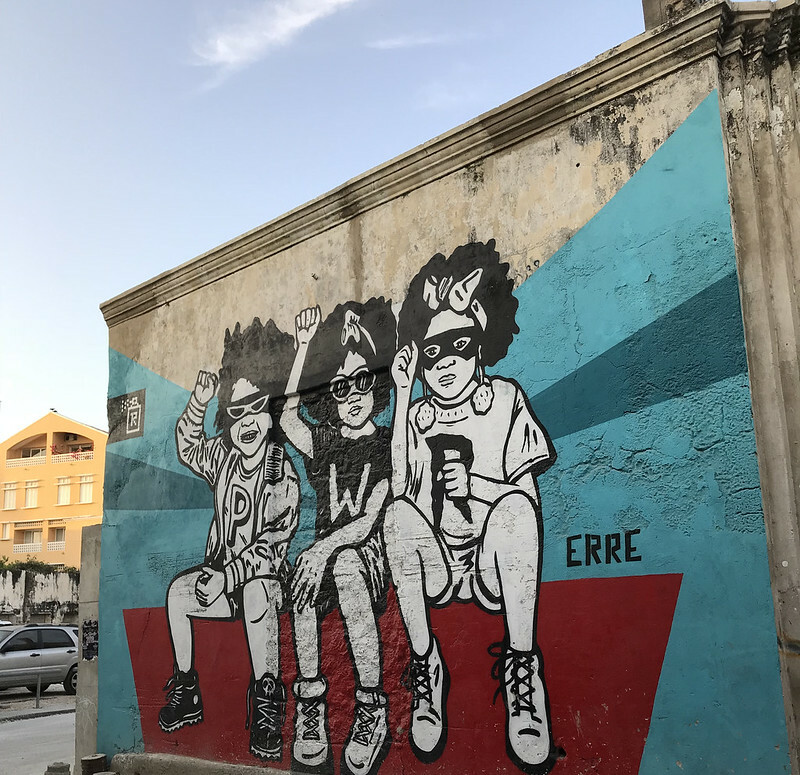 Now that they’ve grown up, they returned to the country to connect with their roots and learn the language. 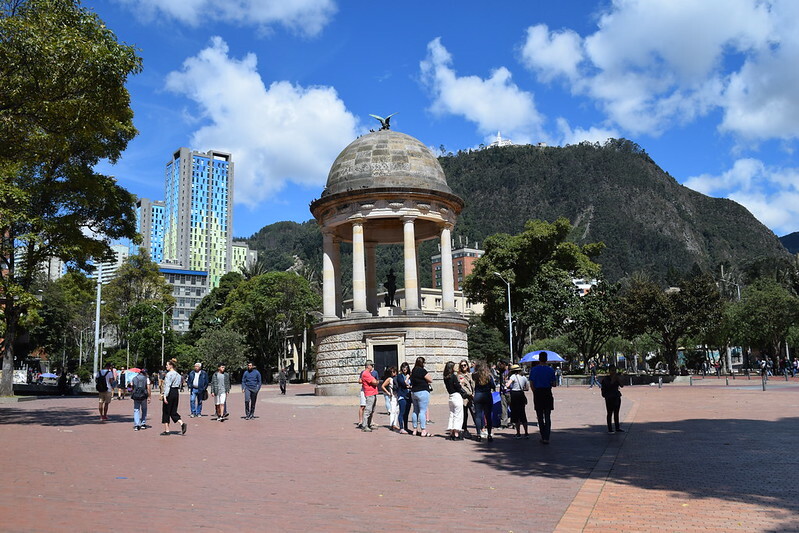 As well, this last Sunday of the month turned out to be the perfect day to explore the city, because after climbing the mountain, we could enjoy all of the museums for FREE. 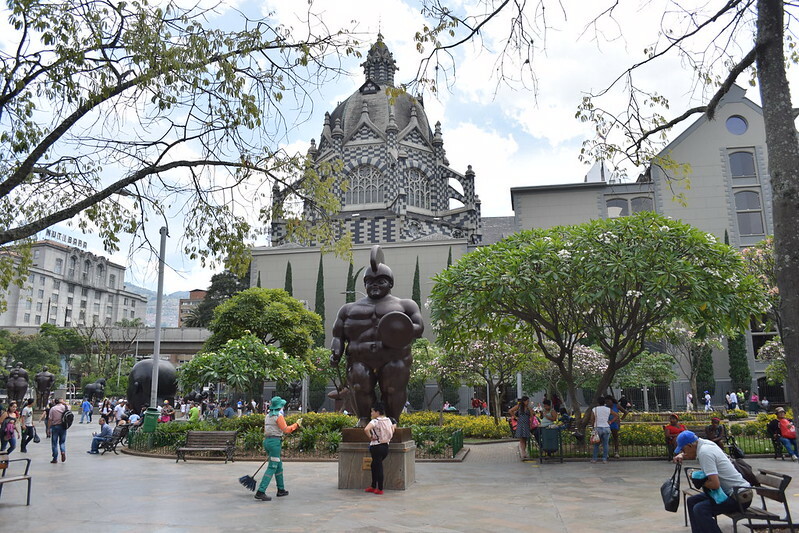 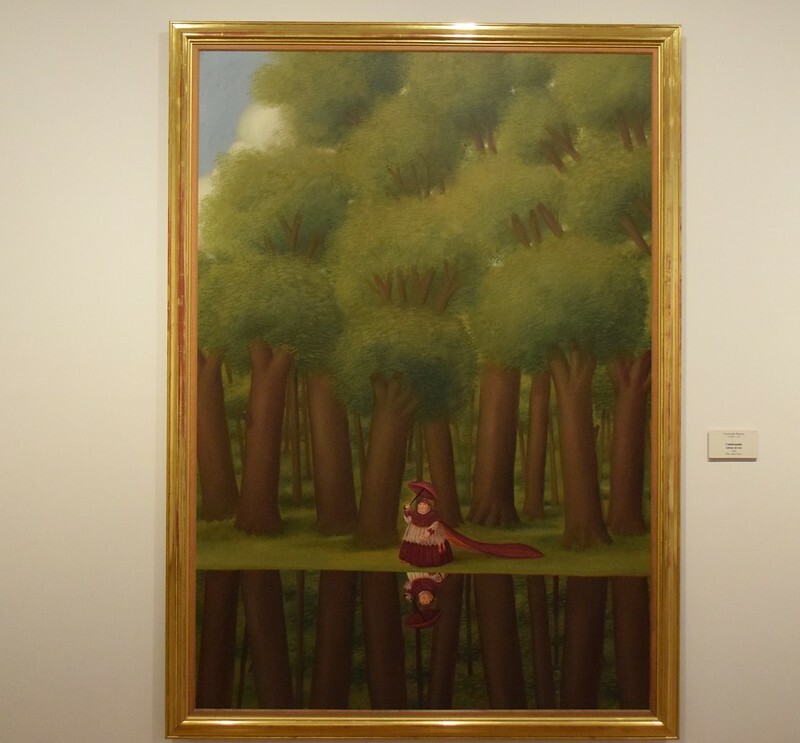 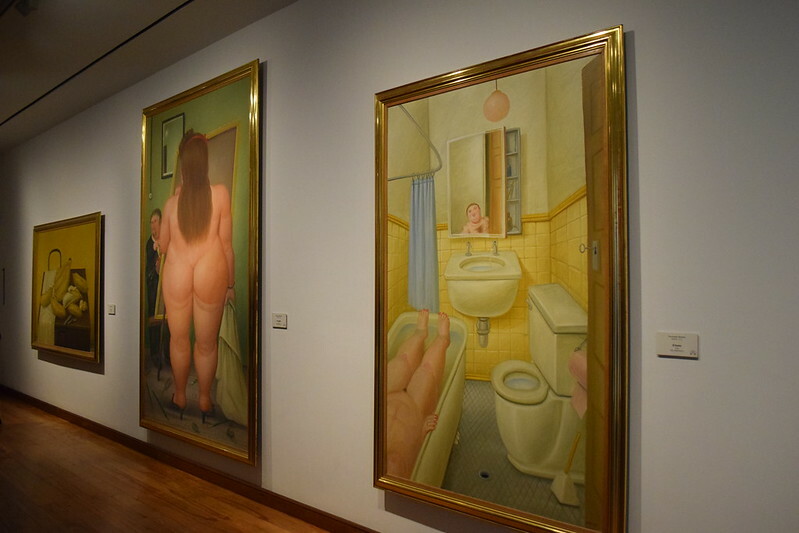 Highlights included the National Museum and the Botero Museum. 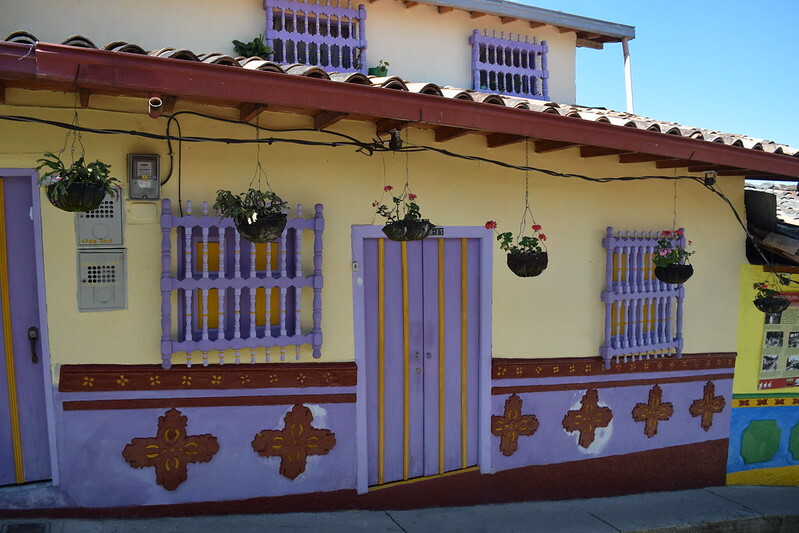 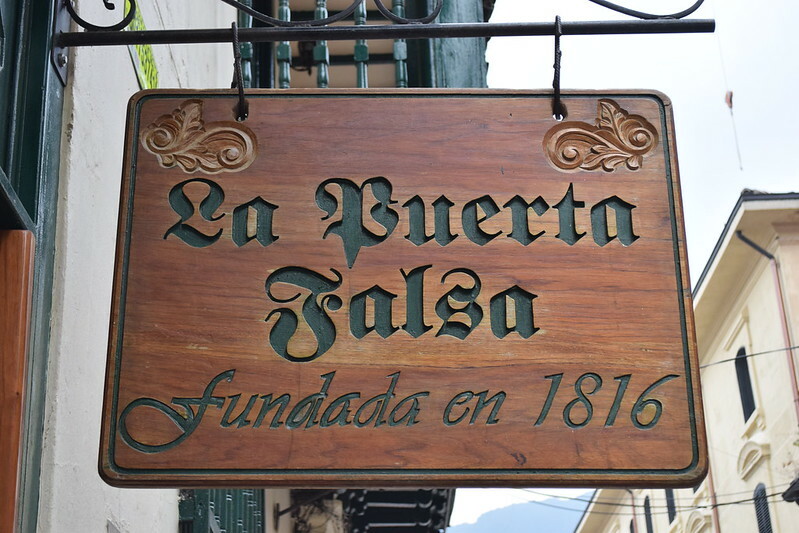 While in this neighborhood, I’d also recommended stopping at La Puerta Falsa.